cws and StClair like this. Was hoping you would post a ride report Pad. Looking forward to the next chapters. Nice report and I liked your previous one on your dealer experience. Did your bike come with a sheep whistle? Cool! . . . well I guess it really was. That is in the works! I need some times to compile it all together from memory, helmet-cam video, and looking over the route again! The above is just a "place-holder" for now. Thanks, the ride details will be coming in a few days! As for the dealer experience, I had also posted a follow-up, but I guess by routine that post was held up by admin, and you won't see it in the thread. The follow-up was to say that I had sent the link to that write-up to the dealer (owner) to give him a chance to read and perhaps dispute my recounting. I received an e-mail back from him that basically backed up his mechanic, and I was rather disappointed in that he thought that I was upset over having to pay that extra money! He didn't understand at all that the problem was with how the supposed damages were evaluated, in particular regarding the valve covers and the cluster holder. I am done with it though. It's in the past, as far as I am concerned now. That it was! I get hot very easily, and my planning for clothes had been oriented toward "what do I want if it gets hot?" Of course, it never got hot but stayed on the cool/cold and very damp side. Overall, not too bad though. My desire to see the Scottish Highland have been on the very top of my “bucket list” for many decades now. It goes back to the days, in the early 60’s, when I was attending Canterbury University in Christchurch, NZ. 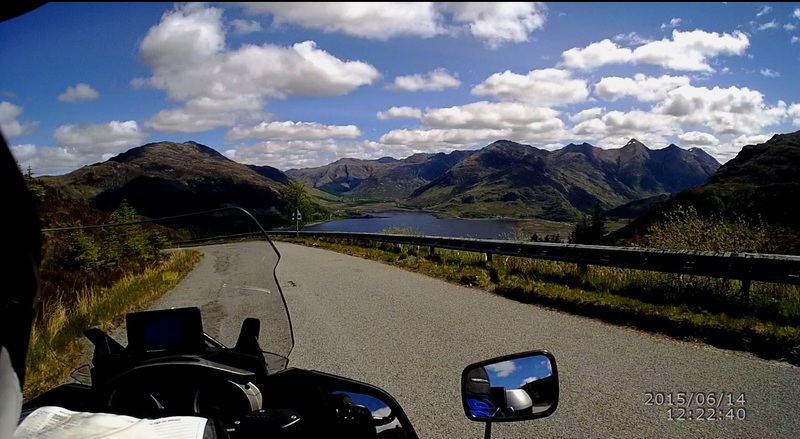 There, I had many friends who were of Scottish descendants, and they all told me that with my interests in motorcycle riding, I need to visit the Scottish highland, and I would find that the countryside there will be very much like what are in New Zealand! Those comments had stuck in my mind since that time, and finally this is my chance to take action and see for myself. I landed in Edinburgh on the morning of June 10, and while waiting for my luggage to catch up to me, I checked my e-mail and received the first disappointment. The 2014 RT will not be available to me, because the previous renter had some “incidents” with the bike. Would I be willing to take other bike? Either a K1600GT or a 2013 RT were suggested, and of course I selected the RT, with a low seat. I just couldn’t imagine manhandling a heavy K bike over the routes that I will be riding on! From the airport, I went directly to the dealership to get all the paperwork and formalities out of the way so that I would be able to get the RT and be on my way right away, early the next morning. Mistake number one, on my part, was that while “inspecting” the RT for previous damages with the dealer’s rep., I was too casual and trusting. In hind-sight, I should have taken close-up photos of the whole bike at that time, but that is another story and I will let it pass. I had brought along my Nav V, loaded with the latest Europe map and my custom routes, with the intention of using it on the ’14 RT that I had reserved. Well, this ’13 RT had the Nav IV mount, and the dealer rep. told me that, from their experience, I cannot use my Nav V in that mount because it will jam in the mount. However, they did provide me with a loan of a Nav IV, at no charge, and loaded my routes into it. Day 01, Thurs. 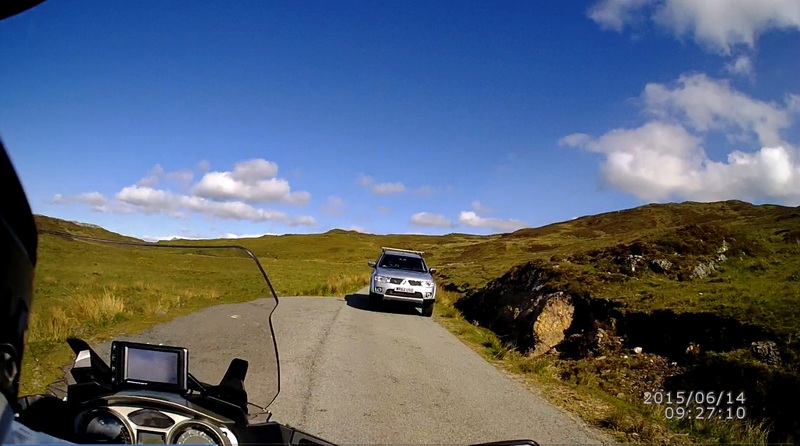 June 11 - Motorrad Central to Kennacraig Ferry, and Port Askaig to Port Ellen (Isle of Islay). I picked up the RT bright and early, as planned, and spent about 15 minutes to load my luggage (pre-packed in two pannier liners); my SLR into the tank bag; water/windproof riding pant liner, walking shoes and rain jacket into the top-box; and then I was off. Very nice bright sunny morning, but there was a definite bite in the air, which my jacket liner did help to keep me from the chills. Turns out that this RT was the 2013 anniversary model, but I was a little surprised that it was a stripped down machine. No radio, which I don’t need anyway, but there were no ESA or ASC either! OK, so I will have to be a little more alerted in my riding, but again no big deal to me. 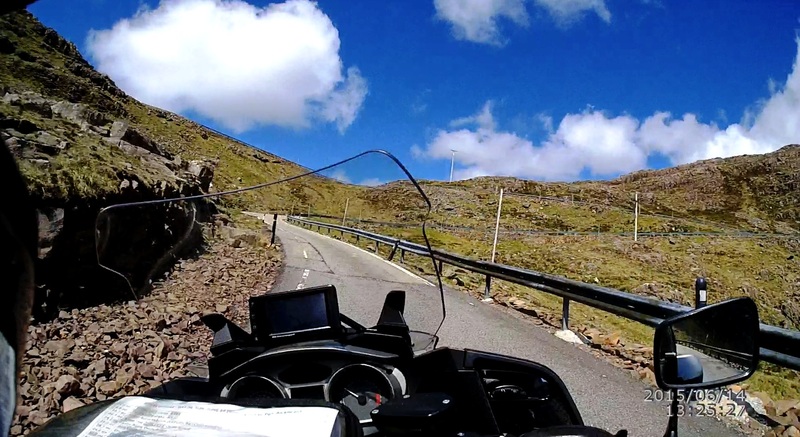 On the other hand, after riding off, I was distracted by the most ridiculously minor things – the throttle cable had a lot of excessive slack in it, and the brake pedal position was a little low. 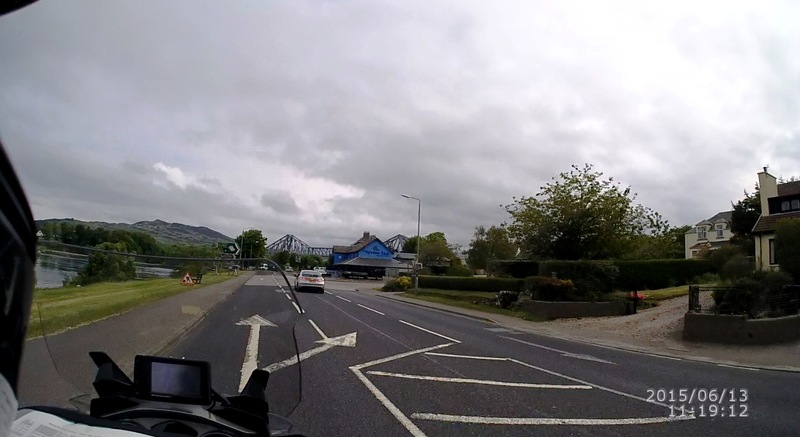 The distractions were enough for me to miss the correct exit on the second round-about, and ended up riding around the area a little, but the GPS got me back onto my route by joining A720, Edinburgh Bypass, a little later along the planned route. Nice 4-lanes divided highway, with 70 mph speed limit, and the traffic was flowing well. Not much further along, the traffic started to slowed down with more volume, and I had my very first exposure to “filtering”, which is quite legal in the UK. I had already noticed that car drivers here were extraordinary courteous (as compared to the drivers on this side of the pond), and when the bike about 5 cars ahead of me started to filter, I followed suit, and noted that drivers in the right lane kept their vehicles to the far right, and those in the left lane kept far left, giving us motorcyclists a nice wide passageway to filter through. Based on the many miles of filtering that I did, I think that this very considerate behavior was their normal behavior on the highway. Generally speaking, drivers over there were very polite and courteous in their behaviors, regardless of whether they were “locals” or visitors. 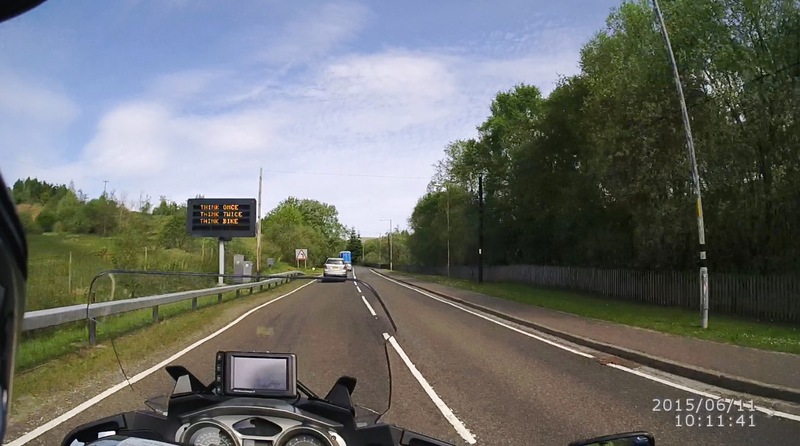 Rode on the A720 bypass to near the end, then changed over to the M8 motorway for a short distance, and to M9 motorway north and west. 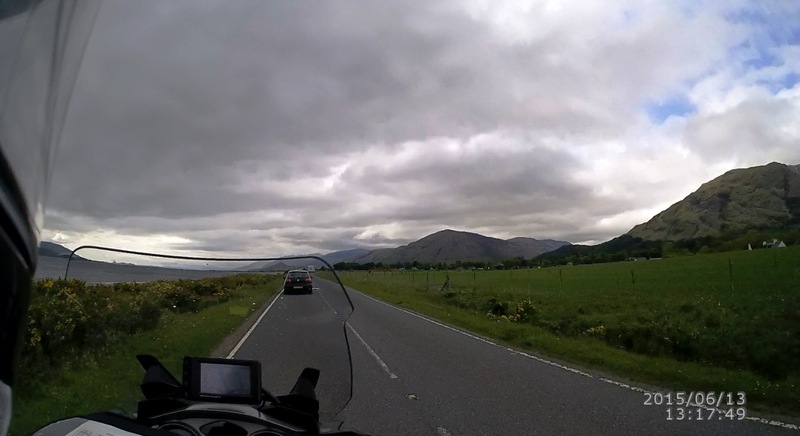 At 70 mph +/- speed, the miles melted away very quickly, and soon I was taking the exit off M9 to head west onto a very nice 2-lanes secondary road, A84. Speed limit on A84 was 60 mph. Let’s pause and talk about speed limits for a little bit. In general, the “national speed limit” is 60 mph. As one rides along on the secondary and smaller roads, one will often see the traffic sign showing a white circle with a black diagonal line across it. This is the sign that tells you that the national speed limit applies. Generally, when one starts to enter the area of a village, or small town, one will encounter a speed limit sign, which over-rides the national speed limit. There will be plenty of warnings (no speed-traps like what you might find in the US), and it is usually a 40 mph limit. If the village is large enough so that the road passing through it is long enough, you may encounter a further reduction to 30 mph. At the other end, regardless of the size or condition of the road, one will usually see the national speed limit sign again. Another thing that I like about the traffic signs over there is the “///”, “//”, and “/” count-down symbols that are used along with the speed limit signs warning you that you are approaching the point when the limit will apply. The same symbols are also used on the motorway to apply to exit markers to alert drivers as to how close it is to the actual exit point. 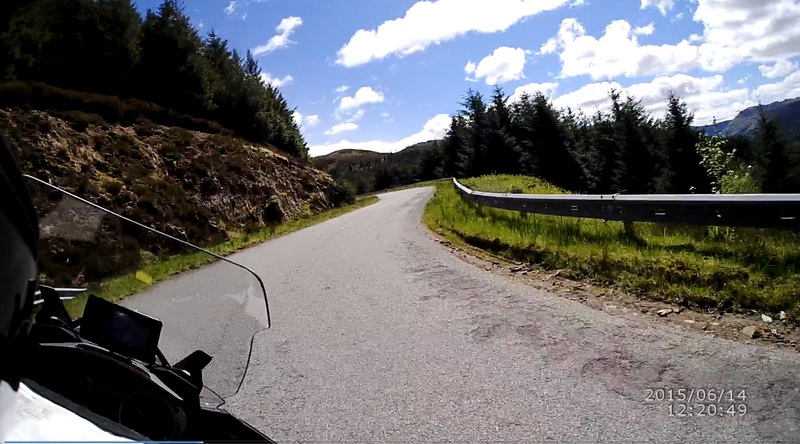 A84 was a very nice 2-lanes major thoroughfare road, which leads into the eastern end of the Trossachs National Park, a very popular recreational area. As I rode away from the motorway, I noticed that the countryside was wide open with estates and farms alongside bracketing the road. Maintaining the 60 mph speed was no problems at all, even with the light traffic on the road. 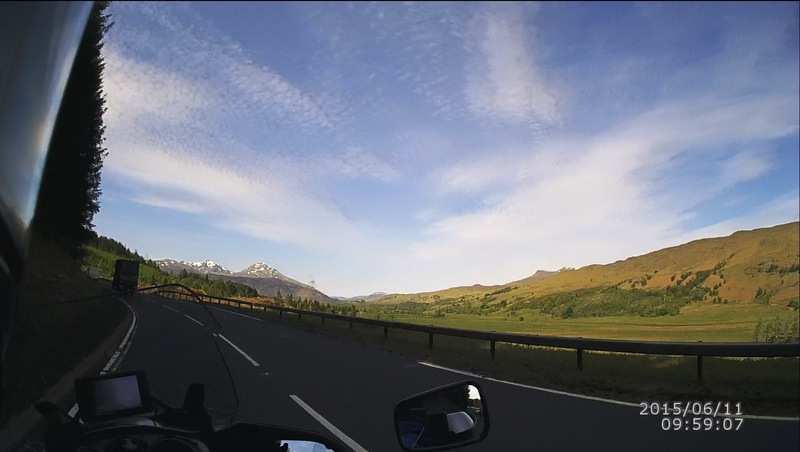 Although the scenery along A84 was very nice, the road wasn’t that exciting for motorcyclists, and so I just rode along enjoying the scenery. So far, everything that I had been looking at could have been anywhere in the US. Very nice, but nothing really special yet. 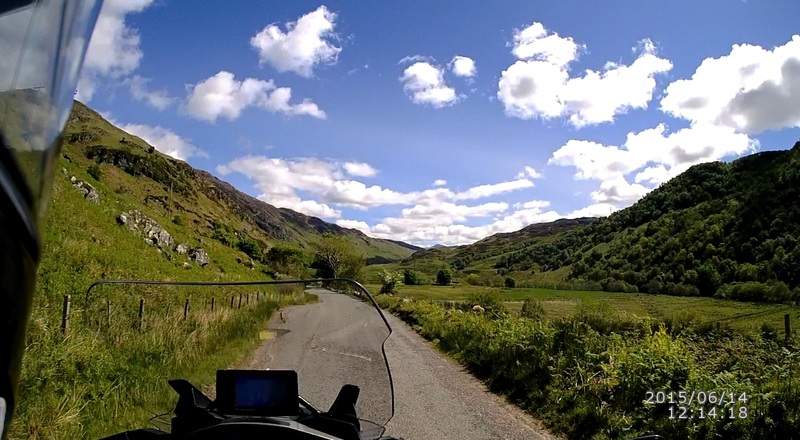 Proceeding along A84, deeper into Trossachs National Park, and away from the villages, the road narrowed down and started to get a few more curves in the road. Sheep makes their appearance in the pastures and on the hillside. 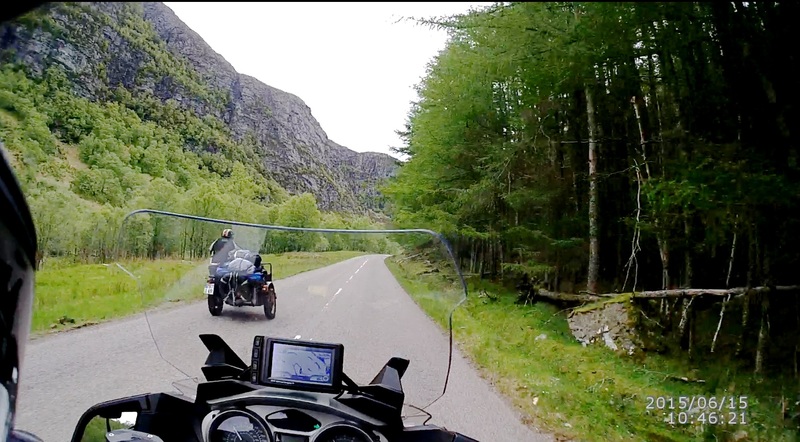 The thing that I noticed right away, once we had gotten into the winding parts of the road, was that car drivers will assume that we, the motorcyclist, will want to ride unhindered! This showed itself by having the car in front of me (and I wasn’t even close behind) signal left-turn on a straight section of the road with no visible ways for the car to turn left! Then, it dawned on me that it was a signal to me to say “OK, you can pass me now!” Sure enough, I was to encounter that signal again numerous times. In addition to that, slower driver of cars, campers, or truck, will often pull aside whenever possible to let the line of traffic behind them pass. Very civilized driving!! It is not uncommon to pass several cars at a time on these narrow and twisty road, and one will find that the car drivers will make room for you to come back into your proper lane in the event that you might have misjudged the distance to the next curve, or oncoming vehicle. You ALWAYS signal your intentions while driving in the UK, without exceptions! One rule that I had learned (by watching) was that when you pull out to overtake on these 2-lanes roads, you signal right, as you would here, but you keep the signal on for the whole time that you are in the oncoming lane, and switch the signal off only when you actually pull back into your own lane. I assume that it is to give maximum visibility of your move, to oncoming traffic. Another thing that made its frequent appearance were signs warning that speed camera are, or may be in used! I never worried about those, since 60 mph in the twisty sections on the narrow roads is plenty fast enough for me, and I did want to take in the sights along the way as well. Hint – one can tell where a camera is actually set up by seeing series of short horizontal painted white lines in the middle of your lane. The speed camera uses these lines to determine the vehicle’s speed, based on the time to traverse these markers. 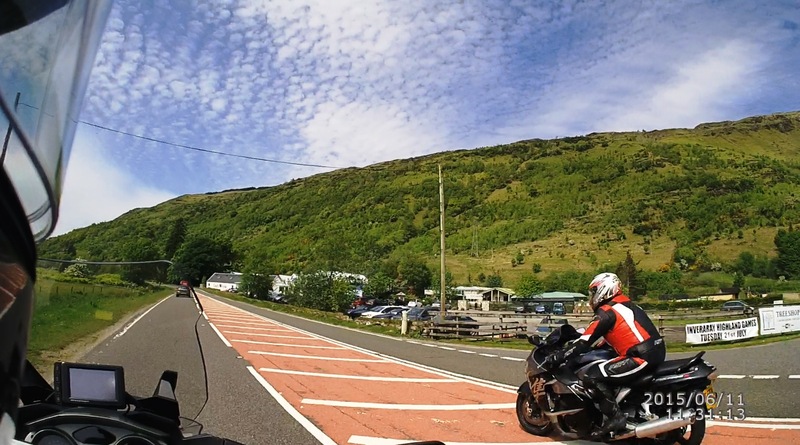 A84 turned into A85 at Lochearnhead (Loch Earn), and I started to see more motorcyclists on the road. Later along A85, the countryside started to look very much like parts of the north island of NZ! Some of the taller mountains (hills?) started to become visible, and there were still patches of white snow on those peaks! 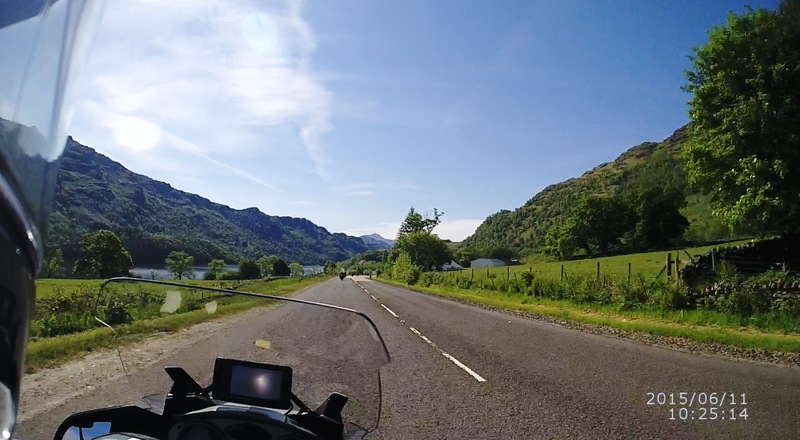 A82, heading down to Loch Lomond was still a 2-lanes road, but narrower than A85 that I had just left, and this is where the fun ride starts! As I headed south, I started to encounter campers, motorcyclists, and cyclists using the road. There were also the occasional trucks coming up the road as well. 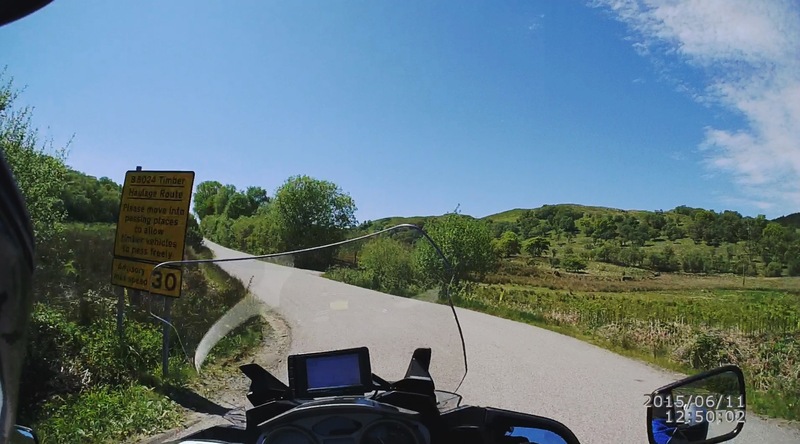 Once the road started to run alongside the River Falloch, which empties into Loch Lomond, the road narrows down to just two narrow lanes with very little edges, and it also starts to wind in series of curves. 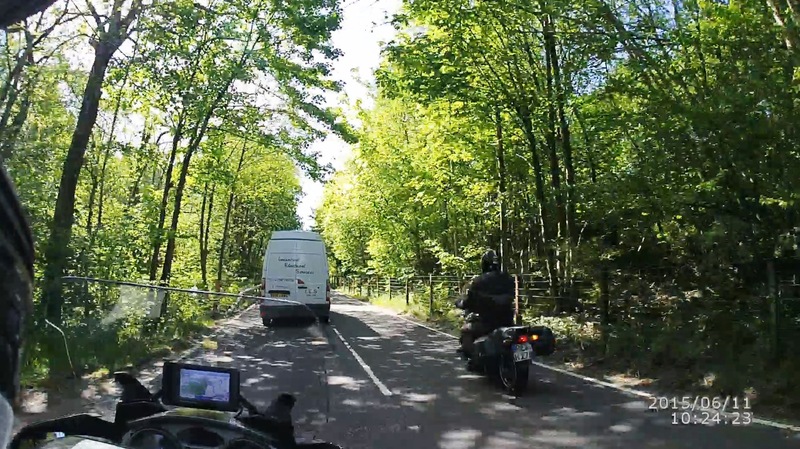 I was just riding along, stuck (or so I thought) behind a van and a couple of cars ahead, but I was enjoying the views, when a pack of motorcyclist came up from behind and zipped right by! Typically, I would see riders that came in packs of four to ten bikes, and very rarely would I see a lone rider like myself. This portion of A82 have a lot of curves, and as I said, was very narrow with large campers and commercial trucks using the road as well. So, you do have to be careful with passing, and even when you have clear road ahead, you cannot be too aggressive in taking corners without seeing what may be approaching. 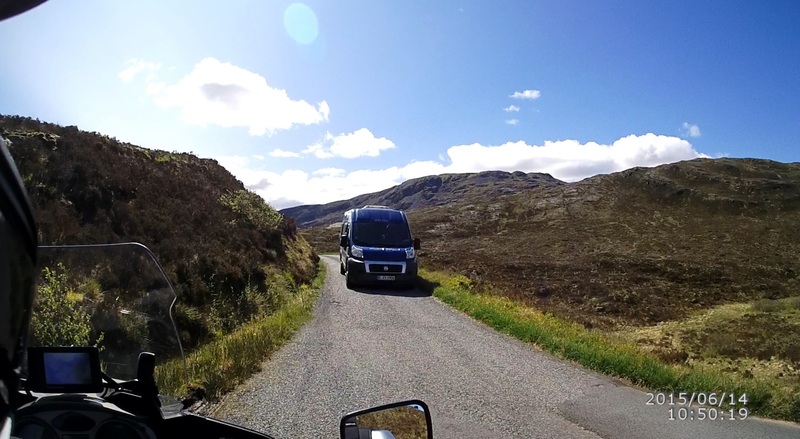 The big trucks, campers and tour bus will often intrude into your lane, because of the narrowness of the road and the sharp bends. There were times when I rode hard and fast around these twisty sections, but had to slack off some, especially when I was leaned hard over, on a right bend, only to see a big truck coming around the corner with its right front fender well inside my lane…..banging into that with my head would be a little painful, I thought as I eased off the throttle and brought the RT a little more upright! When that first pack went by, I eased out onto the oncoming lane and tucked in right behind the last bike and followed their actions. That’s how it’s done! 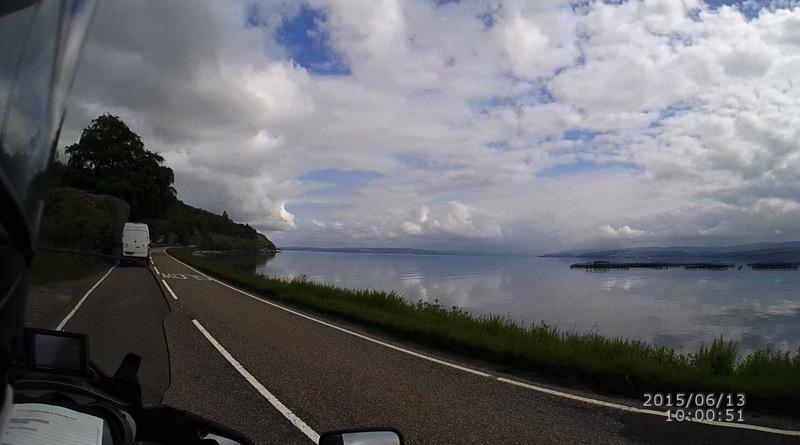 Then, suddenly, what a view….there it was, the north end of Loch Lomond! 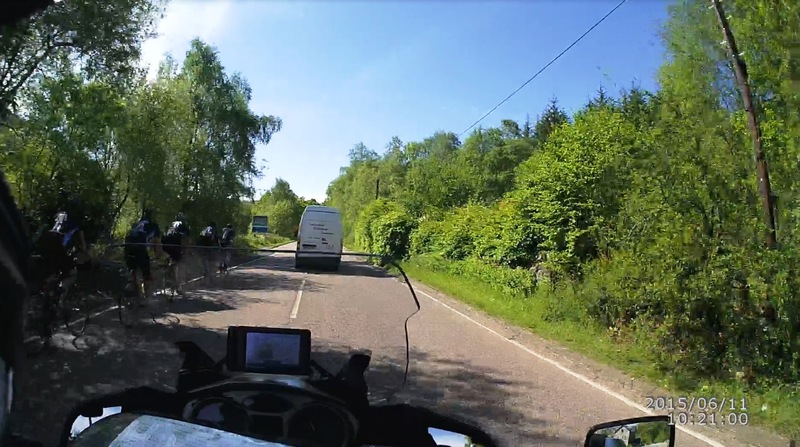 I had a blast playing “tail-end Charlie” to this pack of bikers, and rode right by my planned pit-stop, where I had previously planned to stop for a break and take some pictures of Loch Lomond. Turning around on this road was impossible, especially with the increased traffic as the morning wore on. Nothing to do but to continue for another 10 miles or so to the intersection where I would leave A82 and Loch Lomond for A83 and points west. I also knew that there was another parking area that might be suitable at the intersection, and if not suitable, it would be a good place to turn around and backtrack to my original planned pit-stop. So, I rode on and caught up to the pack again. Last edited by PadG; Jul 8th, 2015 at 9:38 am. Whoa! Luckily, I was right next to the road’s center line, and it was just a quick flick of counter-steer to get me rapidly onto the correct side of the road! I thought that I had resolved this riding-on-the-left issues, but clearly it was a mistake to take my mind off riding even for a minute. From that point on, I always paid particular attention to making right turns, and very conscious to make sure to go to the far lane whenever I did make such turns! Soon, I was back on the road and off again. I wanted to make sure that I got to the ferry at least an hour before departure time of 3:30 pm, and not knowing the conditions of the road or traffic ahead, I did not want to waste any time. 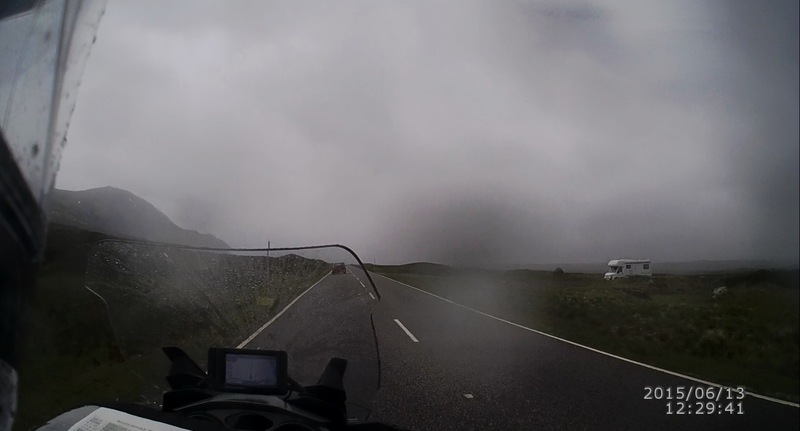 Retraced my route back to the junction of A82 and A83, then headed west on A83 toward Loch Long. 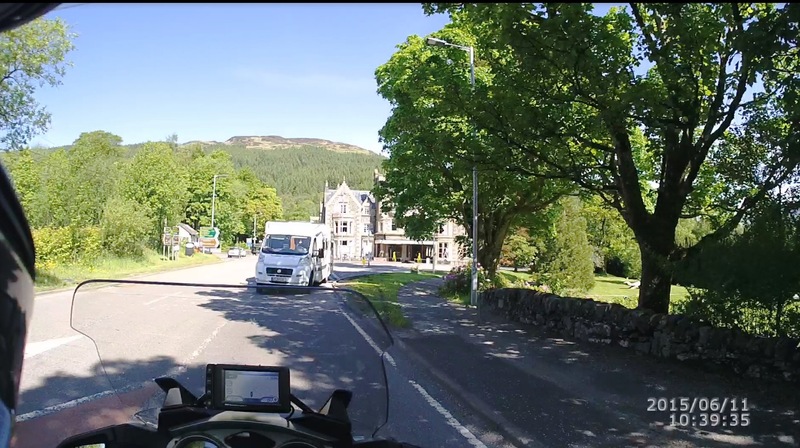 Initially, I had planned on stopping at Arrochar (on Loch Long) for lunch, but I was not hungry at all, and so kept on riding through town. 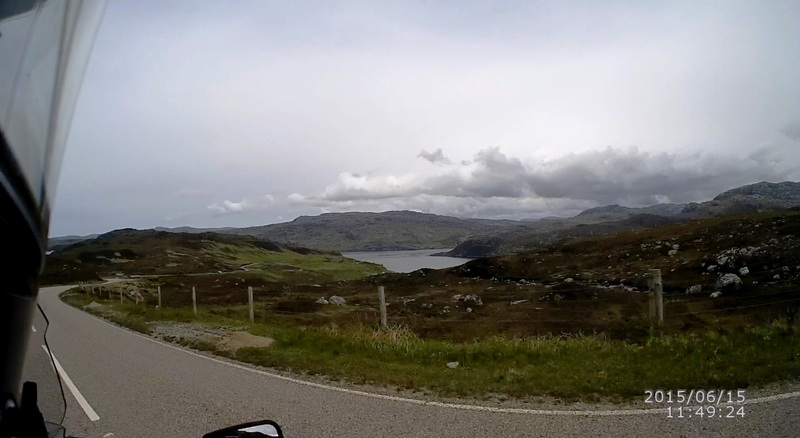 A83 was a very nice road, with lots of high-speed curves once the road cuts away from Loch Long and into the hills. The Nav IV yelled at me a few times when I was riding a little fast or was accelerating hard in areas that were tagged in the GPS map as being speed camera areas, but it was very hard to resist accelerating up these up-hill sweeps with clear road ahead. Too soon, I was on the downgrade behind a line of traffic leading into Cairndow, on the shore of Loch Fyne. 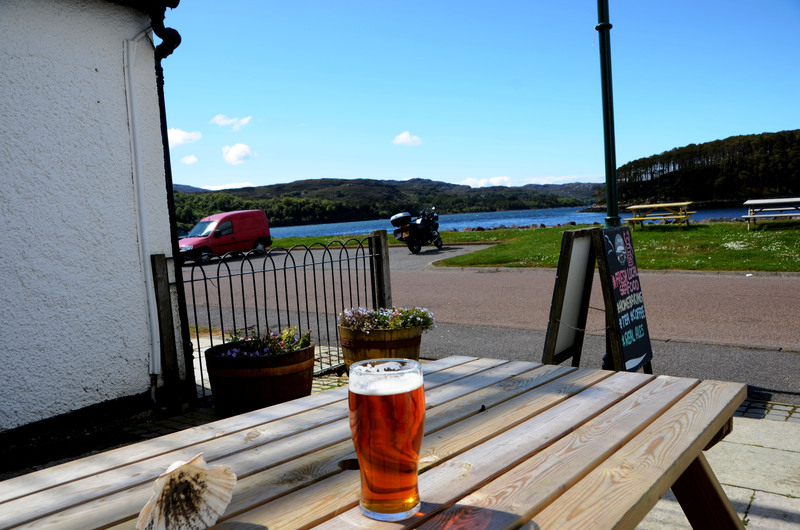 A83 exited Cairndow and made a loop around the north end of Loch Fyne, and I caught sight of Loch Fyne Oysters, a purveyor of oyster, salmon, and other seafood, with onsite restaurant. I made a promise to myself that the next time that I pass by, I will stop for a meal! I was so engrossed with absorbing the view and looking at the restaurant (right), that I didn’t even see this guy who had come up fast behind me! No, that was not a legal pass, and this was only the second time that I had witness a motorcyclist behaving in this reckless manner! Reminds me of the “squids” that we have here, but this riders did have good riding skills and wore the proper riding gears (vs. no-helmet, shorts, t-shirt, and flip-flops!) On second thought, this may have been the same guy that I had seen earlier on A82 along Loch Lomond! 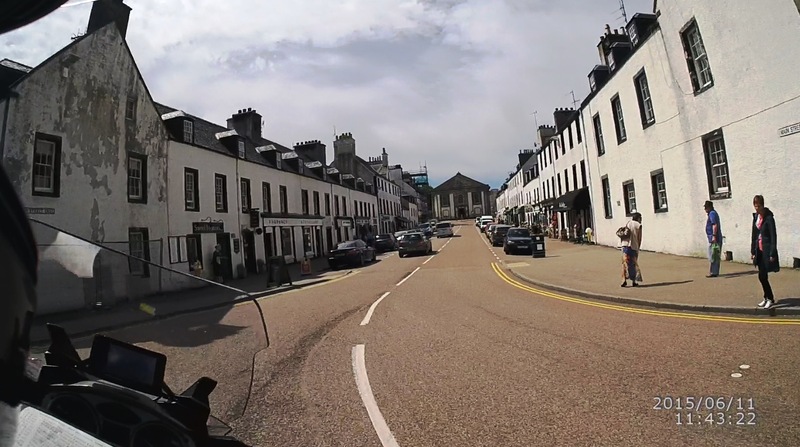 A few miles past Inveraray, A83 started to angle away from Loch Fyne, and headed more in the westerly direction, but only to angle back to the shore again around the town of Furnace. 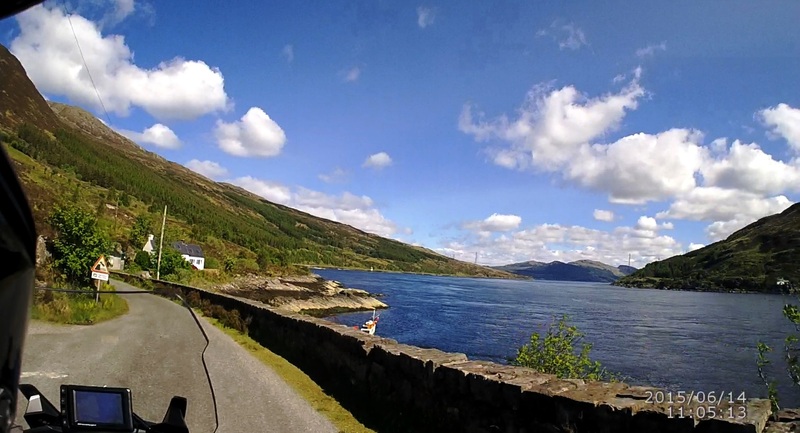 In actual fact, A83 runs either along the shore of Loch Fyne or parallel to it. 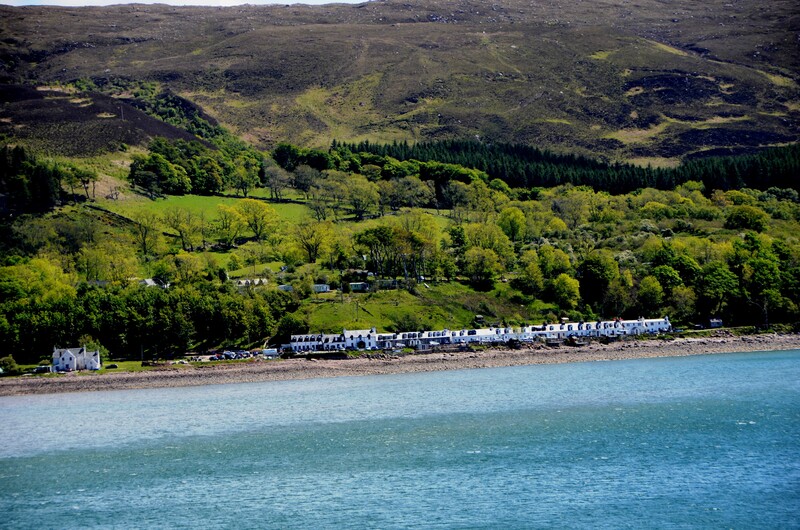 Note: Loch Fyne is a salt-water loch, and extends about 40 miles inland from the west-coast of Scotland. 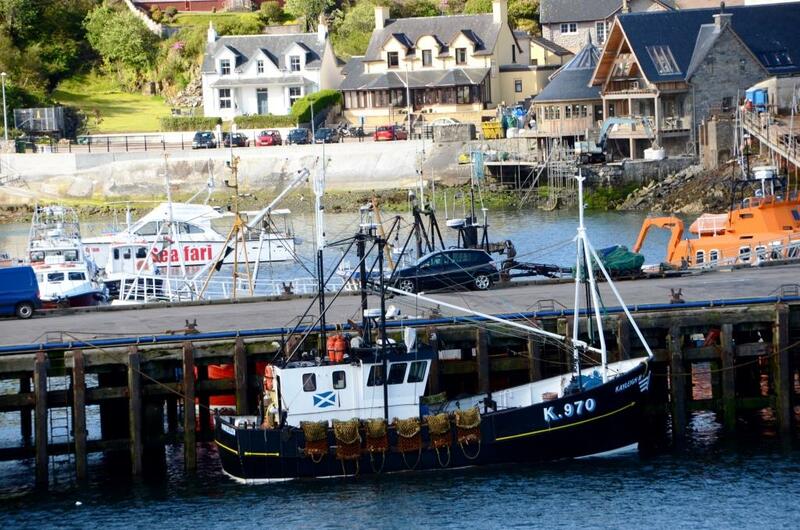 At Lochgilphead, I stopped to refuel. Kennacraig was not far away now, and I wanted to make sure that I arrived onto Islay with the maximum amount of fuel in the tank. My first experience with fueling in Scotland! At the pump, there were three separate hoses. The black one was for diesel (I had been warned about this one! ), and the other two were green with one marked for “Unleaded” and the other one marked “Supreme Unleaded”. Of course, the last one is what I used for the RT, but it should be noted that this was the very last time that I will encounter the “Supreme Unleaded” hose! All of the other stations that I was to stop at, for the next six days, had just diesel and unleaded! 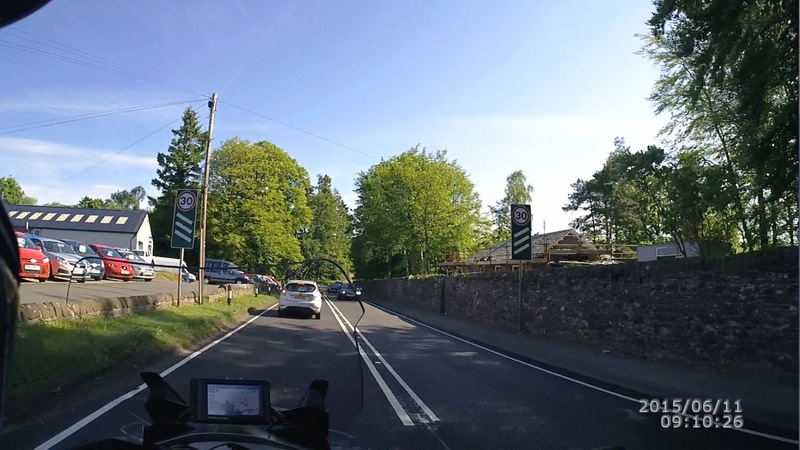 After refueling, I followed A83 through town, and followed it as it turned left down the coast of Loch Gilp (pretty much an extension of Loch Fyne). Shortly after heading south along the coast, I made a short stop in the little village of Ardrishaig, to take some photographs. 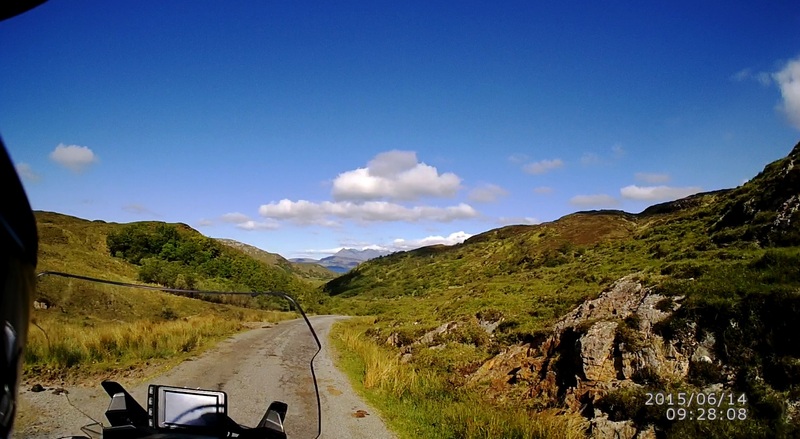 Somewhere, on A83 north of Tarbert, I departed from A83 to take a short-cut to bypass the little town completely, and hence encountered my first exposure to single-track road – a logging road! I did not encountered any oncoming traffic until very close to reaching the other end. Soon, I was back on A83 again. 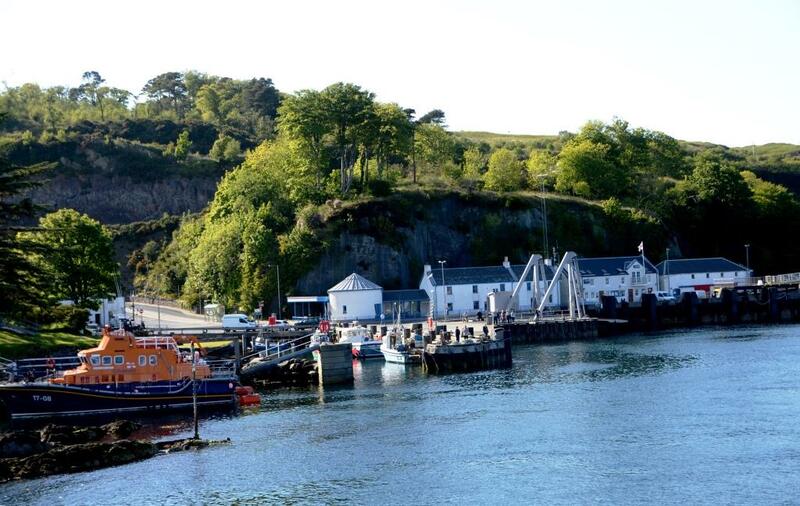 In hind-sight, I should have gone into Tarbert and spent some time just sightseeing! I was far too early for the ferry, having missed stopping for lunch and had made a very good time with the “spirited riding” along the way. It was barely 1 pm at this point, and Kennacraig was just a couple of minutes away. I arrived at the ferry terminal before 1 pm, and the 1 pm ferry was still at the dock, about to depart! Motorcycles got to board the ferry first, and are one of the first to get off at the other end as well. 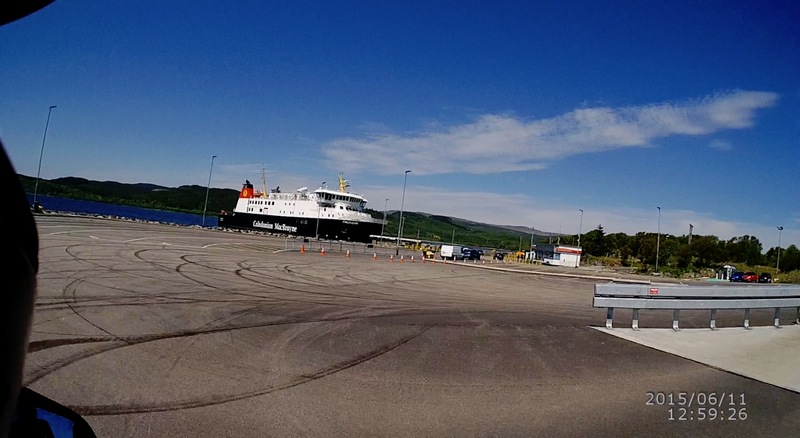 At Kennacraig, the ferry docked bow-in, and on boarding I was directed to park at the stern of the boat. I was the only motorcycle to board. The RT was parked on side-stand and in 1st gear. A crewman placed a thick pad over the rider’s seat, and strapped the bike down with a single strap over this pad. 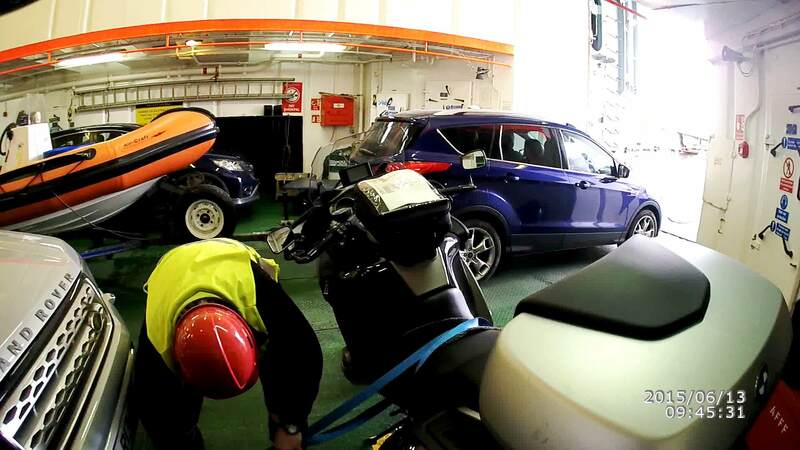 Just before departure, there were a few cars and a couple of motorcycle that tried to leave on this ferry on stand-by basis. They all made it! 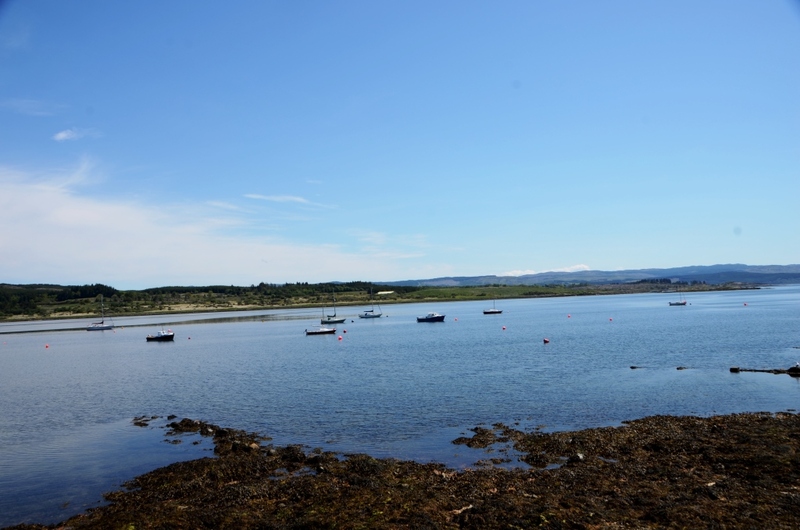 The trip over to Port Askaig (Isle of Islay) took two hours, and the sea was dead calm. Not even rolling swells. 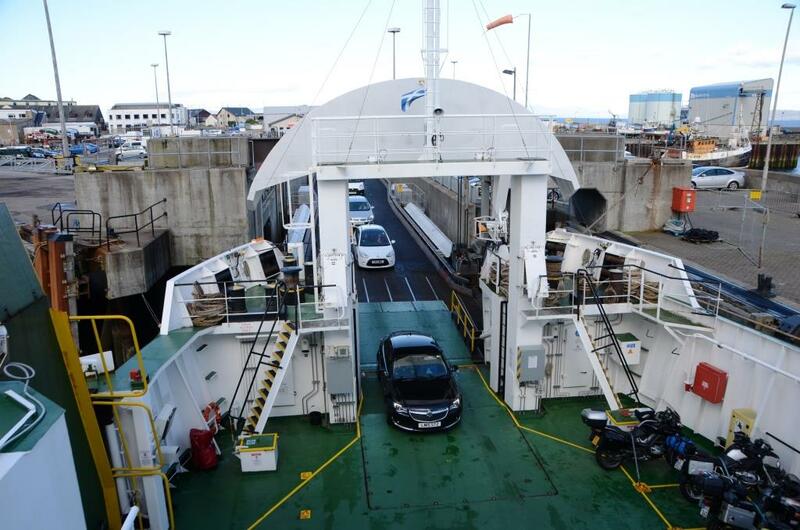 Here, the ferry docked stern-in, and so all the vehicles can simply drive straight off. Disembarking was fast, and I was third off, after a big truck and a car from the center of the boat had gotten off and left room for me to back up and leave. 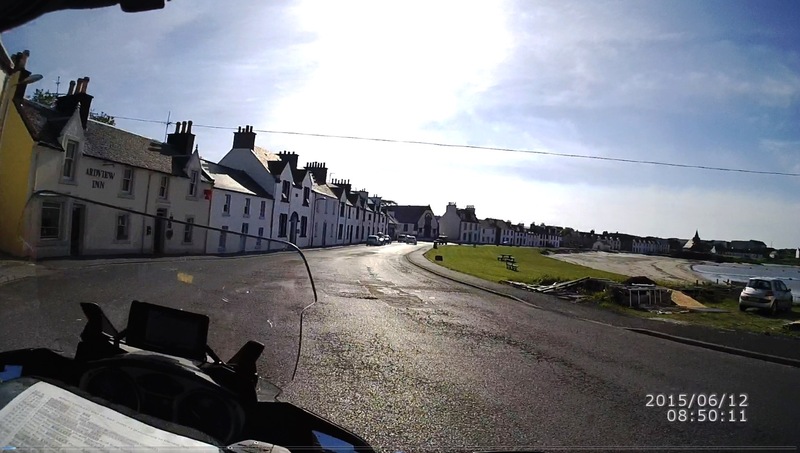 The ride to the Islay Hotel in Port Ellen was fairly quick, with just one car ahead of me off the ferry. The time was just after 6 pm, and the weather was excellent with bright sunshine. 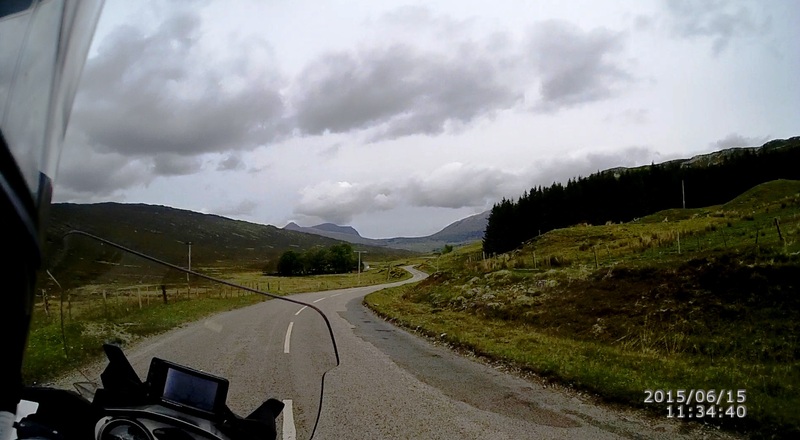 The road leading from Port Askaig, A846, was a narrow two-lanes country road, but it was in fair condition considering the amount of traffic that must have gone over it every days. 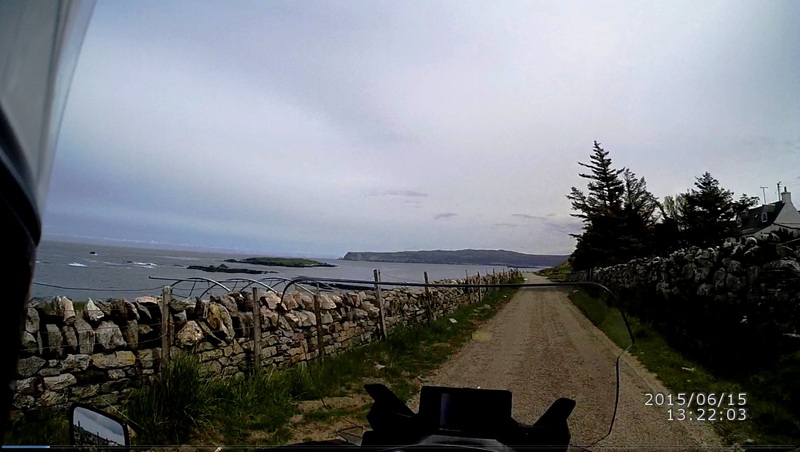 I rode on that road for about 9 miles, before branching off to the left onto B8016, a 10 miles stretch of single-track road that led directly to Port Ellen. There were quite a bit of traffic on this road, and I had my chance to practice the rules of riding/driving on single-track roads! The car in front, on the single-track road, pulled over into a passing place to let me pass! The general rule on single-track road is that, the one who reaches a passing place first is the one who gives way by pulling into the passing place if it is to one’s left or stop beside it, if to the right. Overall, it had been a wonderful day! 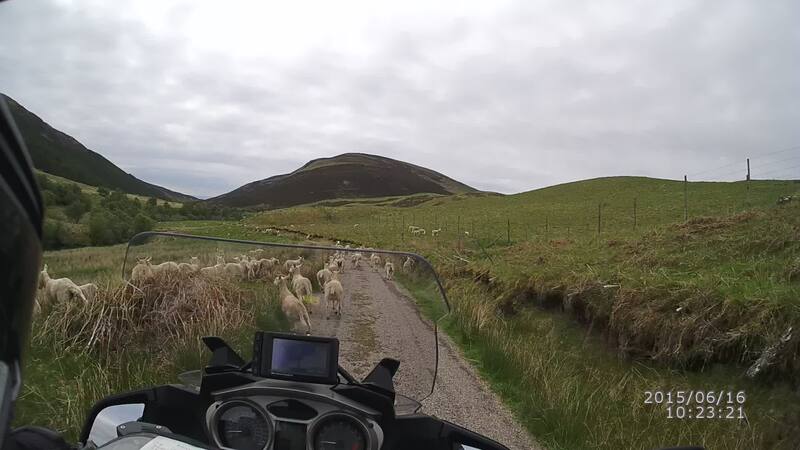 Day 02, Friday June 12 – Isle of Islay. This day was supposed to be a relaxing day, with the only thing that I had planned was to visit the Lagavulin distillery, less than five miles away, at 9 am to register to attend a “nips and nibbles” session (pairing Lagavulin’s different single-malt with food) at 4:30 pm, and to tour the distillery at 9:30 am. Good opportunity to try to catch up with the time difference between EST and GMT! At this time of the year, sunrise was around 4:40 am, and so the sky had gotten quite light very soon after 4 am, and there were no ways that I would be sleeping! Therefore, I was one of the first one to be in the dining room for breakfast. Knowing that I will be relaxing and will have plenty of time to have a good lunch as well as dinner, I decided on a smaller breakfast, and ordered the very classic smoked Scottish salmon and scrambled eggs. That turned out to be fantastic! The smoked salmon was very much like our Nova Scotia lox, but just a little saltier. A fold of the salmon on your fork with a clump of scrambled eggs was quite exquisite! 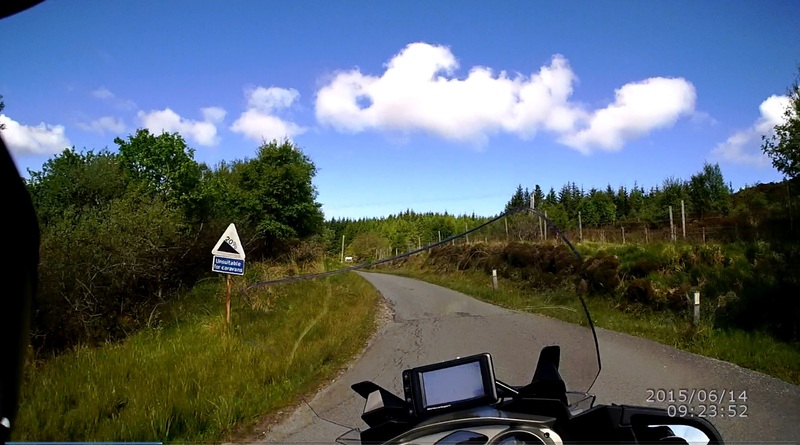 Got on the RT a little before 9 am, and rode over to the distillery, along the small country road, A846. 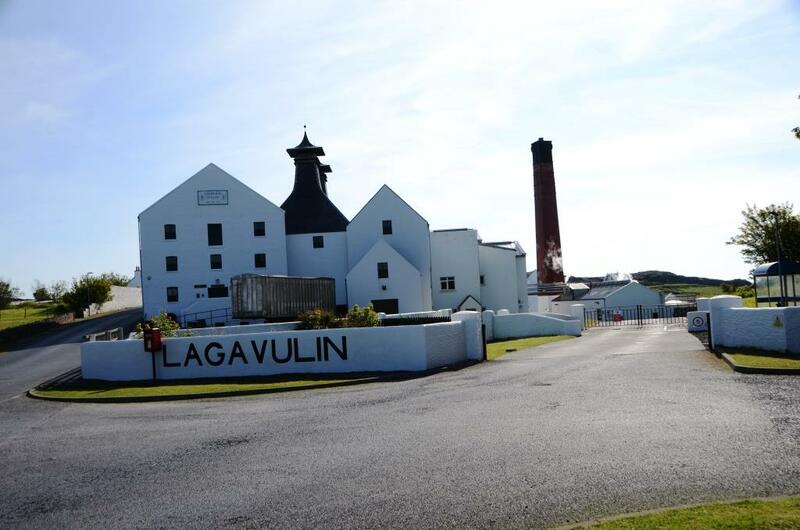 Lagavulin is a small distillery with just 4 stills. Two for the primary distillation, and two for the final. 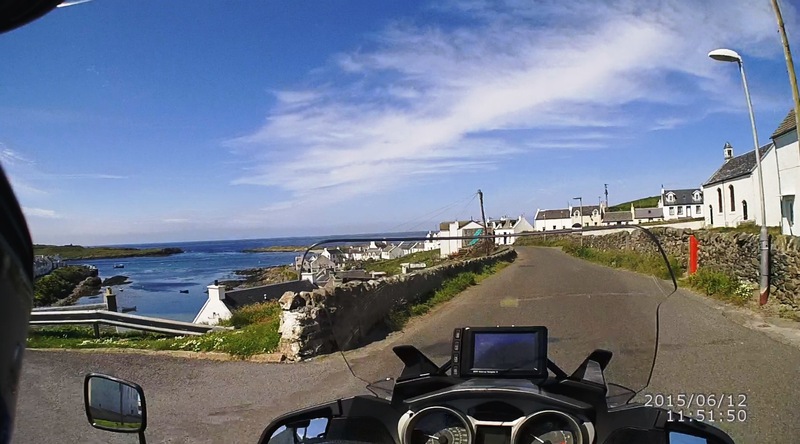 After the distillery tour (no pictures allowed), and a tasting, I got back onto the RT, and planned to ride to the westernmost end of the isle, to a little town of Portnahaven, to have lunch at a little pub (An Tigh Seinnse) that I had scouted out online. 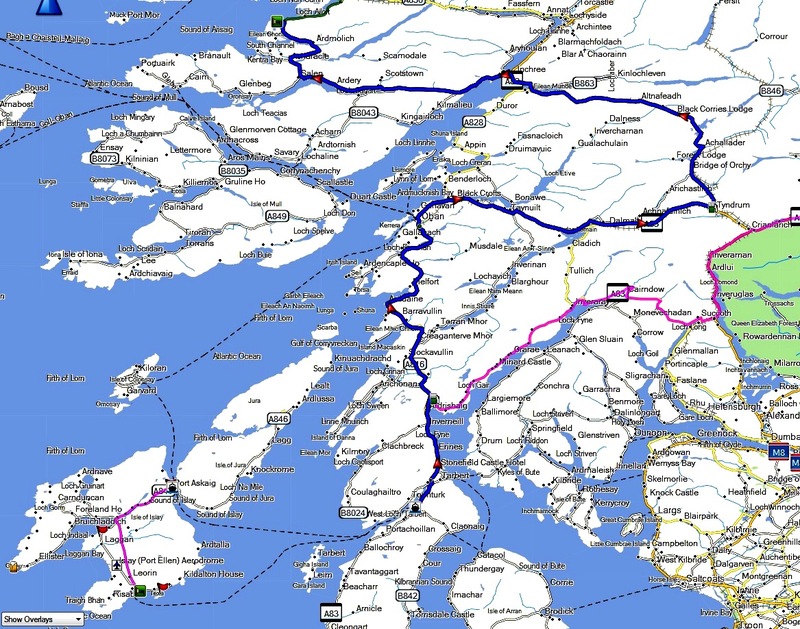 So, backtrack on the little A846 back to Port Ellen, and then north toward Port Askaig along that nice single-track road, B8016. B8016 met A846 again just south of Bridgend, and I was supposed to turn left onto A847 just a little further north of Bridgend, to head toward Port Charlotte. Missed the turn! Darn! 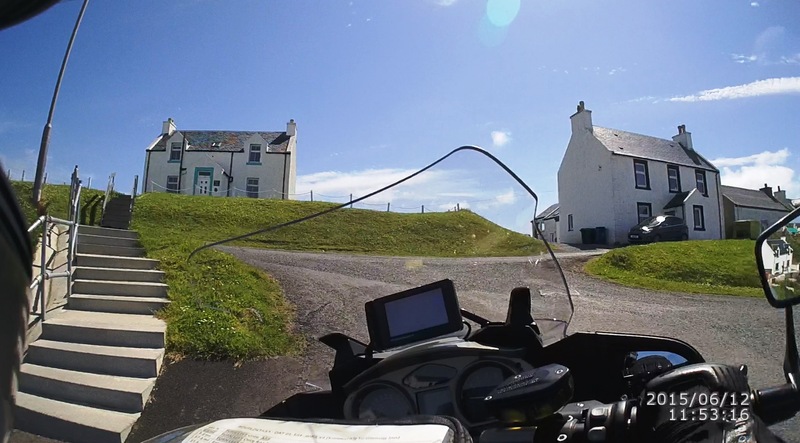 Fortunately, since I had scouted out the area on Google Map, I knew that there was a tiny little road just a hundred yards or so, that would lead me into an area marked on the map as Islay House, and from there I should be able to exit on the other side onto A847, where I wanted to be. I did find that tiny road, which looked like somebody’s driveway, but I was fairly confident that it was a public road. It was indeed a road, but in a fairly bad state of repairs. I was dodging potholes all the way, but did finally emerged onto A847, and was on my planned route again. 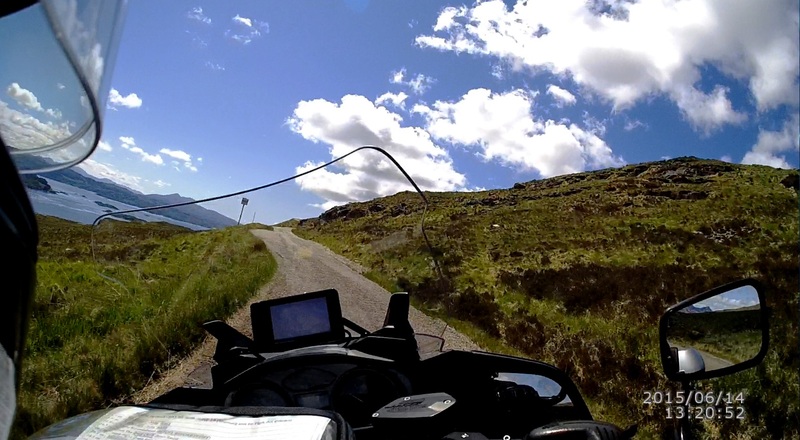 You definitely don’t want to try riding this road unless you are comfortable with extensively riding and maneuvering the RT at low speed, and riding on gravels and rocks at times! 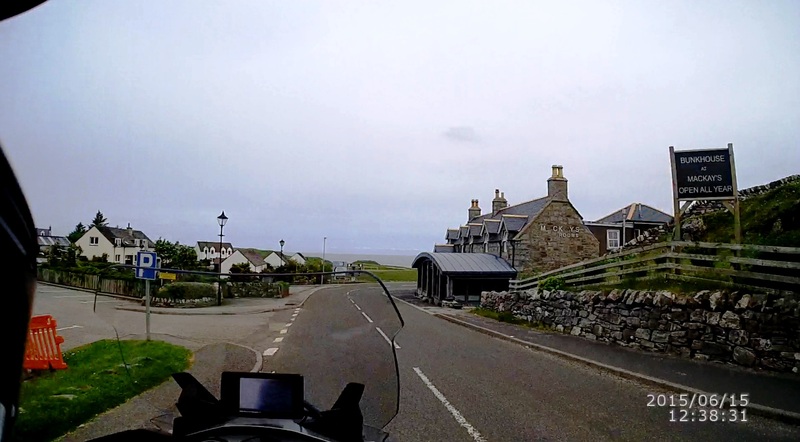 A847 was a very nice 2-lanes country road that hugs the seashore as it wound its way through the little village of Bruichladdich, and Port Charlotte. 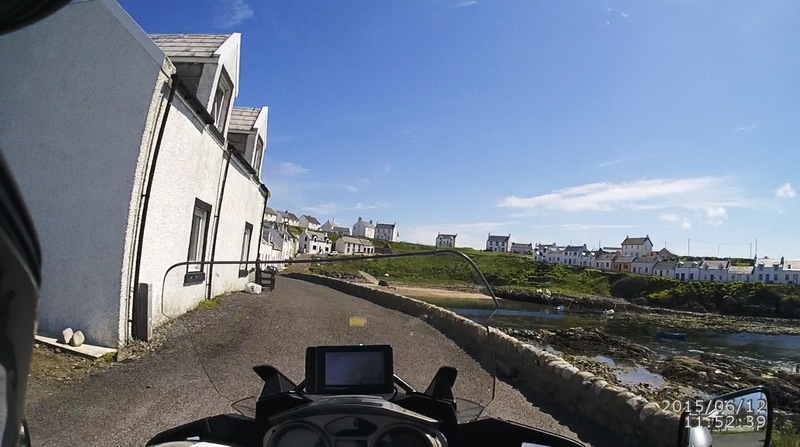 At some point along the way, after Port Charlotte, the road turned into a single-track road and stayed that way all the way into Portnahaven. 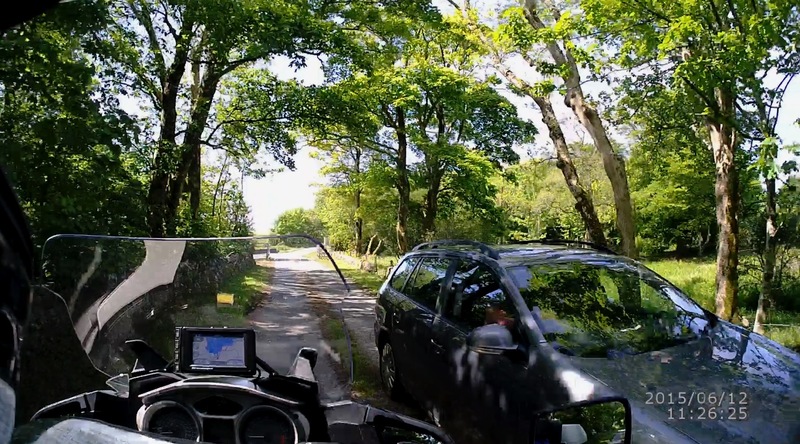 So, a quick decision…..turn left at the bottom and get out of there! In hind-sight, after looking at the video, I could have parked where I had originally planned, and would have been quite fine! Oh, well, those are the things that one only see later with the kind of technology that we now have! 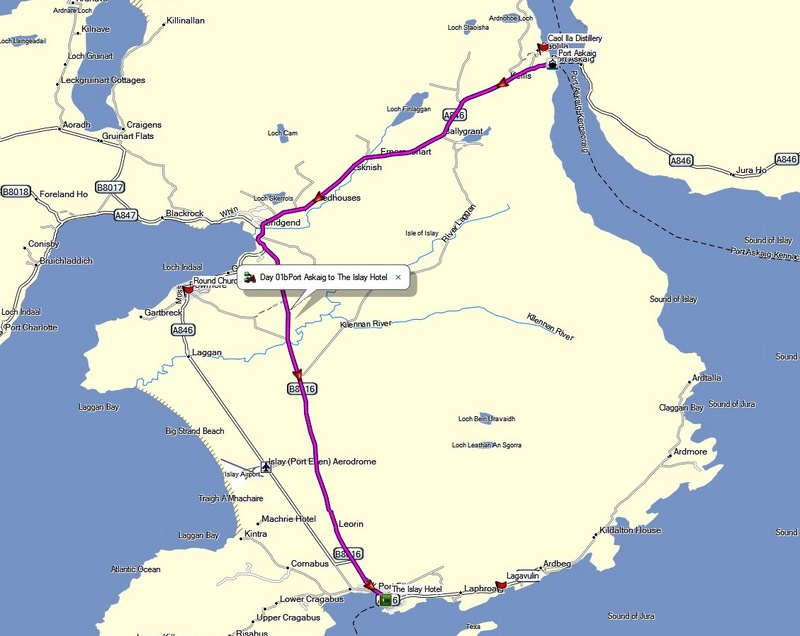 So, it’s back-tracking out of Portnahaven, through Port Charlotte, and so on. 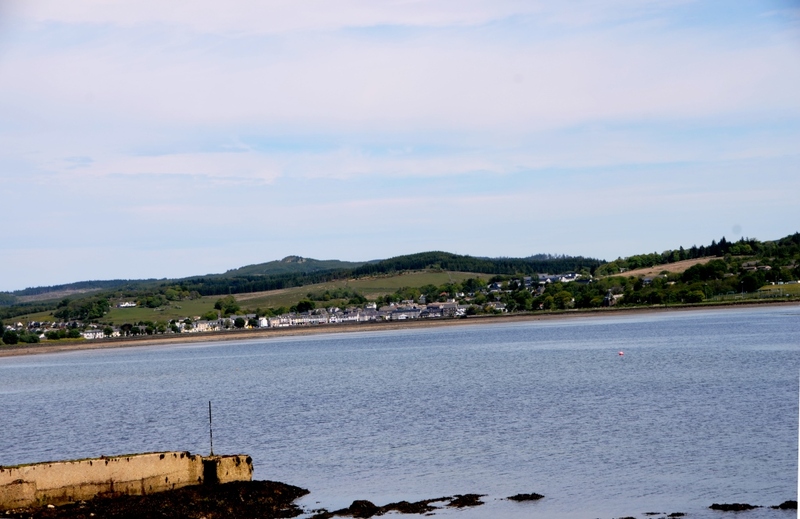 Plan “B” was to find a place for lunch in another town that I had planned on visiting as well – Bowmore. One thing that I have to say about transportation in the UK is that, no matter how remote one might be, there seem to be public transportation! 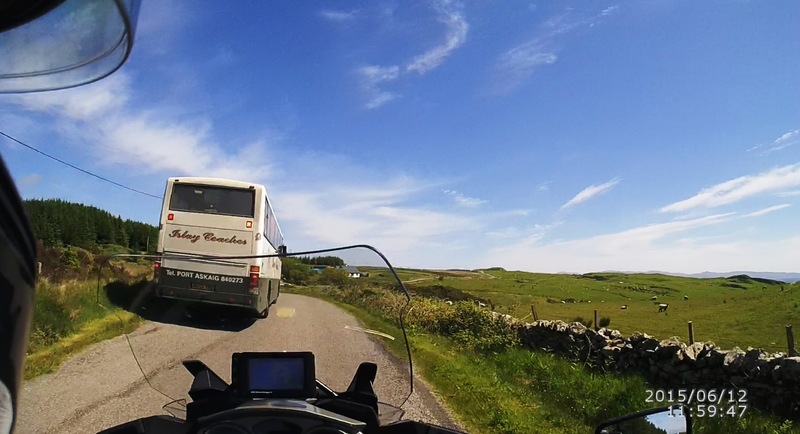 I had followed this bus out of Portnahaven, and here the driver had found a spot where he politely pulled over to allow me to pass! 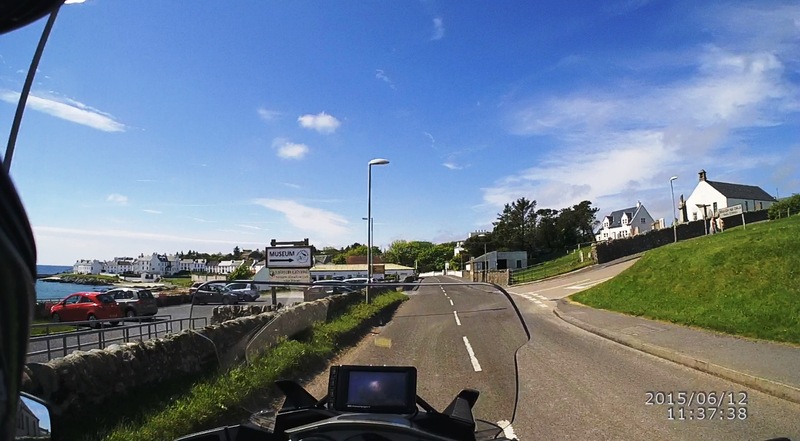 After lunch, and after looking around Bowmore to take some photographs, I rode back to Port Ellen. Clouds had started to accumulate, which fits the forecast of potential wet weather for the next day! Got back to the hotel with a couple of hours to spare before returning to Lagavulin, and decided to use the time to pack up, since I expected to be up very early the next morning to catch the 7 am ferry from Port Askaig. Great write up. Makes my mouth water. Thanks! Much more to come yet. Gotta ride when I can, rather than sitting inside compiling ride reports!! Looks looks like a great trip, thanks for the photos. How long did it take to get use to riding on the left side of the road. It was fantastic! I am still working on day 3 through 7, which were a lot more exciting than the first couple of days. Learning to ride on the left is not hard, BUT as I mentioned in my day one write-up, at my age, I have to pay attention to riding at all time, in particular while making a right turn at intersections! 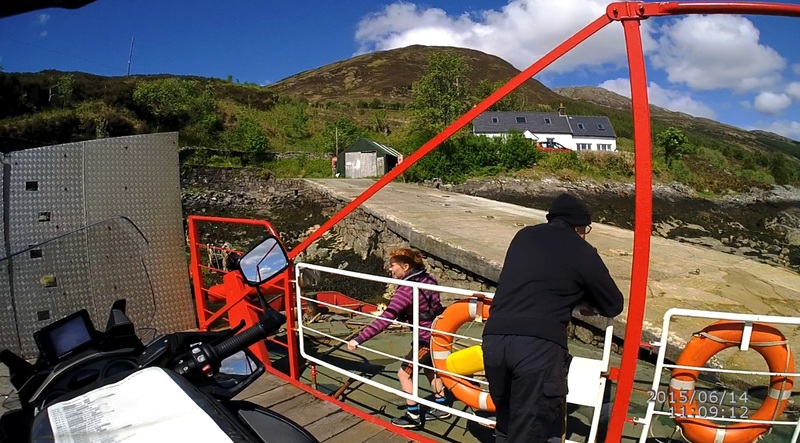 I had a ticket for the first ferry leaving Port Askaig at 7 am, and so I had gone to bed fairly early the previous night. I had left my window curtain fully open to make sure that the morning light will rouse me, and it certainly did. Sunrise was around 4:40 am, and so by 4 am there was enough light to wake me up! Originally, I was planning on getting up at 4:30 am and be out of the hotel by 5:30 am at the latest, but I got out of bed as soon as I was awake, and was away by 4:30 am! I am the type that prefers to be early for anything that were scheduled for me! 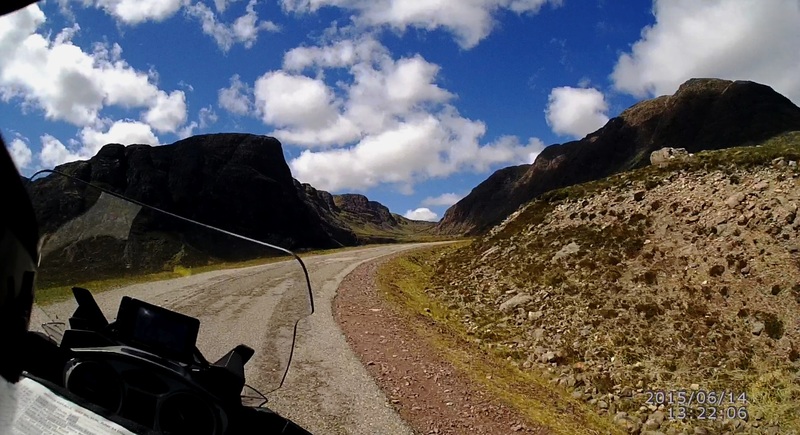 The ride north to Port Askaig was very peaceful. The sun was rising over the hills, and the morning was very quiet. I did not think it unusual to have encountered a couple of cars heading south, as I headed north on the single-track road, B8016, as it nears the intersection with A846. I was really enjoying the serene morning, and some of the wildlife that I saw alongside B8016 – a couple of little fallow deer. I knew that I was really early, and so I just rode along quite leisurely. 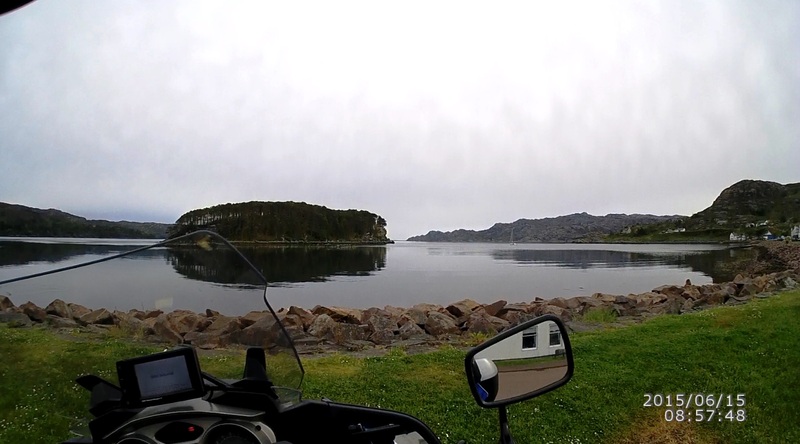 Port Askaig was quite deserted, when I arrived at 5 am, but I figured that I was very early for the 7 am departure. It was a little strange though that the ferry boat was not at the dock! I pulled into one of the staging lane for boarding vehicles, and stopped at the front end, and parked. The ground was slanted to my right, and when I put the side-stand down, the RT seemed to be sitting a little too upright, but sufficient stability was achieved when I turned the handlebar to the left lock, and so I dismounted. As I did so, I saw a car pull out from the overnight parking lot, and pulled in behind me. Another fellow traveler who also liked to be early, and apparently had been waiting in the parking lot. A very nice couple who had been staying at Portnahaven. 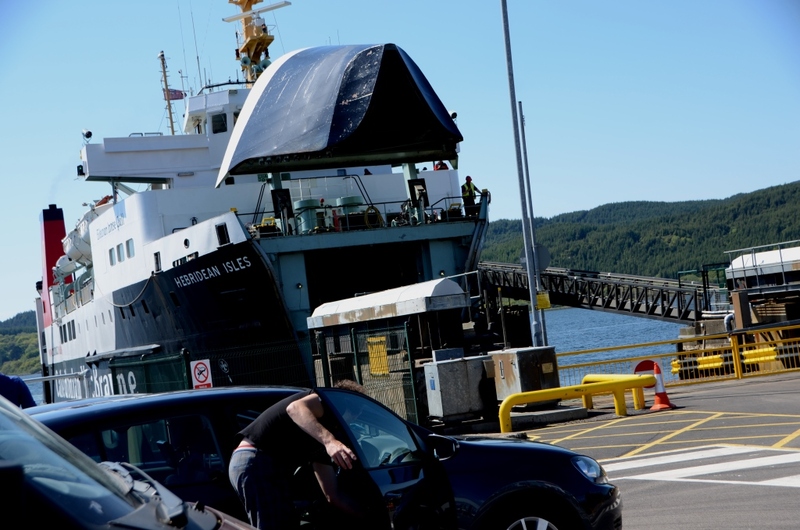 At this point, we all should have been suspicious as to why there were no other vehicles there waiting for the ferry. No trucks. Nothing! The terminal office was dark and appeared to have been unmanned. Thinking that I had plenty of time on hands, I took my SLR out of my tankbag, intending on walking over to the docks to take some pictures. Another car drove up, but went toward the office, and a woman got out. “Are you waiting for the ferry?” she asked. “Yes, I am”, was my reply. “Well, the ferry had been rescheduled to leave from Port Ellen this morning!” she said. 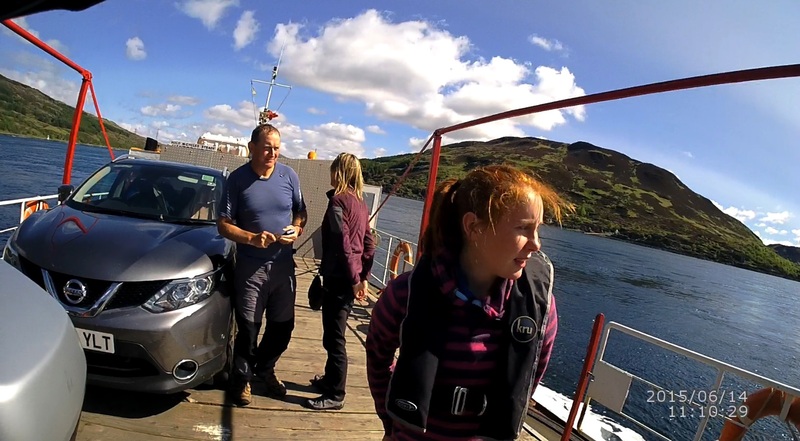 It seem that all of the other passengers had been contacted with the information, and apparently they had no contact information for me (another strike against Rentamotorcycle.co.uk, who had made the ferry and hotel reservations for me). Fortunately, there were plenty of time to make it back to Port Ellen, but I was a little flustered by all this unexpected change. The other couple got in their car and quickly pulled away as I walked back to the RT. Put my SLR back in the tankbag, and put my helmet and riding gloves back on. Unthinking, I made the mistake of straightening the front wheel before swinging my right leg over the RT to mount. That was when my left inner thigh just nudged the RT, and it went right over with my right leg high above the saddle! Damn! That’s going to cost me, I thought. Got the bike back up onto its side-stand, and this time got on without any incident. 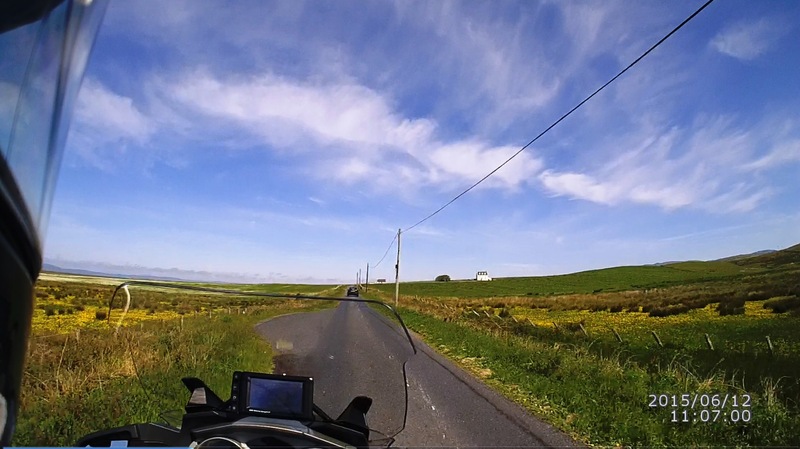 The ride back to Port Ellen was uneventful, and I was sure that I was riding a lot faster than the ride earlier on. 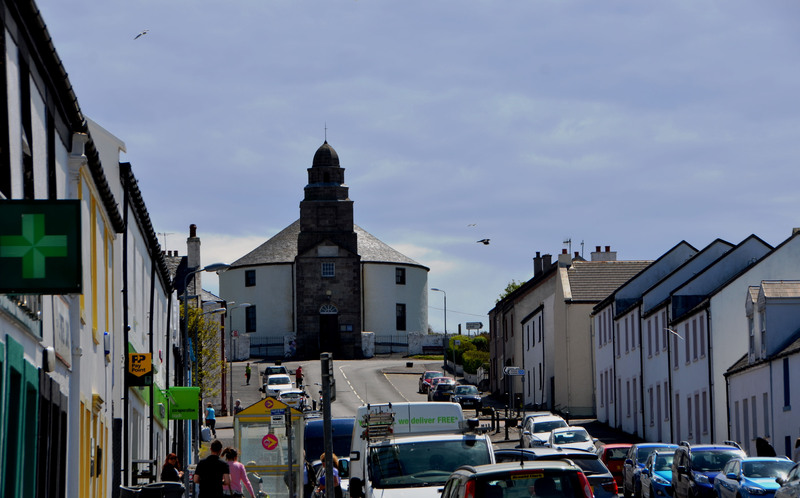 The ferry terminal at Port Ellen was literally just a couple of hundred yards down the road from the Islay Hotel, where I had been staying! In any case, I made it there with plenty of time to spare, and even though I was the last in line at the staging area, I was called up front to board first, when boarding time did arrive. They always board motorcycles first. Note how the RT was tied down – just a single strap across the rider seat, with the bike in 1st gear and resting on side-stand. Very soon I was on the road, taking A83 northward, back the same way that I had taken just a couple of days ago. 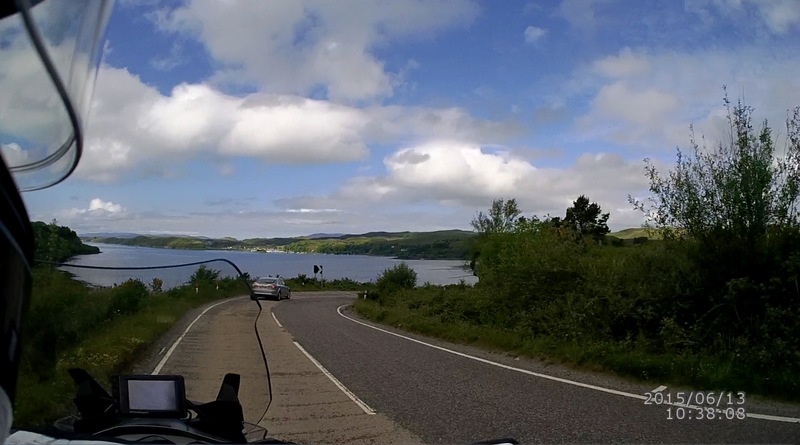 However, at Lochgilphead, where A83 took a hard right into town and back toward Loch Lomond, I continued north onto A816. The sky was overcast, and it looked as if it could rain at any moment. I had the waterproof liner in my jacket, but kept the mesh over-pants without its liner to keep cool. I stopped to refuel at the first station on A816. From this point on, I will be refueling whenever I can get the opportunity, because I will be riding in fairly remote areas with fueling opportunities far and few in between, at times. No premium gasoline either. Just plain unleaded or diesel! I couldn’t help but think, with amusements, about some of the heated discussions about using “only” high-octane fuel that had been debated in the forum. I guess that those people won’t be riding here!! Oh, and the price per gallon? Let’s just say that I won’t even look! (Just for reference, looking at the video, it was $7.23/US gallon at this station). A816, at the beginning, was just like any country roads that one might find here in eastern Ohio. Then we started to gain some elevation, and started to encounter some nice sweeping curves. The traffic was light, and there were enough straight sections for me to pass slower traffic and fairly much maintain the 60 mph speed limit throughout. 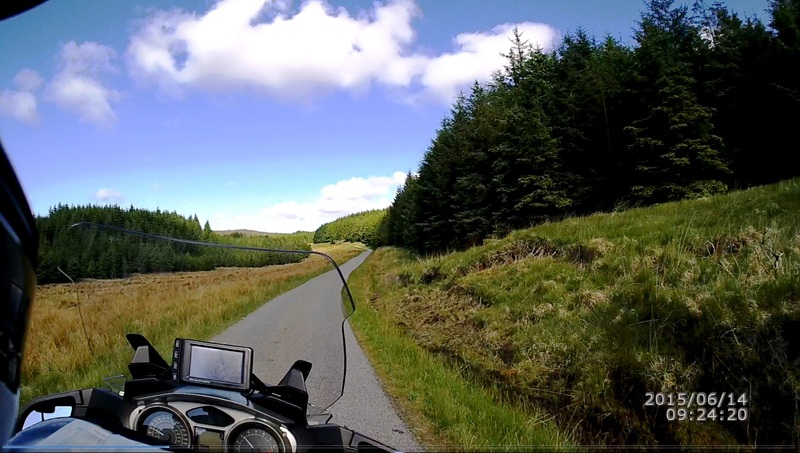 The curves got tighter as the road gained elevations, and it was perfect for a very enjoyable motorcycle riding! There were two factors that inhibited my riding somewhat. The first was the nature of the road surface. This surface looked like it was made of shards of stones embedded, perhaps loosely, in hot tar. It was hard to tell if the stone shards were loose or, more likely, firmly embedded. I didn’t feel any slippage, but took it a little easy on the sharper curves, knowing that the bike didn’t have ASC. The other factor was that the suspension, as set up, was somewhat soft. Not having ESA on this bike was a little bit of a handicap, and I did manage to get used to the softer ride, but only after a few hundred miles! 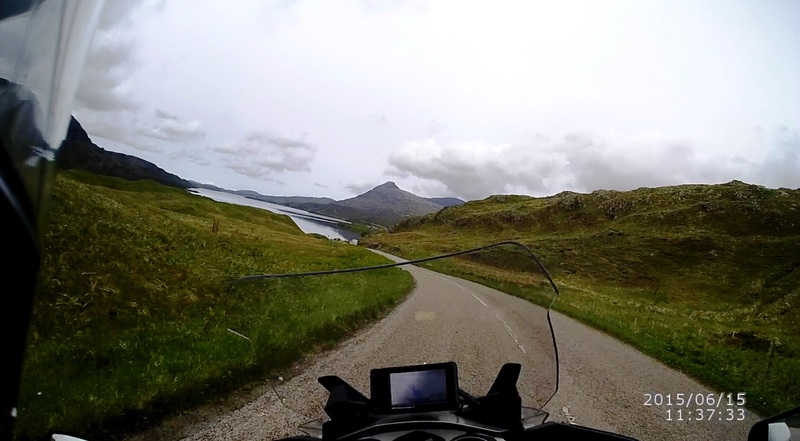 At the head of the loch, the road straightened and I was able to pass slower traffic and had the road in front of me clear as it again gained elevation and enters long series of nice high-speed curves. 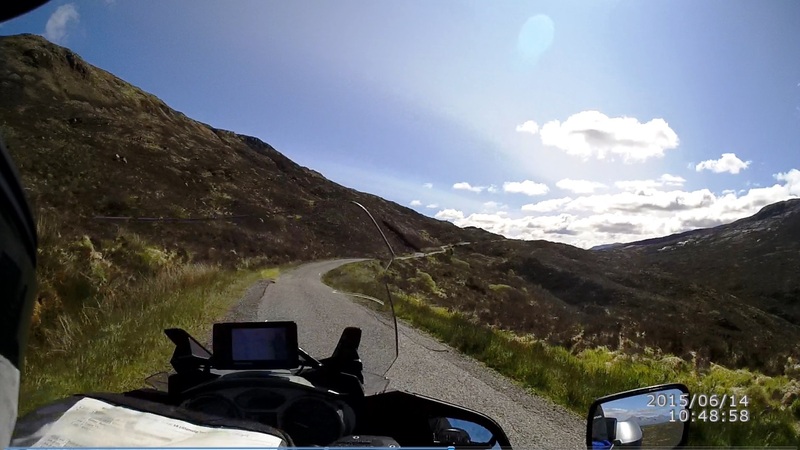 Lovely ride up and down the Scottish hillsides. 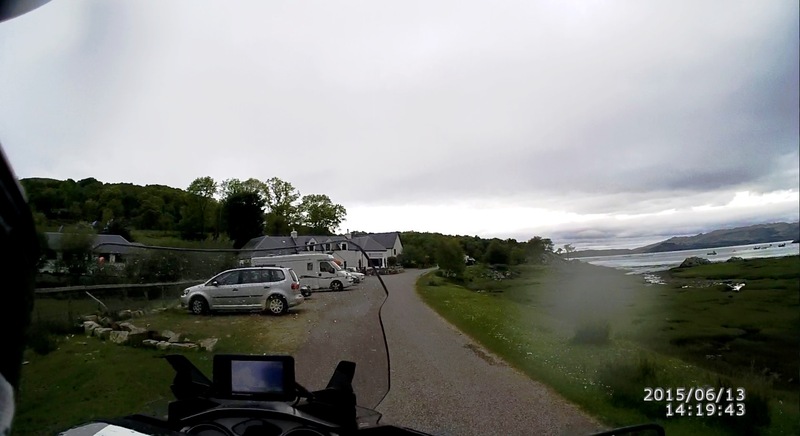 Soon, I was riding along the shore of Loch Melfort, heading toward Kilmelford, as the gray clouds started to gather overhead. 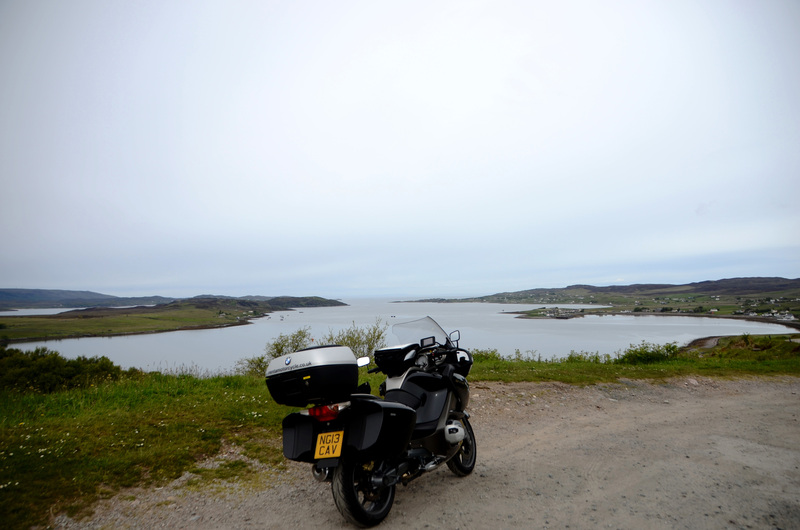 By 11 am, I arrived at the outskirt of the city of Oban, where I would pass through to take A85 northward. Rode to the other side of the city and turned onto A85 north at the roundabout. A85 was a nice two-lanes highway with moderate traffic, and the road was winding enough to be moderately entertaining. It was not too long before I arrived at the village of Connel. If I was to take the shortest route to my destination, I would branch off here and take the Connel bridge via B828, but my pre-planned route had me staying on A85 to take the very long way round to Glencoe. The sky was looking more ominous! The road was quite scenic, with lots of fast sweeping curves. Nothing challenging, but enough to keep one amused on the ride, as I swept down this valley toward The Bridge of Awe! OK, so the name fascinated my imagination, and I didn’t even noticed going over the bridge when I had gotten across! This was just a little stone bridge that took A 85 across river Awe. 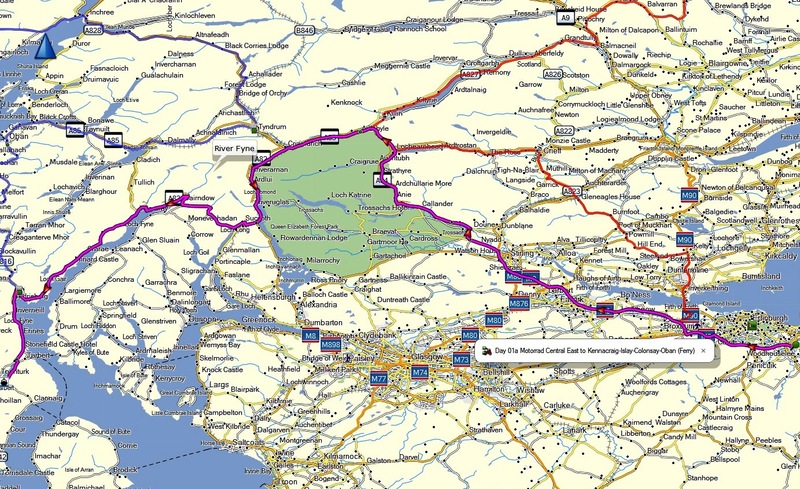 A85 continued with river Awe on the right in the south-easterly direction until the river emptied into Loch Awe, and A85 followed the western shore of the loch northward. The views of the river and the loch with the surrounding hills were quite something else, and it was very clear that this was one of the area’s vacation spots. 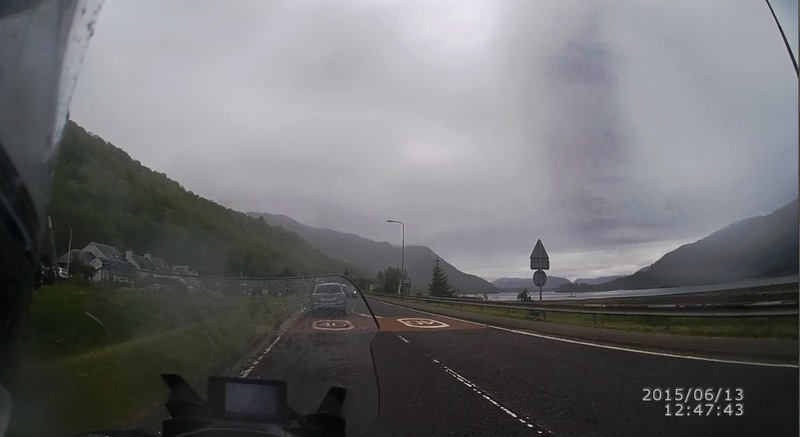 A85 cut east again at the north end of the loch, until it met A82 at Tyndrum, and that is where A82 ended. My route would have me taking a left turn onto A82 northbound, but I had planned for a pit-stop at this point, and so I turned right instead. A hundred yards or so, there was a service station with some shopping areas, and I pulled in to top up the RT’s tank. Rest stop? It seem that scores of motorcyclists had the same idea, and the place was simply packed with motorcycles and cars, and so I just filled up and continued on my ride. 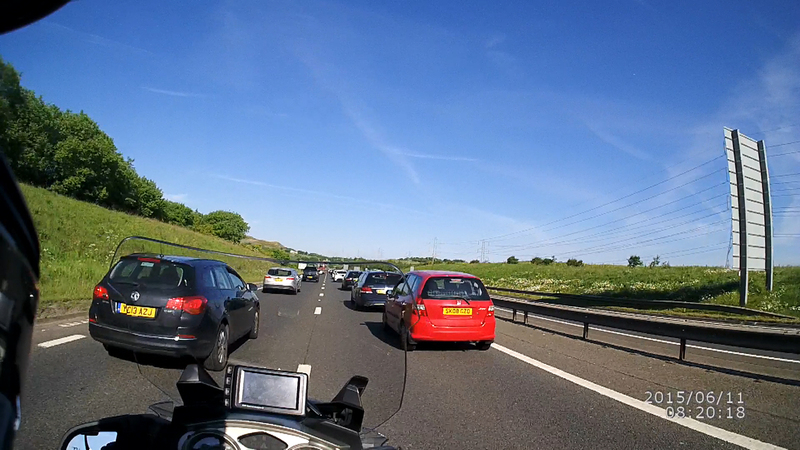 Fortunately, it seem that all these motorcyclists were heading south! 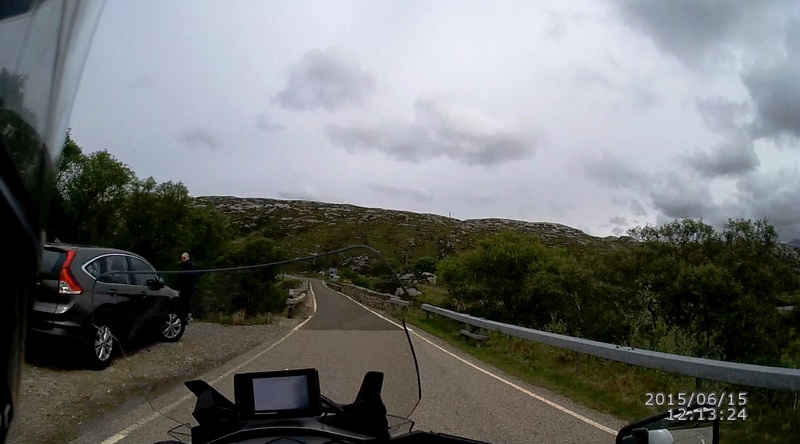 I turned right off the parking area to head north on A82, as a big pack of bikers were milling around the exit, presumably waiting for their mates, and they all turned left to go south. I opted to keep riding! I am the type that like to stay in the saddle, once I had gotten rolling, and I decided to skip lunch all together and ride on to the end. The rainfall got heavier as I rode along, and the excellent fairing of the RT kept my pants completely dry! I was able to feel water accumulating on the upper part of my jacket liner, but was unable to feel nary a drops on my legs! 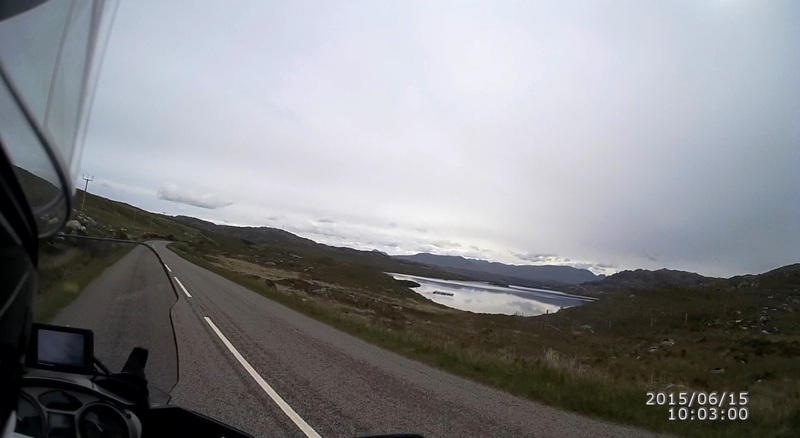 A82 followed River Orchy north until it emptied into Loch Tulla. 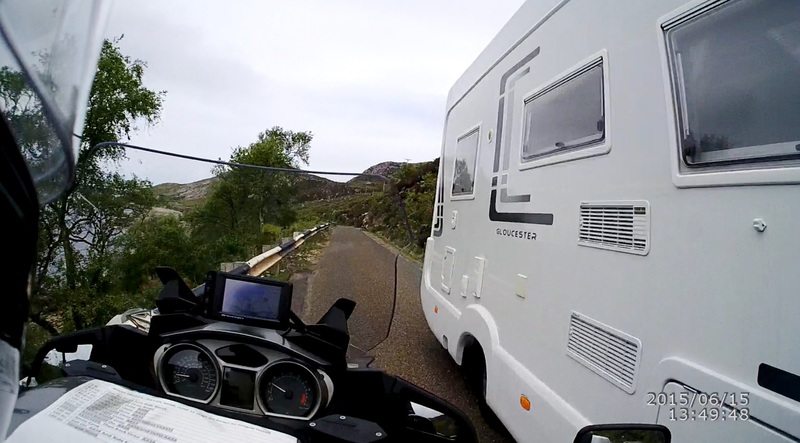 By this time, I had managed to pass some cars and a camper in front and had a fairly clear road ahead. 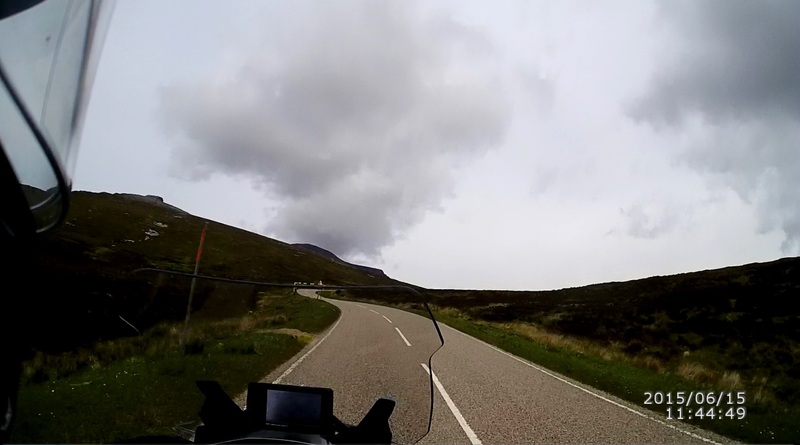 The rain was light but steady, and the road was steadily rising in elevation into the hills of Glencoe mountain, with some very nice fast sweeping curves. The views from this road (looking behind me) must be very nice on clear days, since I had passed several parking spots that were fairly full of cars even on this cloudy and rainy day. Then the rain started to come down heavier! No problems. Legs still dry. Road surface was good, and I was still able to (cautiously) pass a few more cars along the way. One thing that I had started to notice was that, wherever there were open space anywhere along the road, it was quite acceptable to pull over a camper or pitch a tent for the night! 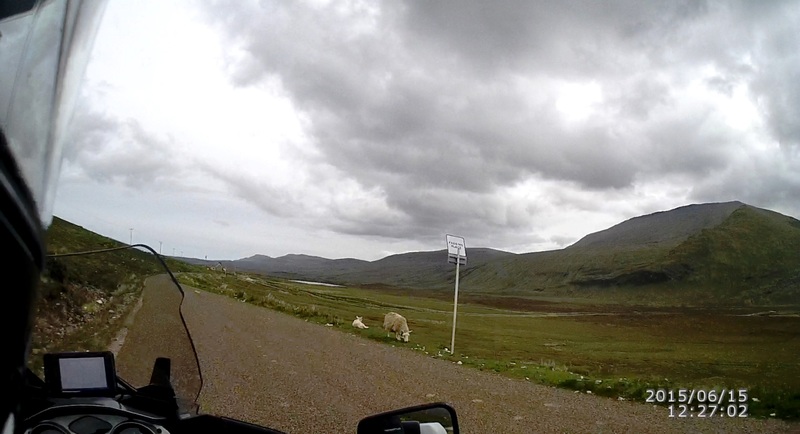 This observation was made at different times throughout my ride through the highlands. In descending the other side of the hills, I looked at the scenery in front of me, mostly hidden in mists, and can’t help but to think that I want to ride this road again on a clear day! 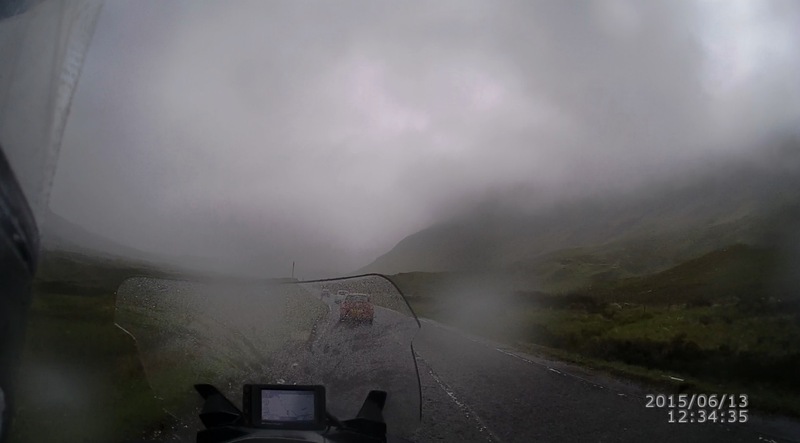 The rain had started to slacken off as I descended off the mountain and into the town of Glencoe. I was cold (10.5 ºC, or 51 ºF), and somewhat miserable from riding in the rain, but it wasn’t too bad. Some water had managed to get into one of my Gore-Tex riding boots, or perhaps that was just condensations. On the other hands, my pants and gloves were fairly dry! By this time, the rain had stopped completely and the road was dry. 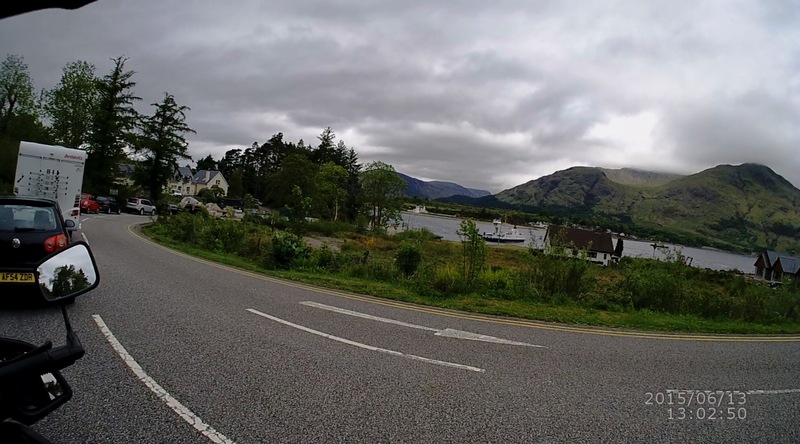 A82 crossed over a bridge, to the northern shore of Loch Leven, into North Ballachulish. 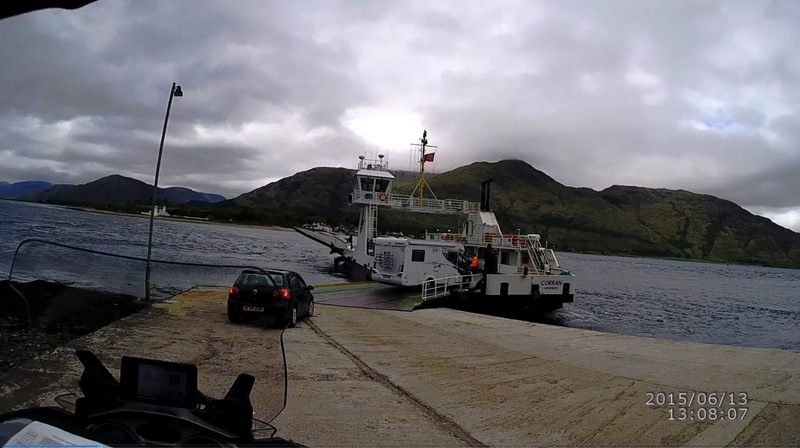 From there, it headed west and then north, where I left the highway to take a little ferry across Loch Linnhe to Corran. 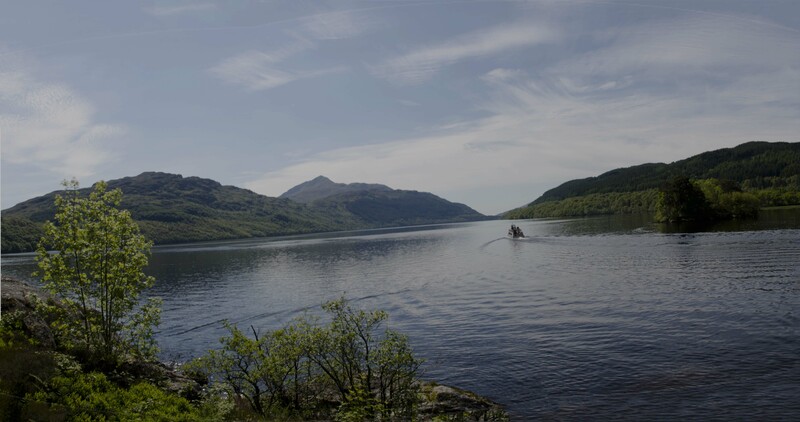 Both Loch Leven and Loch Linnhe are salt-water lochs in that they are actually parts of the sea. On the other side, I took A86 south-west from Corran, following the coastline of Loch Linnhe, and around Inversanda, A86 headed inland westward. 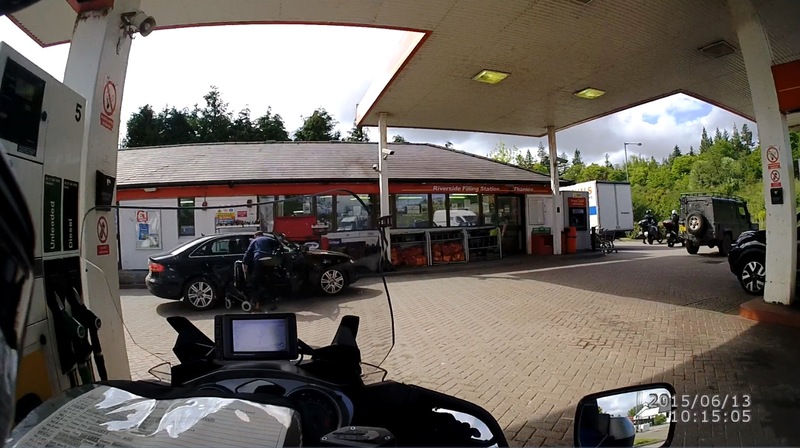 I was hoping to get a fill up for the RT at Strontian, since the next day (Sunday) was looking to be a long exciting day with very few fueling opportunities. 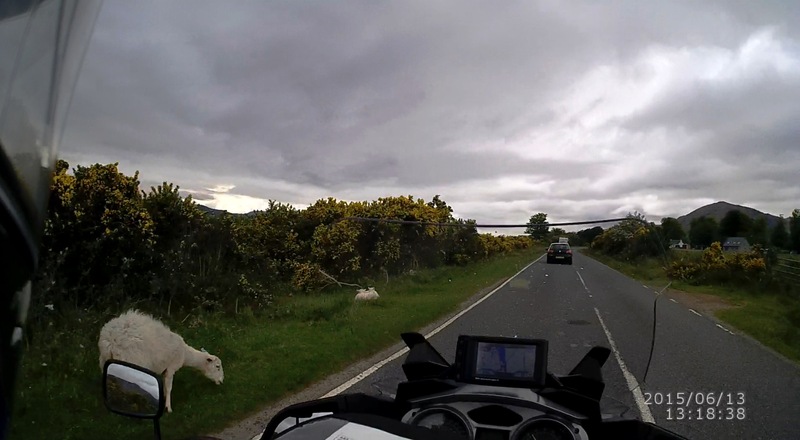 It is obvious that I was riding into more of the urban countryside now, with the roads passing through farms, and of course June is the lambing season! 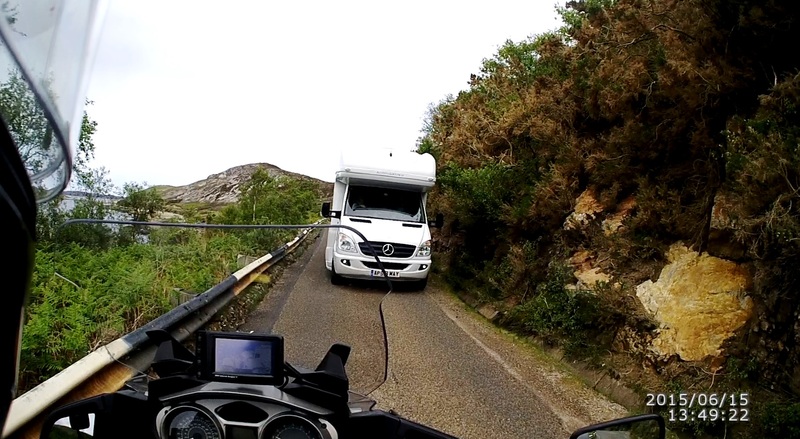 I was following a camper and three cars that were ahead of me in the ferry, and I rode along quite peacefully behind them as I was enjoying the coastal views. 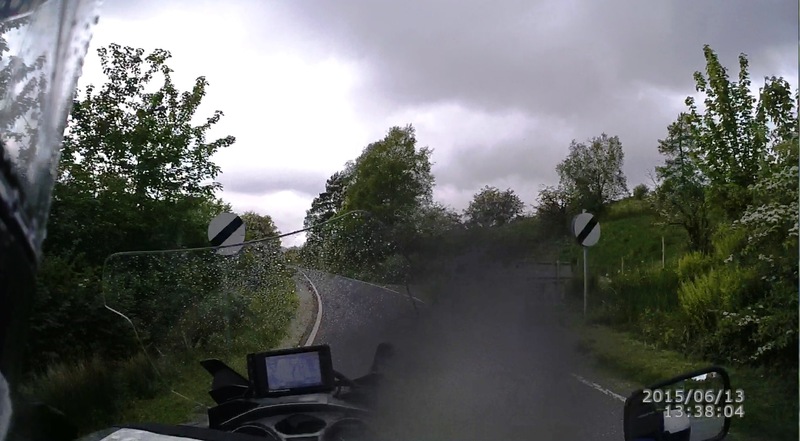 It wasn’t too long before A86 cuts inland, and I was quickly reminded of my riding days in Wellington, NZ – the small country road, the farmland with sheep in the paddock, and the cold damp weather! As the road wound its way up the hills, I used every opportunities to pass all of the slower traffic in front, and soon had the road to myself. Then, it started to rain again! Just lightly, but the road surface was excellent, and so I was not slowed down at all. I can’t say that I kept to the speed limit as I rode up that nice winding road! Before long I was descending down the other side of the hills toward Loch Sunart, and the little village of Strontian. The sun tried to peek through the clouds, but without success! The rain kept coming down, on and off. It was raining fairly hard as I reached the beginning of Loch Sunart. 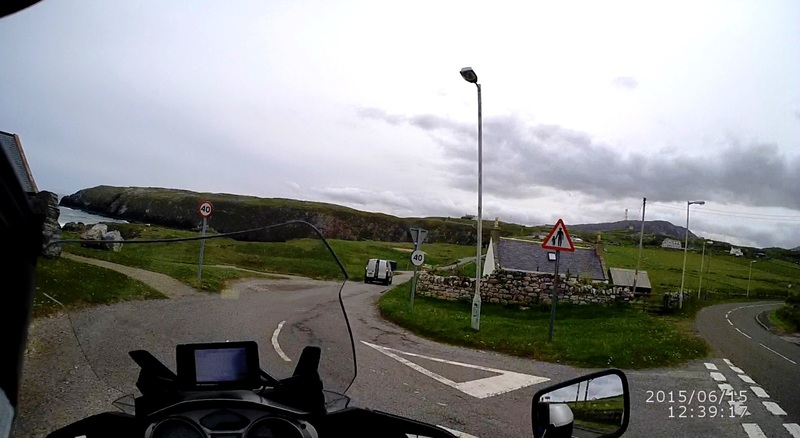 In the village of Strontian, I rode by the general store (and post office), where the single fuel pump was located, slowed down, but did not feel like stopping in the rain. The fuel pump was out in the open beside the store building. I rode on, knowing full well that the wasn’t another fueling place before my stop for the night, and that the next day was Sunday! Not a smart move, but I guess that I like living close to the edge! On the other side of the village, A86 turned into a single-track road. The national speed limit of 60 mph applies (see the signs in the photo below), but one would have to be crazy to ride or drive anywhere near that speed on this road. 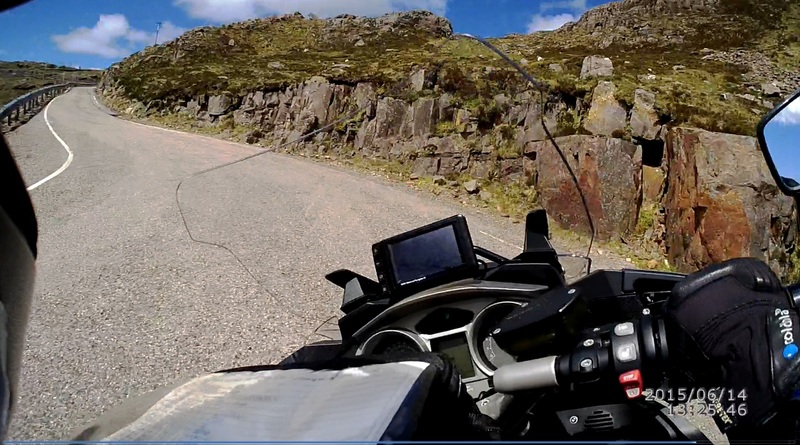 The road surfaces were quite good right after Strontian, but as I rode further along A86, I started to notice that the condition of the road was slowly degrading until the surface was rather bumpy from years of patching. Around the tiny village of Salen, A86 cuts straight north inland for a few miles, and then again west around Ardshealach. 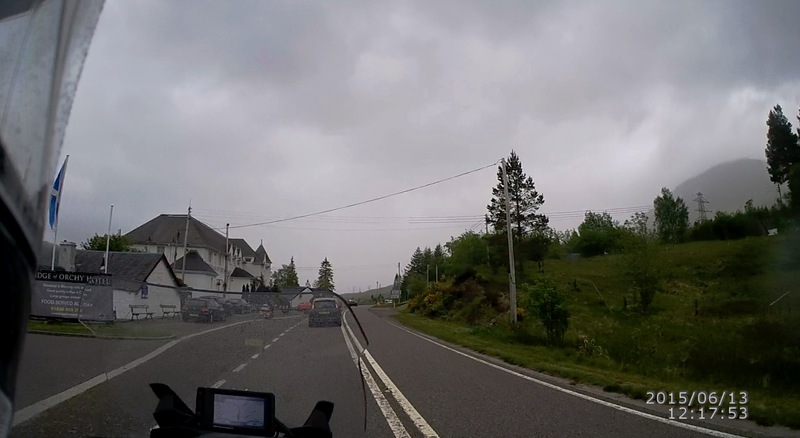 A86 gained some elevations, and at one point there was a scenic parking area…..or, rather, it would have been quite scenic if it wasn’t for the rain and mists obscuring the hillsides! I do want to repeat the ride of this day again at some future times, but in nice weather! On the other side of the crest, A86 descended fairly steeply. The road on both sides of the summit were two-lanes road, and the surface was quite good, even though it was very wet. 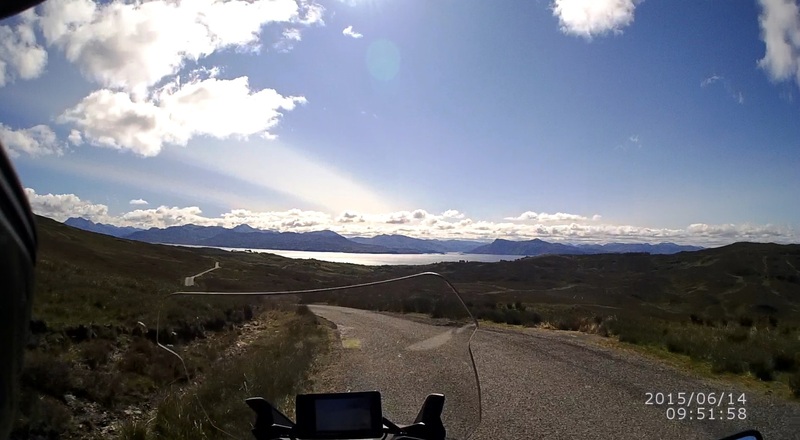 Then I rounded a corner, and I saw that I was descending toward Loch Moidart. Not very far now before I would be arriving at that day’s destination, Glenuig. 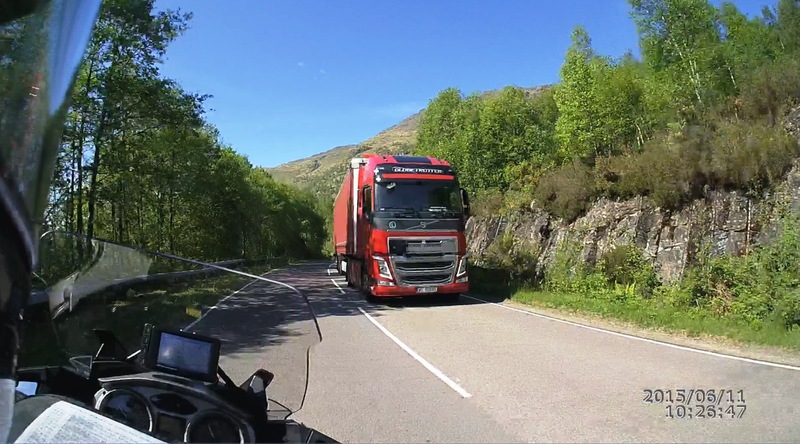 A86 returns into a single-lane road again just a few miles down from the summit, and it was to stay that way for a distance until it ran along the shore of Loch Moidart, where it was to open up into a very nicely surfaced two-lanes road again. 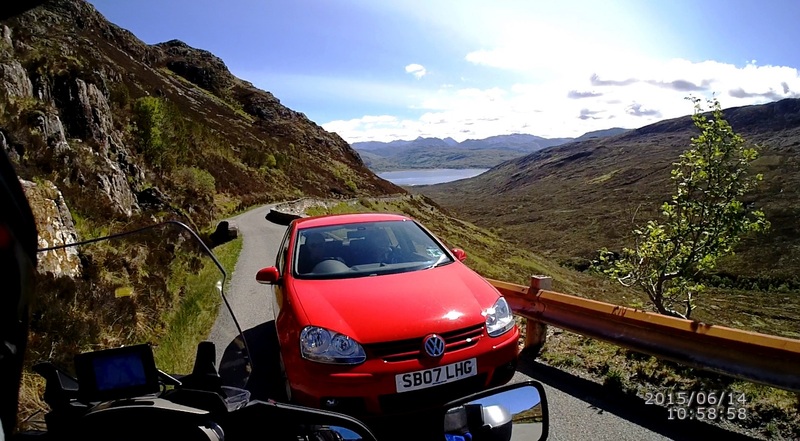 At Loch Moidart, the road was completely dry. There were no signs of any rain, and the sun was trying very hard to break through the thin clouds above. What a change in less than 10 miles! I was able to really wind up the RT again, as I rode the last few miles of the day along this beautiful roadway. 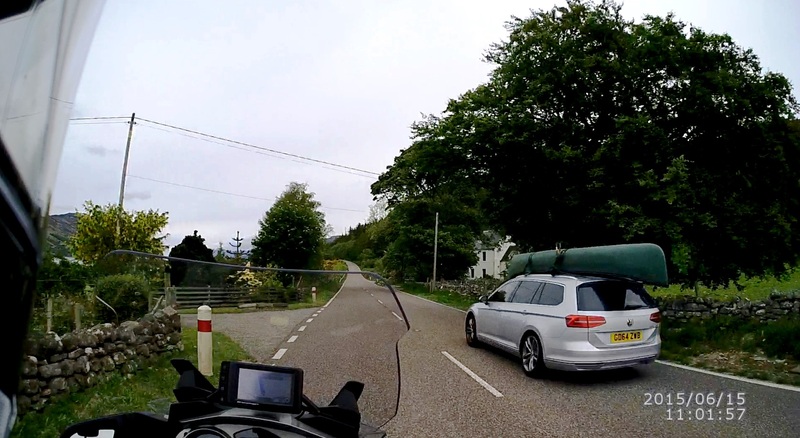 Apparently, Glenuig Inn is a popular place for sea kayakers and motorcyclists. Looking at the big bay outside the inn, I can see why I might want to get into a kayak and do some exploring of the shoreline! Looked like I had made good time getting here, considering all the rain. It was barely after 2 pm, and even though I did not stop for lunch, I must have gone over the speed limits somewhere! My room wasn’t ready, and so I spent an hour or so enjoying a couple of pints in the pub while waiting. In the pub, a young lady asked me as to how was the ride, and I said that it was great and would have been much better if it wasn’t for the rain. What rain? Apparently, they had not seen any rain there at all! Wow you put a lot of effort into your write up, enjoyed the read and even though you tempt me into wanting to go I am almost certain it won't happen on two wheels. From my perspective it was interesting to see what you thought about UK traffic and filtering compared to the US. It sounds like our car drivers are better behaved. I commute most days in the UK and find that most drivers are aware and look out for filtering bikes. Lorry drivers are even better. I have had lorry driver move their trucks a few feet or move their door mirrors out the way to let me through. I am a story teller at heart! 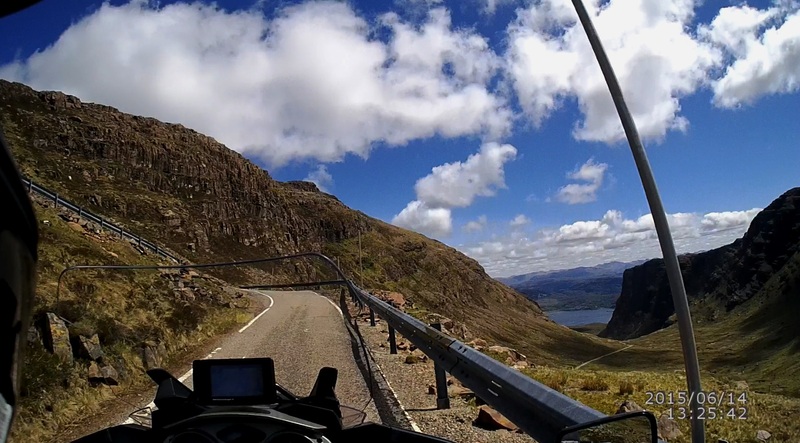 You will love riding in Scotland. It will test your riding skills to the limits, and I don't mean riding fast or handling the twisty at speed either. Almost any fools can ride fast, and even though it does take some skills to ride the turns, it's the slow speed and precision riding that will test many riders. The three days that I have described so far were the easiest three days. 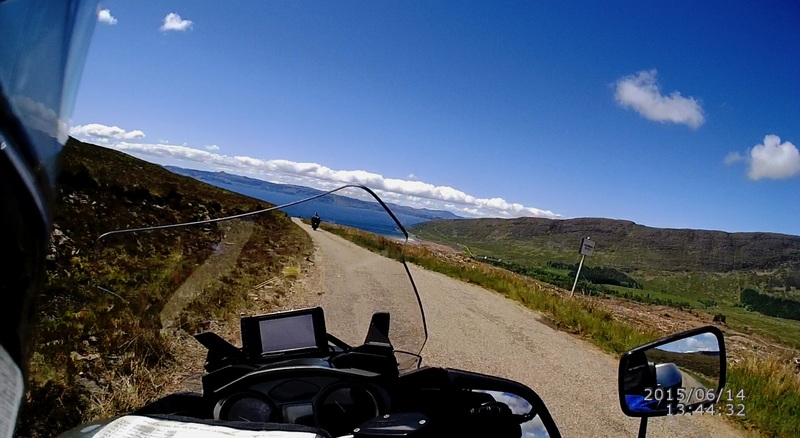 The roads and the riding gets tougher (and a lot more fun) starting with day 4! Might be a few days before that installment gets posted though. The weather is really nice here, and I have to get my riding time in while I can. I love riding over there!! Everybody were very polite and considerate. The traffic around where I live here in Ohio is relatively light, as compared to other cities in the US, and so I have not had any experience of filtering at all. I know about it only based on discussions in this forum, and the occasional video that I have seen on YouTube. 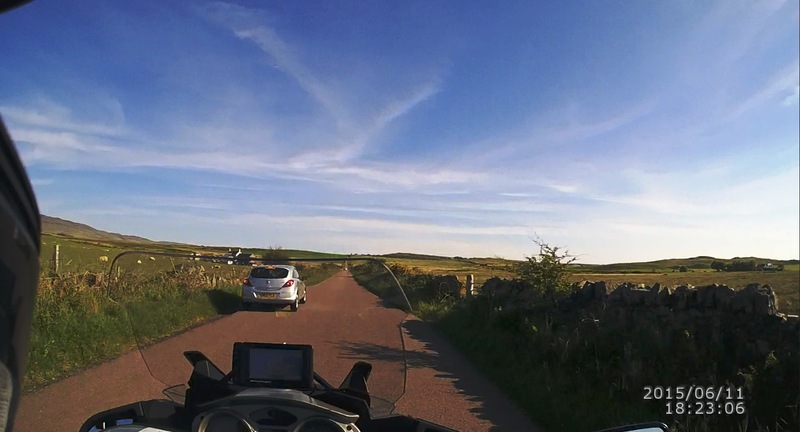 That is why I was so appreciative to have noted that while I was filtering on the Edinborough City Bypass, ALL the drivers were keeping to the extreme sides of their lanes to give us motorcyclists the maximum room to filter. Car drivers here tends to be quite selfish (IMHO) in comparison. I think that their psyche is such that if they can't get ahead in the heavy traffic, then nobody should either! As I was riding on the single-track roads, I couldn't help but think that the system would never work in the US! The most noticeable traits though were how considerate car drivers were toward motorcyclists. They would often signal or pull aside to let me pass, even though I was following at a good distance. 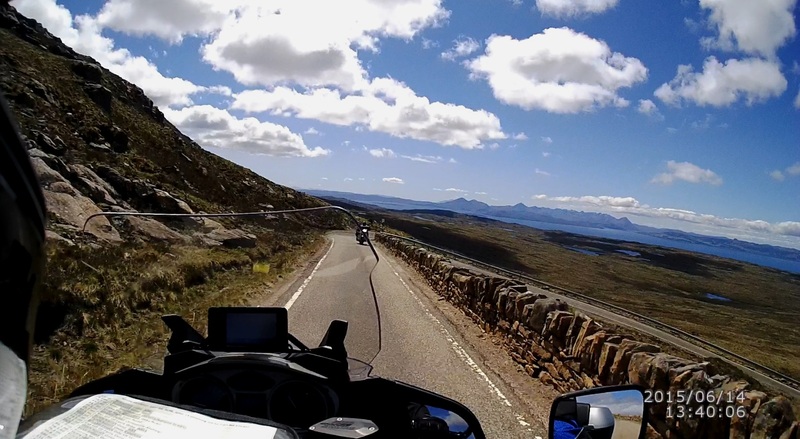 I definitely will go back, but this time I will rent an RT from another dealership down south in the UK, and ride the UK as well as repeating some of the roads in Scotland. 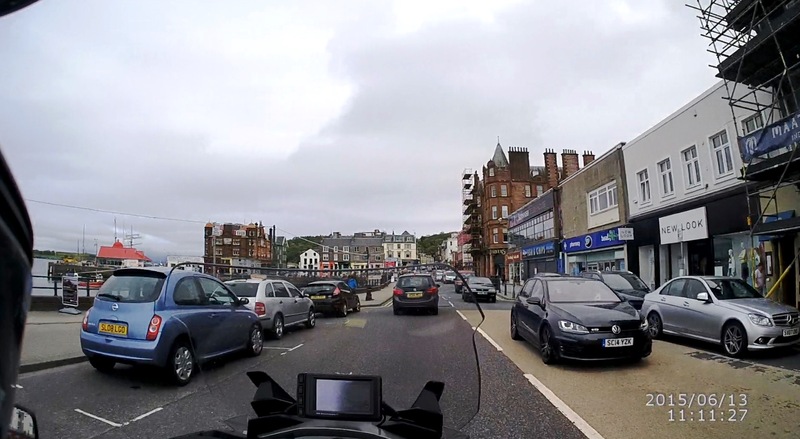 I think the fact that motorbikes have always been allowed to filter here has meant that it is nothing new to motorists (they just accept it). There are also a lot of ex and current bikers driving cars on the road. Yeah, there will always be the odd one. 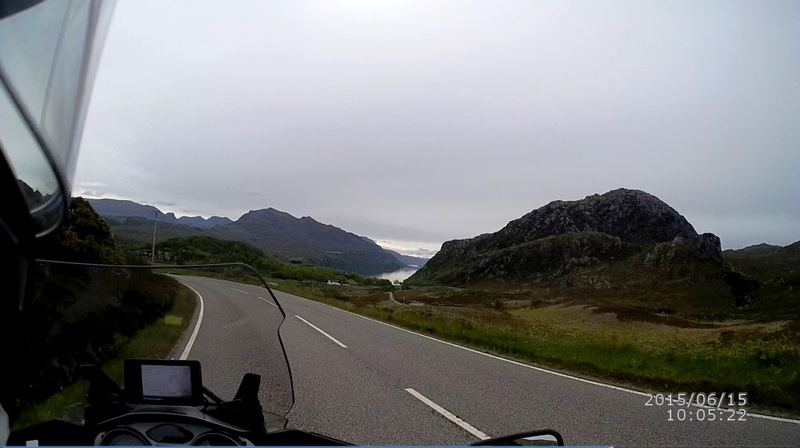 Day 03, Sunday June 14 – Glenuig to Shieldaig via Skye, Glenelg-Kylerhea Ferry, and Bealach na Ba. I was awake and up bright and early, as usual. More so because of the very early daylight, and I wanted to try to get on the first ferry from Malliag to Armadale (Isle of Skye). I already have the ferry ticket, but it was for the second ferry that leaves Malliag at 10:45 am. I expected this day to be a long one with lots of excitement, and figured that trying to get on the first ferry of the morning, at 8:40 am would be a better idea! So, it was up, wash, dress, pack and get on my way by 6:30 am. Too early for the kitchen to be open for breakfast (paid for already), and so I decided to skip that and hit the road. I gave myself an hour to get to Malliag, which should be ample. A cloudy morning, but the air was quite still. Got onto A861 heading north and east, following the coastline of the big bay. I rode along for just a couple of miles when the sun broke through the clouds! It looked as if I was going to have a pleasant day! The temperature that morning was just 8 ºC (46 ºF), according to the display on the RT’s dash. Quite pleasant. There were no other traffic on the road, and so I wound my way around the coastline at my own pace. Every so often I would see a camper or two parked on the side of the road, right above the shoreline. 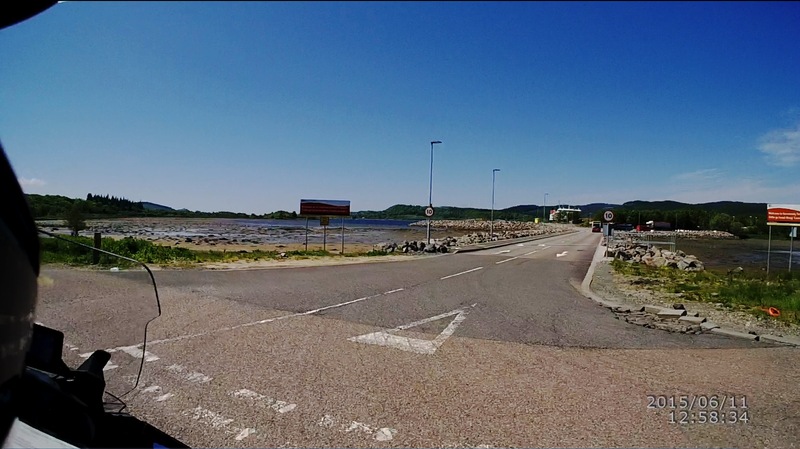 In about 10 minutes, I reached the end of A861 at Lochailort, and turned left onto A830, heading west toward the little port town of Malliag. 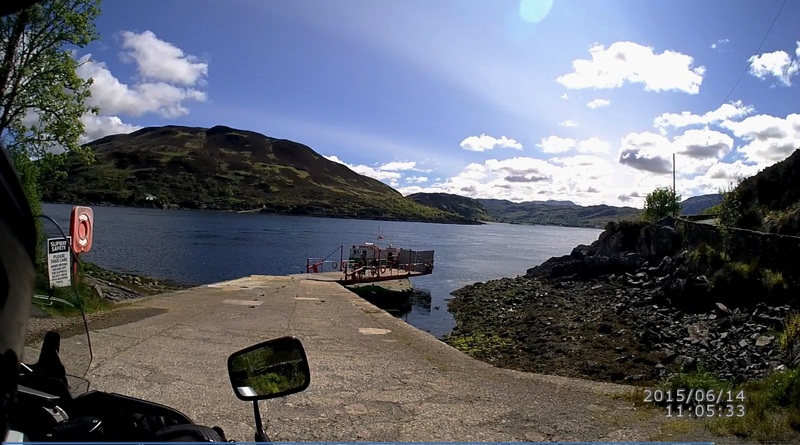 I had the road pretty much to myself all the way into Malliag, and arrived at the ferry terminal by 7:05 am, less than a ½ hour ride! My biggest concern was to find some fuel, since I had not top up the tank the previous day. There was a filling station at the roundabout just before the terminal, but that station was close when I had arrived. 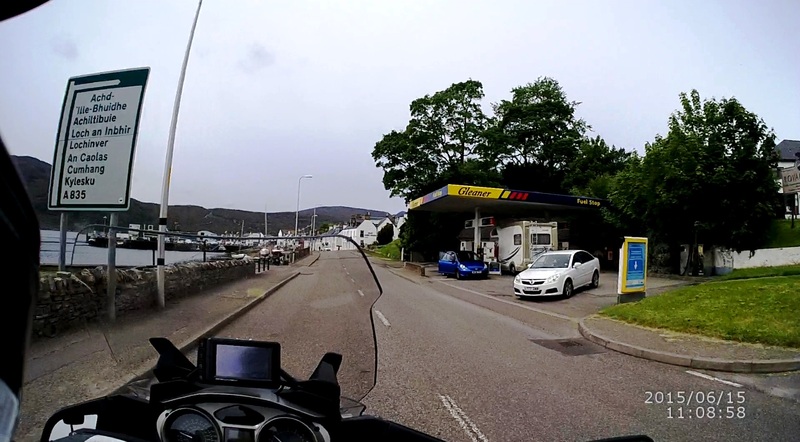 There were nobody at the ferry terminal yet, and I knew that there was another filling station at another little town off A830, that I had ridden past on my way to Malliag. Therefore, I decided to back-track to see if that station was open. It wasn’t! Came back to the ferry terminal and waited for people to show up, and for me to inquire regarding the possibility of catching the earlier ferry instead of the one that I was booked on. That turned out to be no issue at all, and I did get on that first ferry. 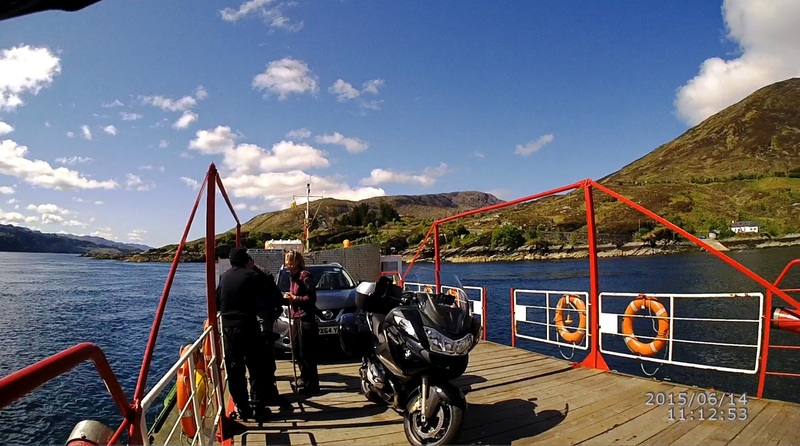 There were 3 – 4 other motorcycles that also travelled on that first ferry to Skye. Finally, I was on the main road again. A851 heading south toward Armadale. In Armadale, Nav IV led me right to the fueling station……the same one that I had stopped at earlier when I had gotten off the ferry! 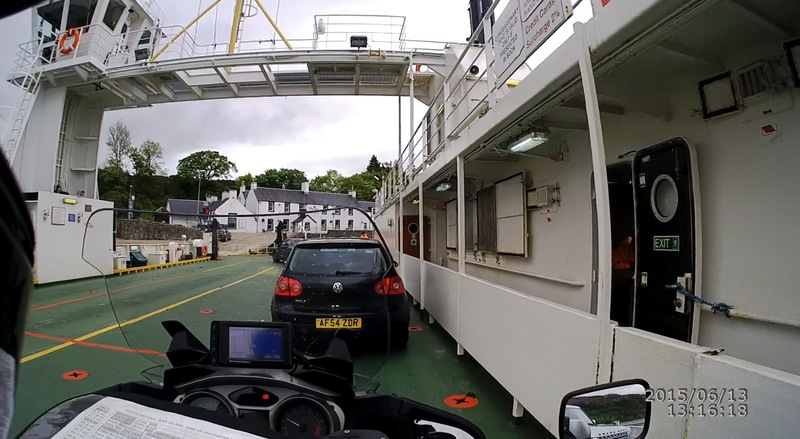 No other stations in the immediate vicinity – Nav IV told me to get back on the ferry to get to the nearest one! Oh well, it’s back north on A851. I was far from disappointed at that last unintentional detour though. That was a fantastic ride, and one that I would not have encountered if it wasn’t for the misdirection. Started off north again right at 10 am, still well ahead for time, had I caught the second ferry as originally booked. Now, I had less than 2/3rd of a tank, and needed to find a place to refuel in the near future! Once I had gotten well away from the villages, and was up in the hills, I pulled aside and stopped to take another look to see what refueling choices Nav IV would be able to find for me. 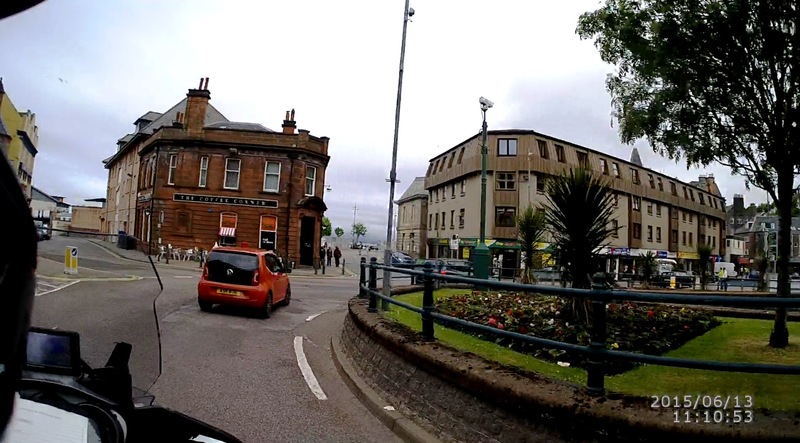 I had gone far enough away from Armadale so that several new choices were offered, and I selected the closest station ahead as a detour to the route. 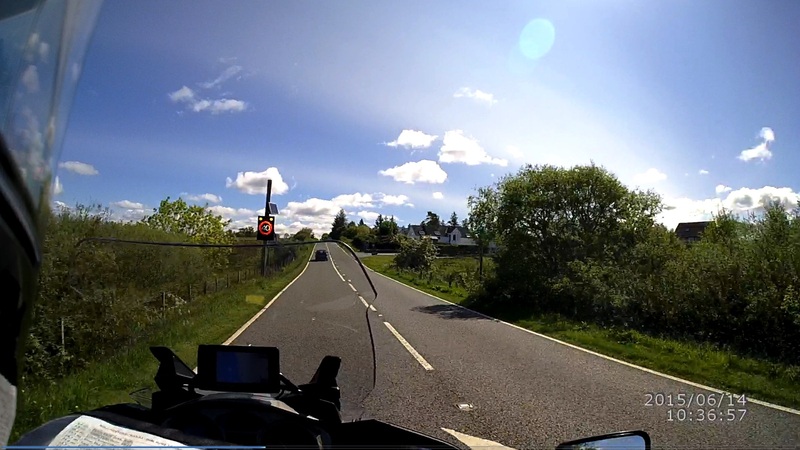 A851 ended onto A87, and instead of turning right to follow my plotted route, I took a detour by turning left on A87. There was supposed to be a fueling station a couple of miles in that direction, and there was! I filled up the tank (plain unleaded, since there was no premium available) with great relief. Now, I would be able to ride easy for the rest of the day! No, I had not seen that sign at all, probably because I was going at a good clip at that point, and I was looking in my rear-view mirror to check for traffic behind me at the time. 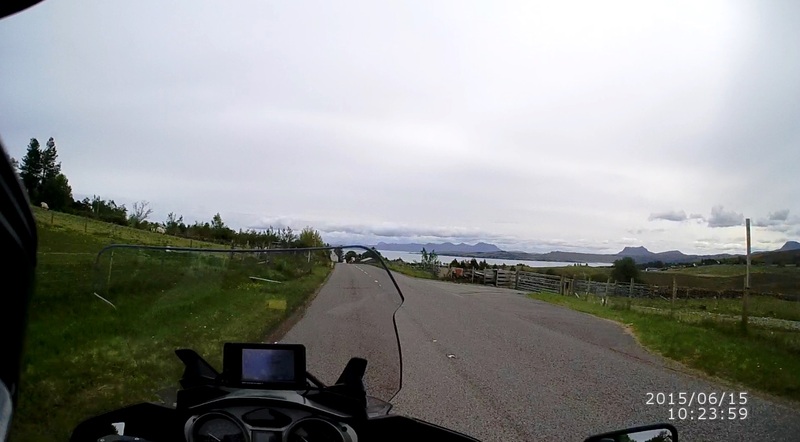 Just a few miles further, I came to my turn-off, leaving A87 for a small single-track road that snaked its way down the side of a valley to Kylerhea (sometimes spelled “Kyle Rhea”) and the tiny ferry that crosses the narrowest point between Skye and the mainland. I had been watching some videos of this crossing, and had seen that when the tide was running fast, the current across this very narrow gap can be quite furious. This unnamed road was just like the other single-track road. The difference was mainly from the spurious traffic that came up the road each time that the ferry unloaded on this side. This road was about 14 – 15 miles in length, from the turn-off to the ferry. This is the road that I was a little apprehensive about, when I was doing my research of the routes on this trip. However, that side-track earlier in the day gave me a great deal of confidence in how I was handling the riding on single-track roads. After spending some times at that parking spot taking photographs, I got back on the RT and proceeded on my way down the road. Little did I know that I was about to experience something that was to repeat several times over my days of riding the single-track roads. A tourist, or visitor, driving on these narrow roads and did not know nor understand the rules and etiquette of driving on this type of roads! Based on my observations (to come), I suspect that most or all of them had figured out that they were supposed to give-way at one of the passing places, but the problem might be that they didn’t know that when the passing-place is to their right, they were supposed to stop beside that passing-place to let oncoming traffics get around the stationary vehicle. I knew all of the rules only because I had done my “homework” and had read all about it before coming to Scotland! After that little incident, I had a very smooth ride down to the little ferry without encountering any more traffic coming up the hills. The turntable is needed because this little ferry always dock against the shore bow-in, and the boarding vehicles would drive straight onto its deck, and when all were aboard, the deck is rotated such that when the ferry reach the other side, all the vehicles would be able to drive straight off. This turntable is probably hydraulic or electrically assisted, because when you see who operates the turntable, and as a matter of fact, was the only deckhand, you will see why! 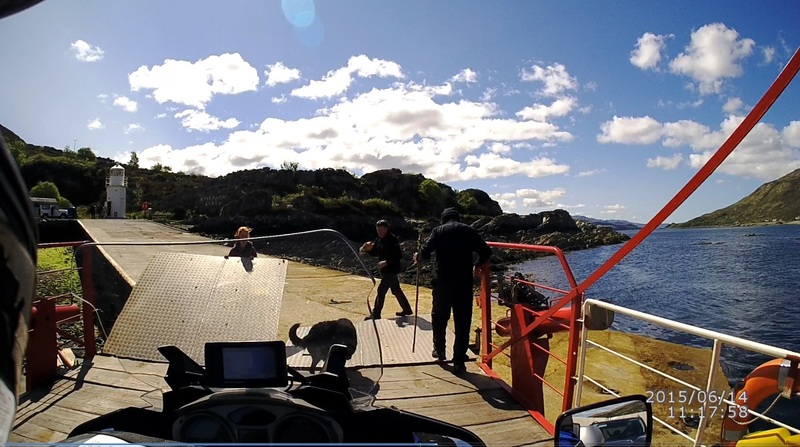 I rode onto the ferry, and was halted when I reached about the mid-point of the deck. I understood why! If I was the only vehicle to cross, then being in the middle of the deck, right above the pivot point of the turntable rotation, would put the least load on whatever is doing the rotating. A few minutes later, another car arrived, and I was asked to move forward, so that the loads would balance for the turntable. This little lassie was the deckhand on this ferry! She did everything from mooring the ferry to the dock, turning the turntable, unmoor, and collecting fares! I suspect that the captain of the ferry was her dad! The fare for this crossing was £7, quite a bit more than the fare that I had paid on a similar crossing the day before, but that was quite fine for this special ride! 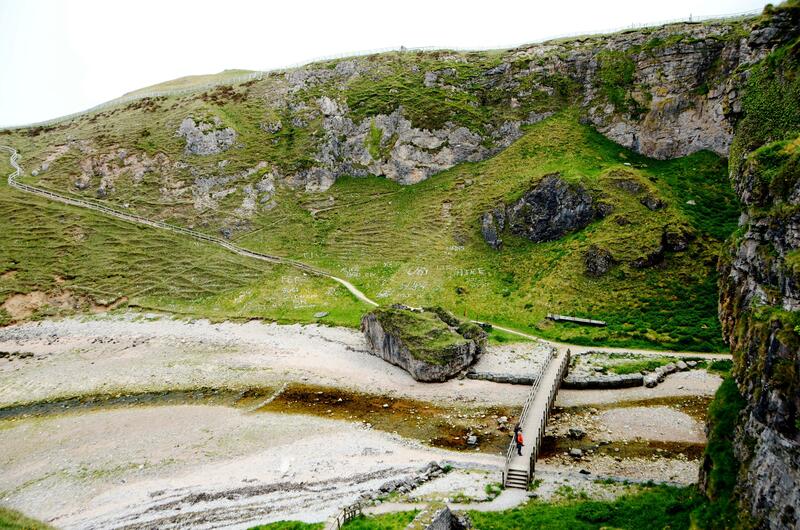 In the old days, cattle were driven to swim across this narrow gap so that they could be taken from their farms on Skye, to the market on the mainland. I am sure that they would have to wait for slack tide like what I was experiencing, or the cattle would have been swept out into the open sea! Then, I was off and away! Rode pass two cars and a van, waiting to cross, and I was up the hill and into a right hair-pin turn, then off on another single-track road. Part way on this road, I had just passed a passing-place when a small van came around a corner. The road at this point was just about wide enough for me to sneak pass, but the van driver stopped and backed up to the passing-place that was right on the corner! Now, THAT was courteous! 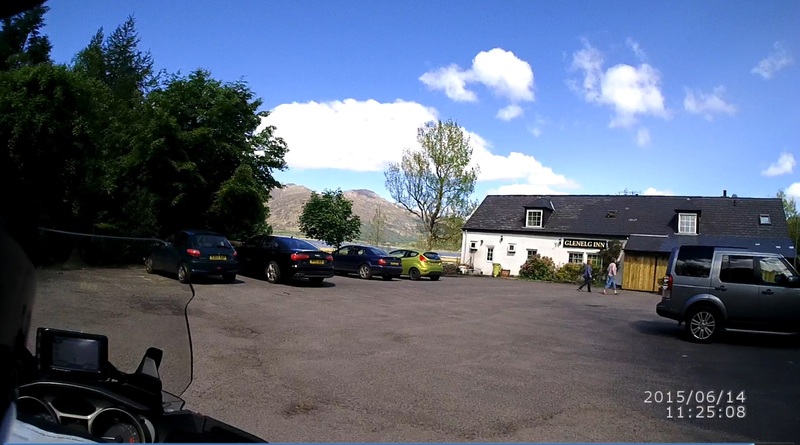 I arrived at the Glenelg Inn before 11:30 am, and knew that lunch was usually not served until 12 noon, but I thought that since I had arrived already, I might as well go in and check. At the very least, I could use the facility before riding on. The descent downhill was quite tame, because I am always ultra-cautious in descending any relatively steep slopes. The road was two-lanes much of the way down, and a lot of it was very steep. The road surface was excellent with a light layer of gravels over it, indicating that the surface was recently redone. Lower down the road, the gradient was so steep that I left the RT in low gear and let it coast down using engine braking, and I still had to tap on the brakes every so often to slow down. I passed a couple of parking places that, in hind sight, I should have pulled in and stop to take photographs. Oh, well, maybe next time! I always have problems convincing myself to stop for anything, once that I had started off riding! The road turned into a single-track road again near the bottom of the incline. Then, not long after, I crossed over Shiel Bridge (a small stone bridge) and was at the end where this road met A87. 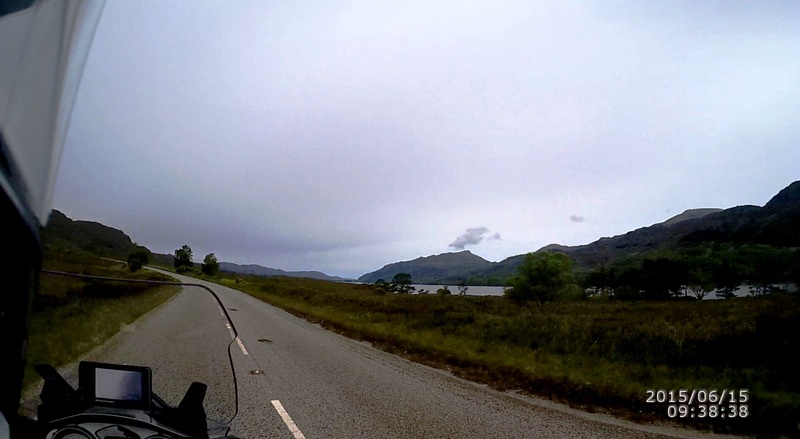 Turned left onto A87, heading north and west, and after rounding the southeastern end of Loch Duich, the road hugs the northern shoreline of the loch. 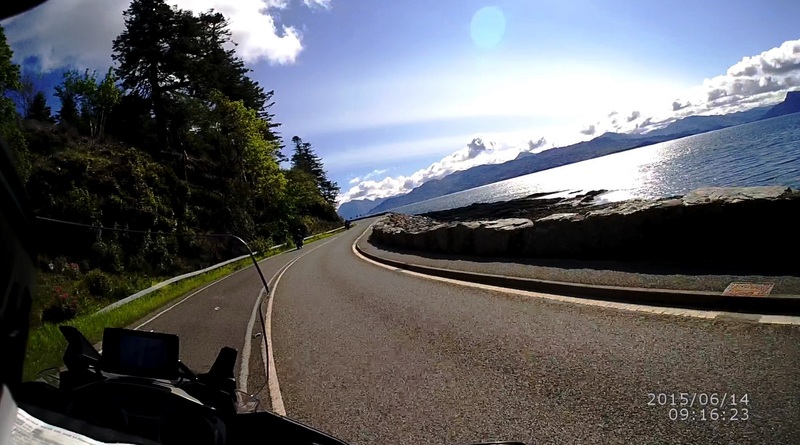 About halfway along the coast, as A87 went a little inland, I turned off A87 onto A890, to cut across the peninsula to Loch Carron. Up the mountain, and less traffic! 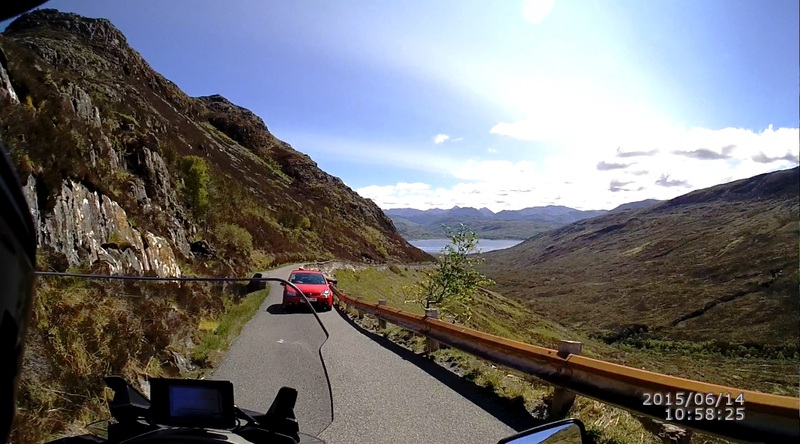 A890 was a nice two-lanes road with large sweeping bends, as it ascend and then descent the mountain down toward the shore of Loch Carron, and the curves got tighter. At this point, I caught up to a pair of motorcyclist who were sweeping down the slope in front of me, but unfortunately I was stuck behind a car, and was unable to ride at a preferred faster pace to appreciate those tight turns as much as I wanted. 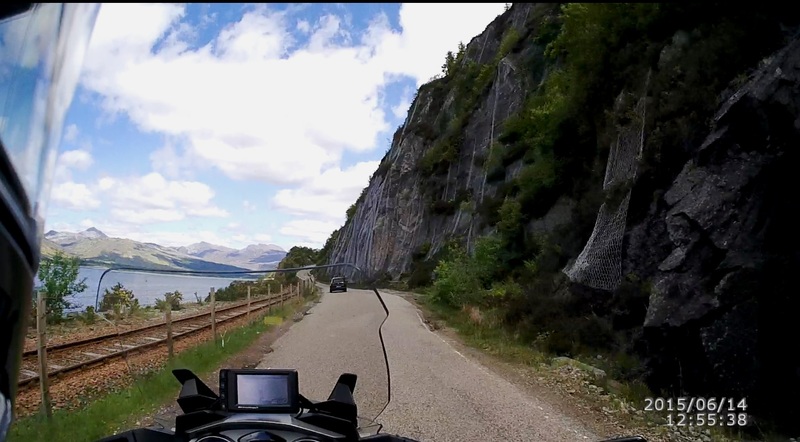 Once the road was cleared of the steep sides and cliff of that portion of the Loch, it opened up into a steady two-lanes road. 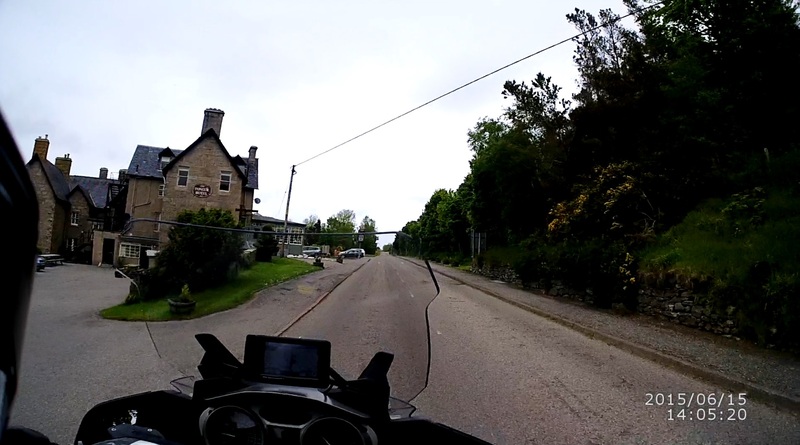 Soon after Strathcarron, A890 split up at a T-intersection, so that A890 continued onto the right, while I turned left onto A896, heading toward the famed Bealach na Ba turn-off. 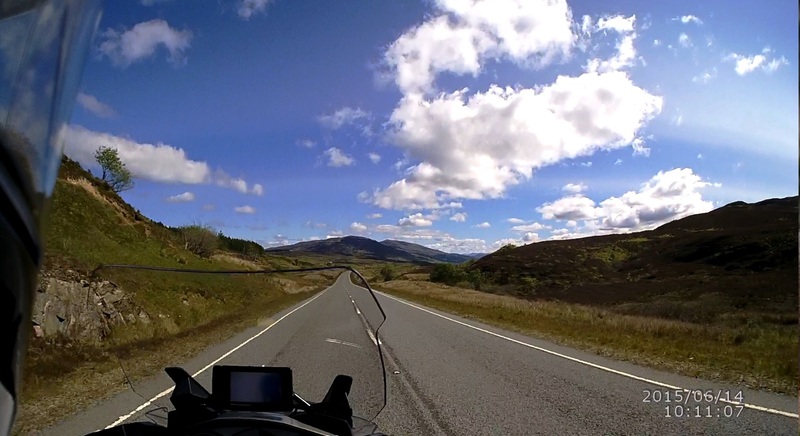 The views on A896, on the way to the turnoff was quite breathtaking. It was not long before I arrived at the turnoff. I had thought that I might stop at that point to take some pictures of the RT by the warning signs at the turnoff, but again I convinced myself to keep riding! I love to be on two-wheels, and found it very hard to get off, once that I was moving. On top of that, I have no real attachment to this rental RT, and a picture of it would hold little meaning, and so it’s ride on and away! Near the top, at the first hair-pin turn right. Steered wide left, chopped down to 2nd gear, leaned hard right and away! 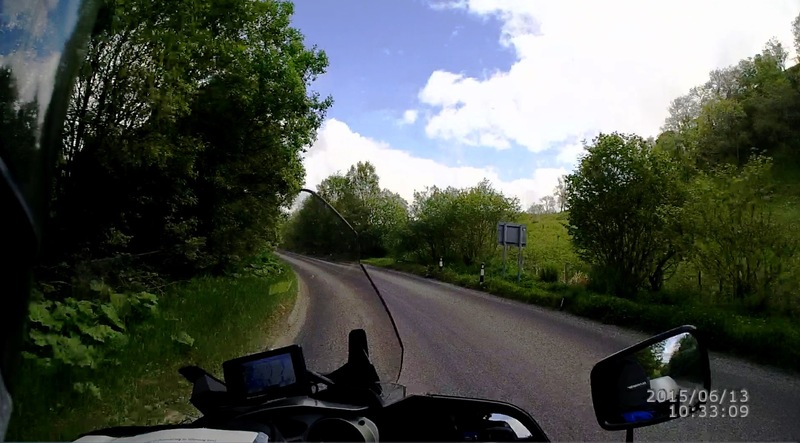 However, this turn had a steep uphill leg, and as I started to bring the RT upright, I chopped into 1st gear, dropped the clutch and wound up for power…..only to hear the engine roar and the RT speed continued to be scrubbed off very rapidly. The transmission was in NEUTRAL! By that point, I had no choice but to slam my left foot down hard on the ground and caught the dead-weight of the RT. The bike had lost all forward momentum, and my right foot went down off the peg to help balancing and hold the RT. 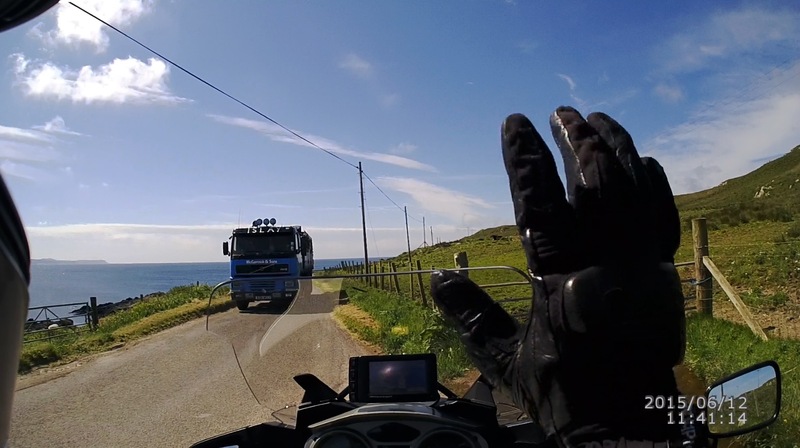 Both hands were gripping the handlebar tight, to try to support the dead-weight, and there were no ways that I would have been able to reach out to either brake or gear levers. The only choice left was to lay the RT down on its left side, or go over the edge with it, as the bike continued to roll backward! The bike was laid down right on the corner, pointing straight up the uphill leg. After hitting the kill switch, I tried to get the RT into gear before raising it up, but was unable to do it because of the way that it was laying on the ground. I was unable to reach over to turn the rear wheel while reaching under with other my arm to push the gear lever with my hand, in order to get the transmission into 1st gear. A small van that I had passed, parked on the side further down, caught up to me and the driver was very kind to help hold the RT from rolling backward while I remounted and took off up the slope. That was a bit embarrassing! Not long after that fateful hair-pin turn, perhaps a mile up the slope, I finally arrived at the top of the pass, where I stopped to take some photographs. Personally, I dislike maneuvering on a steep downhill grade, because the only real control available are the brakes. I literally tip-toed around this last hair-pin turn! After that turn, the road straightened out and the gradient downward was quite mild, making higher speed high gear runs quite enjoyable. On the way down, I caught up to another solo motorcyclist, and followed him down the trail. After a few minutes, I got back on the RT and continued with my journey on this unnamed single-track road. 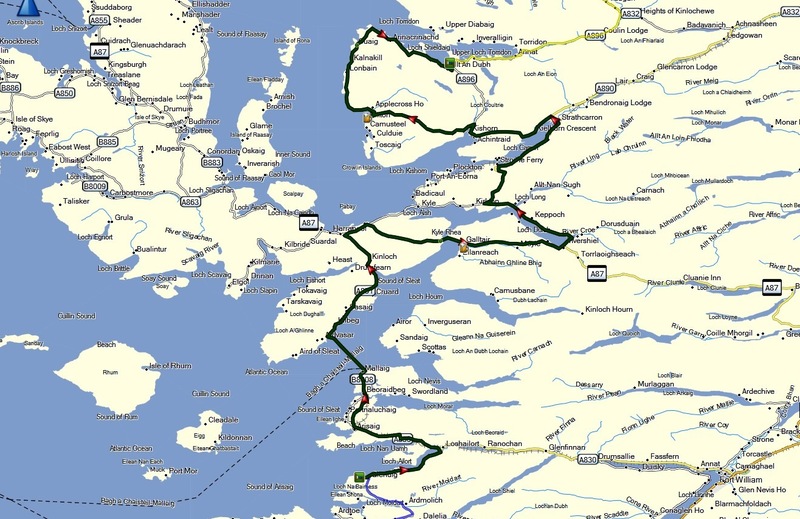 The road wound its way around the coastline north, and then southeast to finish back on A890, the same A890 that I had departed to go onto Bealach na Ba, but further north. 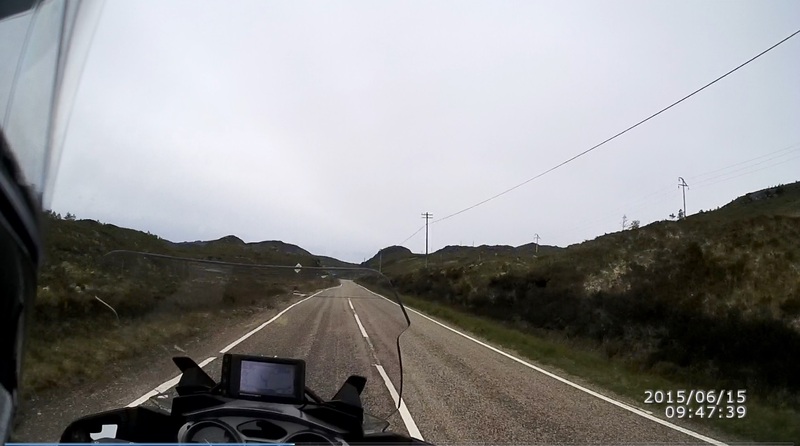 Riding on this unnamed single-track road around the coast was very enjoyable, even though I had to keep the speed down to a very reasonable level, adjusting my speed based on the distance that was visible ahead in order to accommodate oncoming traffic. There were hand-painted signs along this road, as it meandered through farmlands, warning that it was lambing season, and to drive slowly as there were ewes with their newborn lambs scattered throughout the landscape. Near the end of this road, I caught up with three motorcyclists who were obviously very unfamiliar with riding the single-track roads, and they were threading their ways along very cautiously. One of the bike looked like a big “K” bike, but I wasn’t able to tell which model from the rear. That BMW 49 liter top-box was very familiar though. 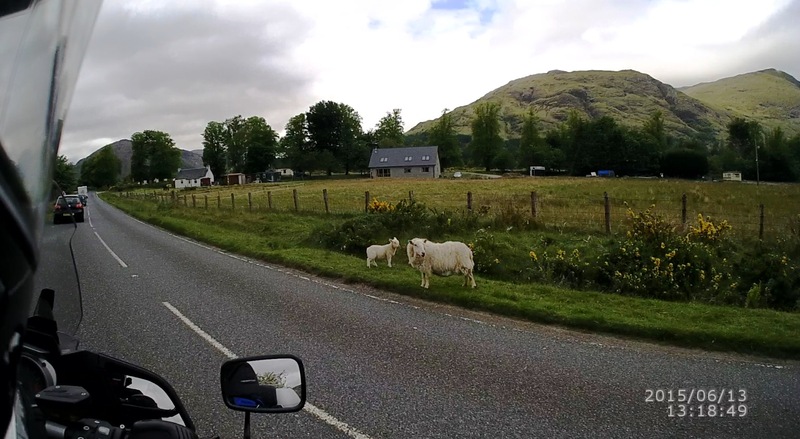 I followed the trio all the way to Shieldaig, where they stopped. 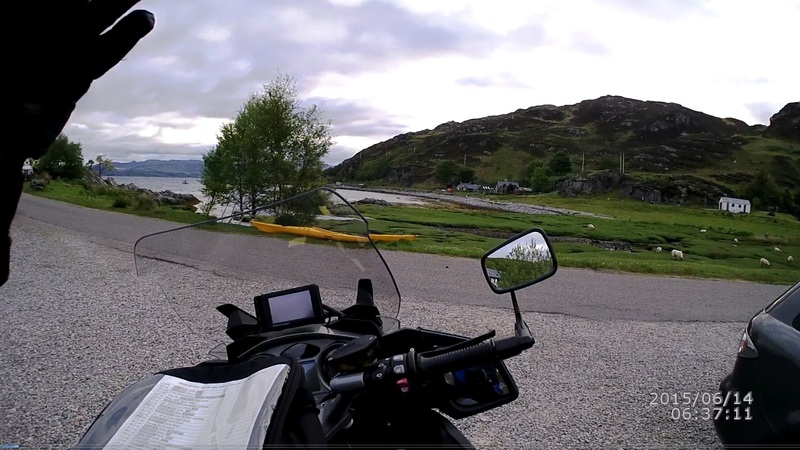 I rode on to my hotel (Tigh An Eilean Hotel), just a few hundred yards further. Thanks for another well written instalment, an enjoyable way to spend a rainy Sunday morning. It's a pleasure to share, Gerhard! Writing these reports is like reliving the fine rides again, in details. That SENA Prism camera that I had on my helmet have paid for itself many times over, IMO! Three more days of riding to write about, sometimes in between riding, but I think that last one (day 4) was my highlight. First, please note that the heading for that last day's ride report should read Day 04 rather than Day 03! Second, if anyone is interested in watching my compilation of Day 01 ride, I have just posted the videos on YouTube. The Day 01 ride was broken into three parts, and still fairly long I'm afraid! I have enjoyed reading the first four installments of your ride report. They will be a helpful part of my trip preparations. 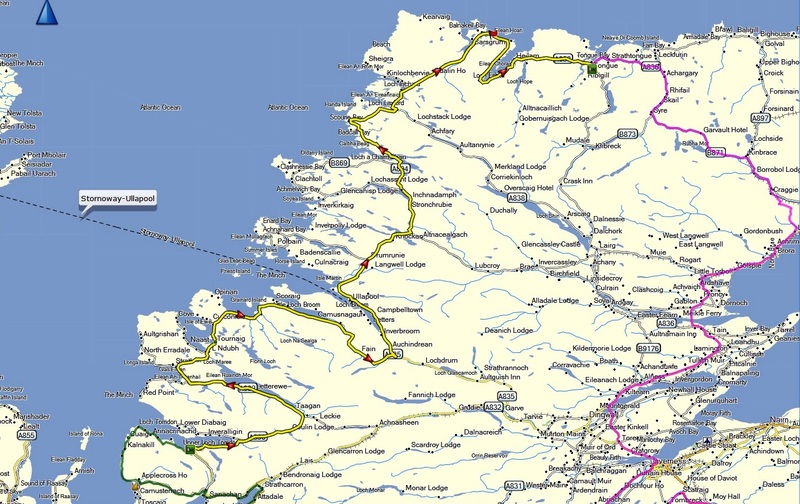 I am planning a slightly longer stay (14 days) and plan to cover most of the UK, starting near London and riding Scotland and Wales as well. I have a question that you may not be able to answer since it appears that all of your hotels were reserved in advance, but do you have any idea if it would be hard to find lodging "on the fly" each night in most of the towns you stayed? My plan was to reserve hotels the first three nights since they are in urban areas (London and then Edinburgh) and the last night in London prior to departure, but to try to find lodging the rest of the evenings with no advance reservations so as to have flexibility as to where and when to stop. Or, as we often do when traveling in the states, stop at lunch at a WiFi equipped restaurant and search for and reserve lodging for that evening. We did this with great success last summer in PEI, Nova Scotia and Newfoundland and rarely called a hotel that didn't have two rooms available. Maybe once we had to call a second choice. However, I am not sure if this is a reliable strategy in Scotland! I really don't want to sleep alongside the road with a motorcycle, but it sure is nice to have the flexibility of no reservations in advance. We made a lot of changes to our plans in Nova Scotia and Newfoundland and sometimes found a really neat B&B once we got to a given area. Any thoughts from your experience as to whether this is a risky strategy or is it viable? And a related question: How prevalent was WiFi in the remote villages you visited? We found WiFi readily available in Switzerland and Italy two years ago, even in the smallest Alpine villages. However, the availability in Newfoundland was a little less reliable, although if you could find a McDonald's or Tim Horton's, you were good to go! Just thought of another question, what did you do for cell phone? Did you get an expensive international plan from your US carrier? Did you get a dedicated phone for use in Scotland? Did you get a SIM card for your US phone? Something else? Any major issues with cell coverage? Matt, I am hoping to do the same thing that you are planning, sometimes in the next few years! New Zealand is my next oversea target. I need to return to my old stompin' ground! As for the hotels, if I make judgements based on the occupancy of the hotels that I was booked into, I would say that you might have a problem getting in without reservations in several of them. Realistically though, if you keep very flexible, and are not too particular as to where you sleep, I think that it can be workable just to go with the flow, and find vacancies as you go along. That is based on the numerous B&B signs that I had noted along my routes! It will be a very good idea to make a list of the potential places along your planned routes so that you will have the information handy to make the calls. 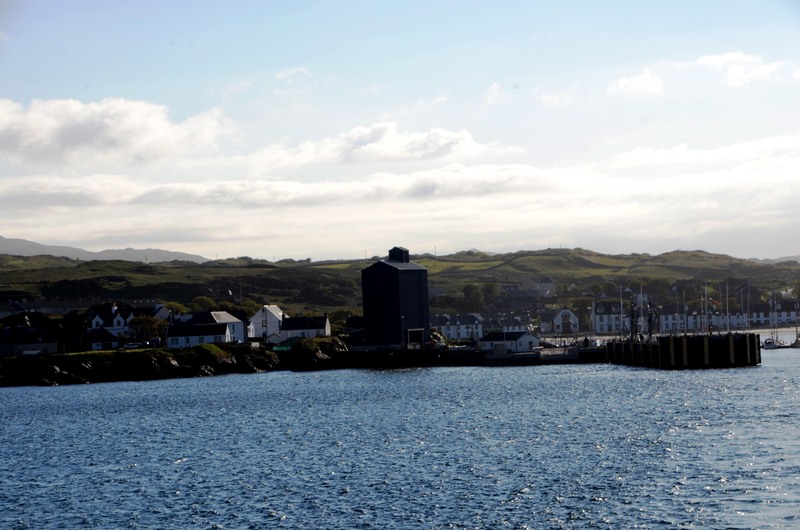 The exception to the above is if you intend on taking the ferry over to Isle of Islay as well! There, the accommodations are limited, and if your visit happen to coincide with a local event, then you will be out of luck for sure! WiFi were always available in the places that I had stayed. I can't tell you about any public WiFi, since it turned out that once I had gotten on the RT, I rarely stop for lunch, and the couple of times that I did, I was more interested in talking to the locals and enjoying the scenery! Chain restaurant that might have WiFi? Don't depend on it if you follow mu routes in Scotland! I do not recall seeing a single fast-food restaurant of any types while riding! OK, I did see a couple of fish & chips places!! Cell phone - I had taken along my Galaxy S4 and my provider is T-Mobile. I didn't have to (nor want to) do anything else because T-Mobile provides international messaging and data services (presumably low data rate) for free, and that works in the UK. My T-Mobile service also provides calling in the UK for 20 cents/minute (if memory serves! ), which is pretty good. I was planning on using the latter just for emergencies. Hope the above helps! If you are interested, I can give you my 7 days route off Basecamp. I assume that you will be getting the UK map from Garmin for your Nav V, for the trip. I am a Verizon user as I get a good discount since my former employer was a big Verizon supplier and they are still giving me the discount as a retiree. Also, Verizon has the best coverage in rural PA where I live. Unfortunately, last time I checked, they did not provide international coverage in their More Everything plan and even short term coverage in Europe was pricey. I think I had a PDF of your trip from several months ago, but having the BaseCamp GPX file would be great. I have a basic outline of my trip in BC already and, yes, I already bought the City Navigator map for Europe. I am always looking for ideas of places to visit and rental places as we have discussed. West Sussex looks good on paper, but I have yet to find anyone with personal experience with them. And they are a young company, only in business for five years. At least their damage deposit is only £1,000 rather than 2,000 so the worst case isn't so bad. The Dalkeith place is the only place I have seen with a 2,000 deposit. I guess that is a warning sign. I put down only 1,000 at Thun Motocenter two years ago and got back the entire deposit. They were very fair to our entire group. I think only two of the 11 lost their entire deposit and those were warranted. One lady dropped her bike at least 6 times and her husband rear-ended her once with his GS1200! Another man had a head-on collision (low speed so no serious injuries) with his RT and messed up a bunch of body work. OK, here are the routes. I had to zip them up because the forum won't accept gpx files. That outfit in Dalkeith was clearly ripping me off. The cylinders heads had guards on them, and they claimed that BOTH valve covers were damaged (cracked). The right mirror got scuffed from the drop, but it wasn't hard enough to dislodge the mirror, and yet they claim that the instrument cluster holder was bent because of it! That last one had something like 6 or 8 hours of labor tied to it! You read the details in my report, and I know that it was a rip-off because they looked for all sorts of reasons to rack up the supposed damages to above the £2,000 line to fleece that extra £2,000. Keep in mind that they are the one that will provide the parts and do the repairs, and of course their option NOT to do he repairs, especially when there was nothing wrong in the first place. As a renter from out of the country, you are at their mercy! Yes, it is tough being a foreigner in situations like that. I think I would have told them I would pay for the parts as they handed each replaced part to me. Otherwise, I would dispute the charges with my Visa issuer. I have had good success in the past disputing charges like that with Capital One. At the very least, it gives the vendor a headache and puts them on notice in regard to fleecing people. That is why I have been trying to find a forum member with first hand experience with West Sussex. I was very fortunate that my first experience was nearly the opposite of yours. I would rent from Thun Motocenter again in a heart beat. I did take pictures of the bike during the delivery inspection and was fortunate not to drop the GTL, but they were professional in all aspects of the rental. Even gave us a nice t-shirt at the end. The only close call was in Italy where a car ran me off the pavement. Fortunately, it was only a 3" drop to the dirt berm so nothing under the bike touched down as I left the road. And I learned to ride on dirt bikes, so riding in dirt isn't scary. I just stayed on the berm until I scrubbed off some speed and found a relatively low spot to ride back up onto the asphalt. No harm, no foul. 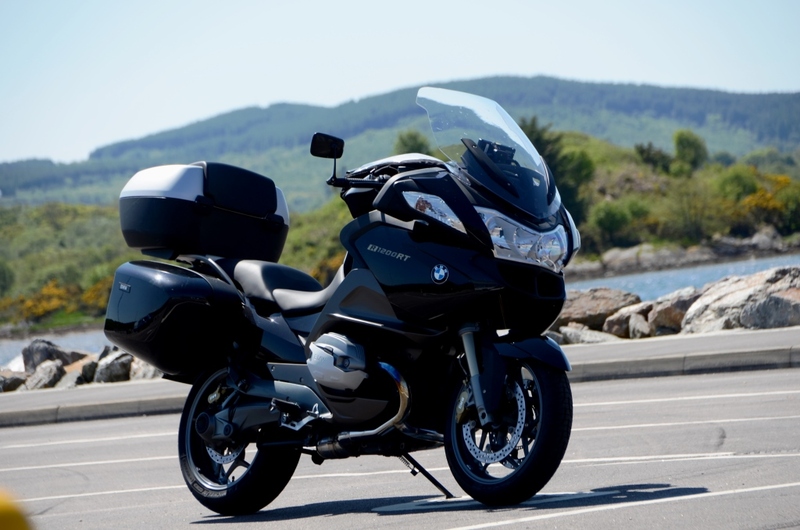 And one nice thing about riding an LT is that every other BMW, even the GTL, feels like a featherweight in comparison. I am not sure if my iMac can unzip files as I don't recall ever trying. If I can't handle the zip file, I will PM my email address to you. Thanks again for sharing your experience and gpx file. I read what you have written thus far and watched the first of your videos. I think I remember reading what helmet camera you used, but need to go back and see if I can find it. I am debating whether to get one. My wife rides with me and took 1100 pictures in 12 days in the alps as well as several videos I posted on YouTube. She does a good job with our trusty Canon G11 so I likely won't invest in a helmet cam just yet. Hard to beat the quality and low light performance of the G11, although he latest helmet cameras are quite impressive. At the time, I had raised as much objections as I could, but quite frankly, it was clear to me that there were no ways that I could have done what you might have done, because I believe that they would simply refuse using various excuses. In any case, I was so disgusted with the whole place that I just wanted to get out of there. Same thing with the disputing the charge. I did consider that briefly afterward, but figure that it would be a waste of my time, and I was done with that outfit! Chalk it up to experience.....an expensive one, and that is why it was so important to share that experience here! 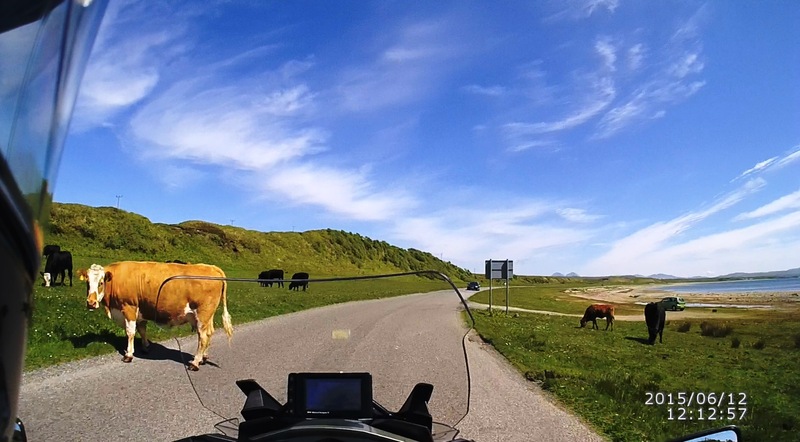 I would like to ride in Europe as well, especially to go over the passes in the Alps. I don't know when I might be able to fit that in though! It would be really nice to ship my bike over, to the UK, say, and combine all trips into one! I don't think that air-freight cost is high (I have looked), but living expenses over there and in Europe is pretty high! EDIT: Note, the forum software didn't recognize the above link properly! I think that it got fooled by the  in the link!! Last edited by PadG; Oct 3rd, 2015 at 8:28 am. 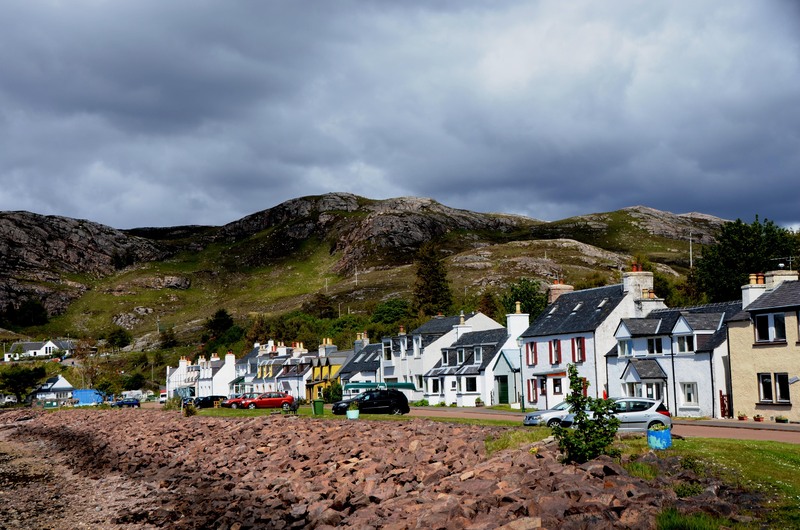 Day 05, Monday June 15 – Shieldaig to Tongue. This day promised to be the longest riding day of the trip! I woke up early, as usual, and had everything packed and ready to go by the time that the dining room was opened for breakfast. I had a nice leisurely breakfast (full Scottish breakfast: fried egg, fried black pudding, fried mushrooms, fried sausages, fried scone, fried tomatoes, baked beans, and of course tea), and was on my way just before 9 am. The morning was very hazy, and the thick haze prevented direct sunlight to pass through, and the air was fairly still with no winds. 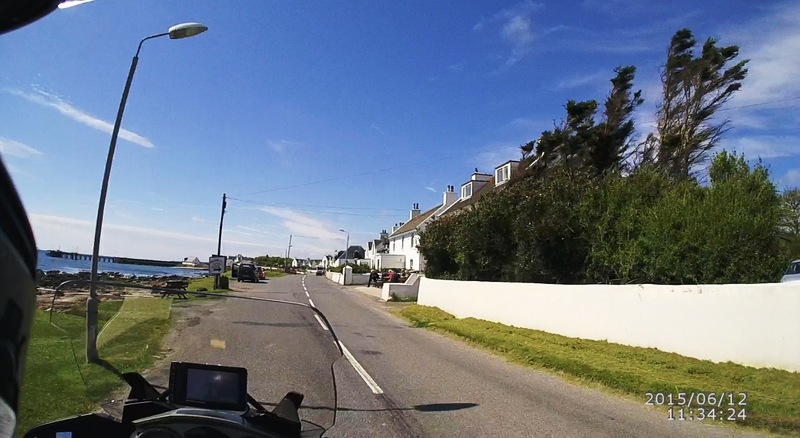 Rode through the village, along the shore, and then jogged up to join A896 heading east along the coast. 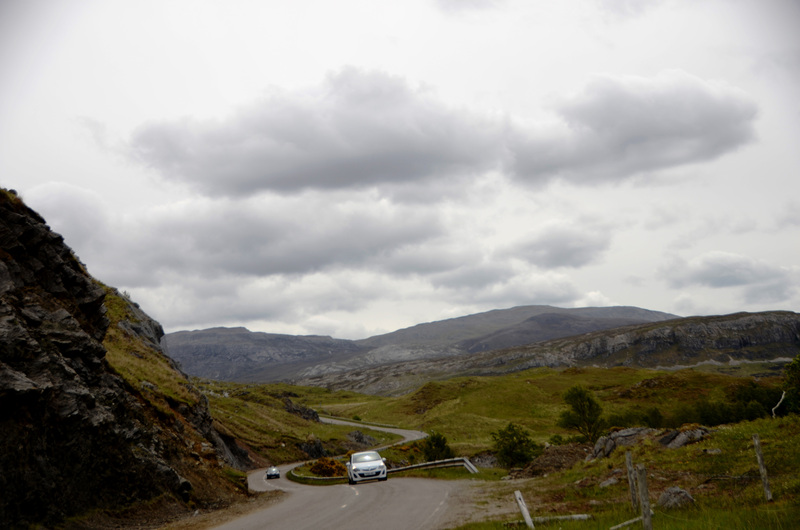 A896, from Shieldaig, was a narrow two-lanes road for many miles past Shieldiag, but it eventually narrowed down further and turned into a single-track road. By now, I really enjoyed riding on the narrow single-track roads! The road snaked its way up a valley in a gentle winding incline. There were some oncoming traffic on the road, including commercial trucks, but the traffic was quite light. It was easy to see far enough ahead so that, much of the times, I could reach a passing-place at the same time as the oncoming vehicle, and neither one of us would have to slow down very much. The hills on both sides of the valley were quite bleak, with much steep bare rocky faces. 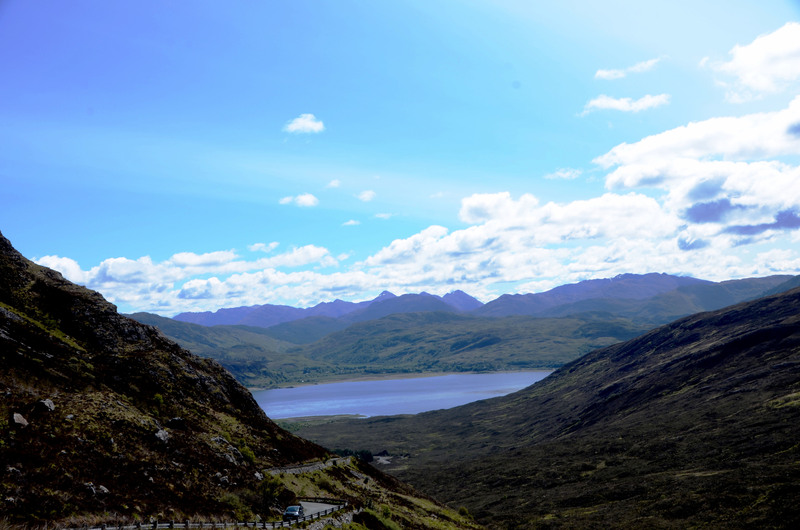 This IS the Scottish Highlands! Note that there were still a lot of snow up on the hillside! Also note the car parked to the side. I believe that the owner had set up a camp behind the ruined stone cottage to the left, in the above picture. 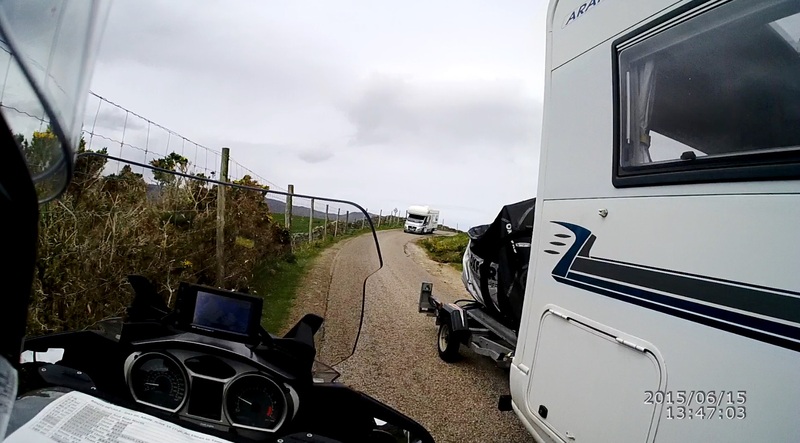 I was able to see a tent that was pitched behind the cottage, as I was riding past. It must be really nice to be able to travel and pitch a tent for the night almost anywhere! 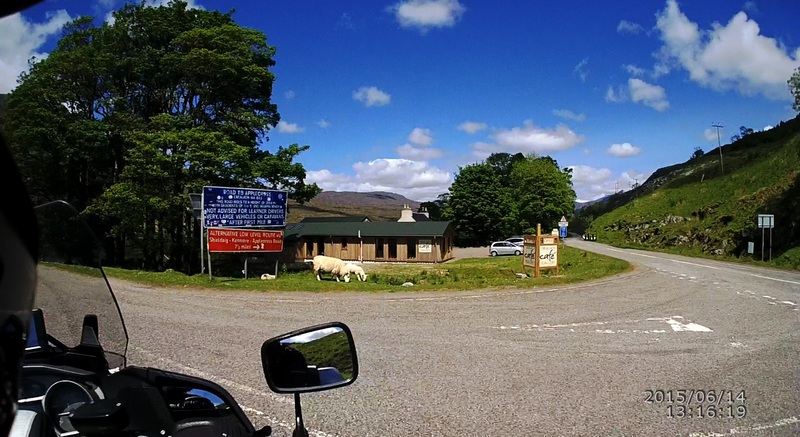 A896 ended at the village of Kinlochewe, where I turned right (northwest) onto A832. Right after that junction, I saw a fueling station, and used the opportunity to fill up the RT’s tank. Of course, the selection was simply diesel or unleaded. No Premium unleaded! 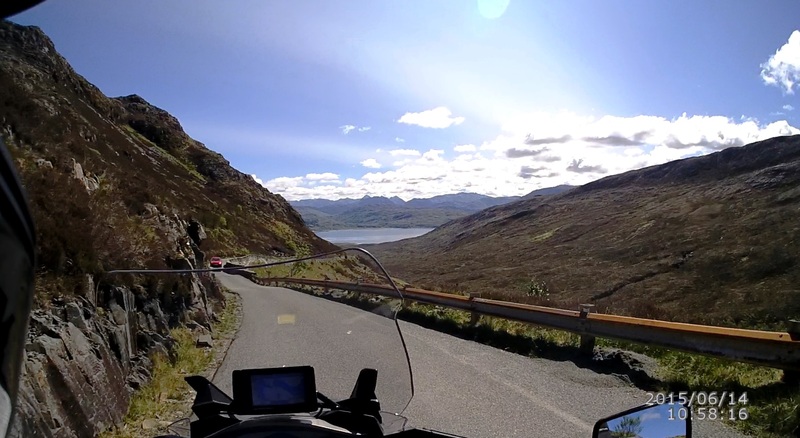 I continued on A 832, as it wound its way, in fast sweeping curves, along the shore of Loch Maree. The road at this point was a nice and relatively wide two-lanes road, with nice surfaces in most areas. Clearly, it was a main thoroughfare for this area, with many vacationers traveling its length. The traffic was very light, with no vehicles behind me, and occasional clusters of camper and cars traveling in the opposite direction. I rode at a leisurely pace, at the speed limit (60 mph), or thereabout, enjoying the morning and the passing sceneries. I encountered more oncoming traffic on this road than any of the ones that I had been on so far, but that was not a big deal at all. Several miles down this road, and I started to feel some rain drops falling! The weather forecast had called for some rain along the way, and I could only hope that it didn’t get too heavy. The RT have such good weather protection that I still hadn’t bothered to put the waterproof liner inside of my mesh riding pants, but if I needed to, I could do so easily. 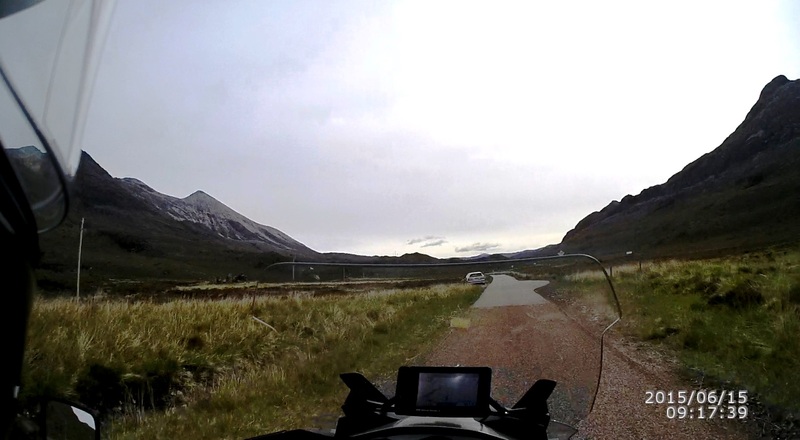 A832 turned into narrow two-lanes in areas, but reverted back into the single-track road again fairly quickly. 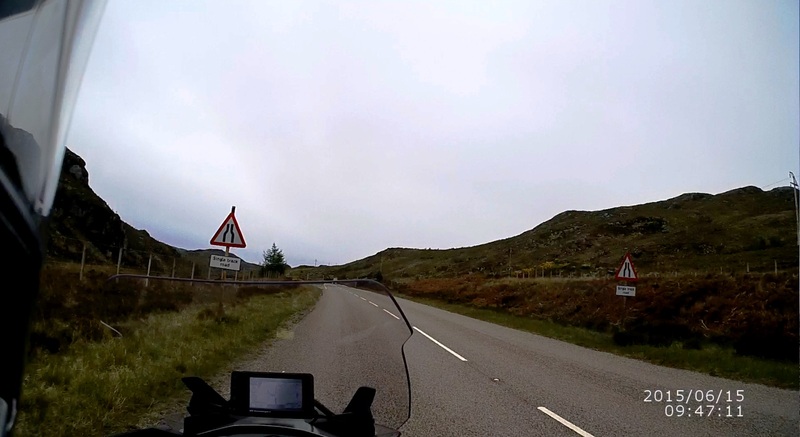 Soon, I was riding through the very pleasant little town of Gairloch, and then A832 started to angle east into the hills. The road, from this point on, became the fairly wide two-lanes road that I had first encountered, and it wound up into the hills with almost constant fun-to-ride curves! 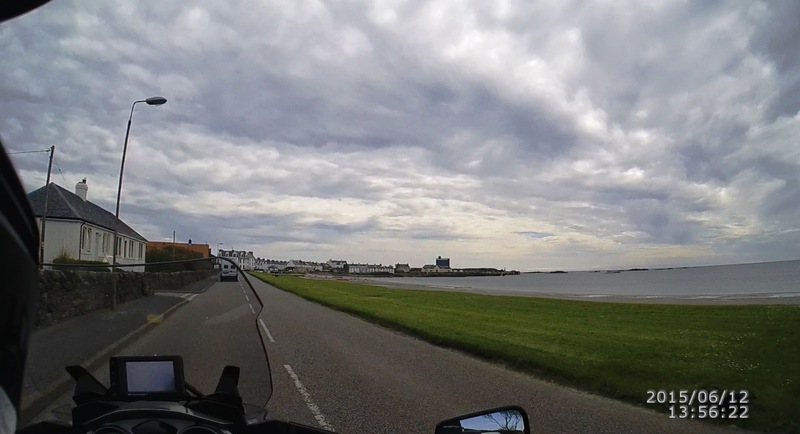 From Laide, A832 hugs the coastline for a distance, to turn inland a little at Mungasdale. Riding along the coast did not mean a boring ride either! 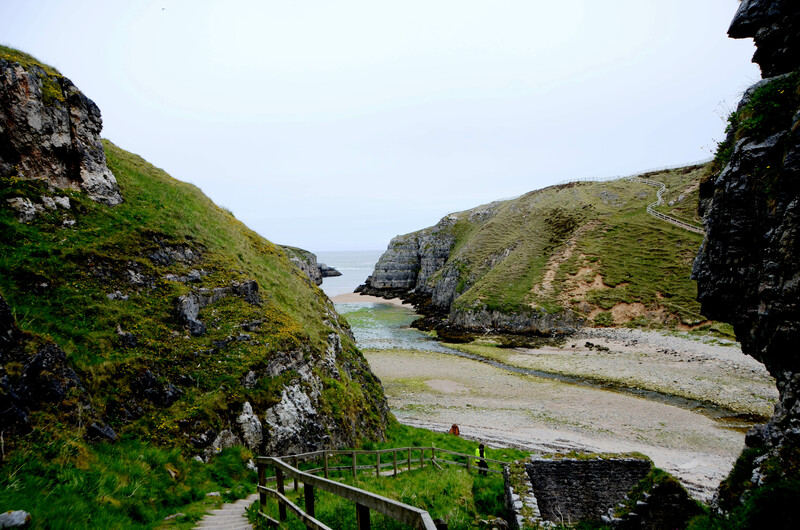 The road varied in elevation a great deal as it wound its way to follow the coastline. There were lots of nice curves, and all along I did my best to stay somewhat close to the 60 mph speed limit! 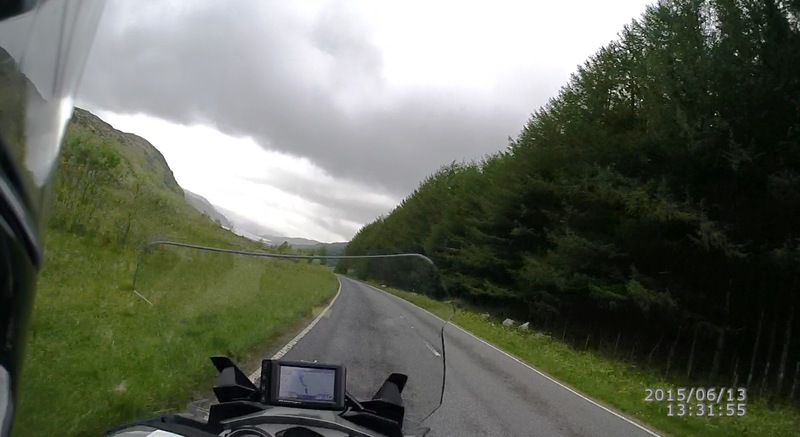 This section of A832, through the hills, had a lot of fast sweeping curves, offering plenty of temptations to really speed up and flow through. I did manage to hold my speed down to some reasonable level. Apparently, this road was attractive to spirited car drivers as well. 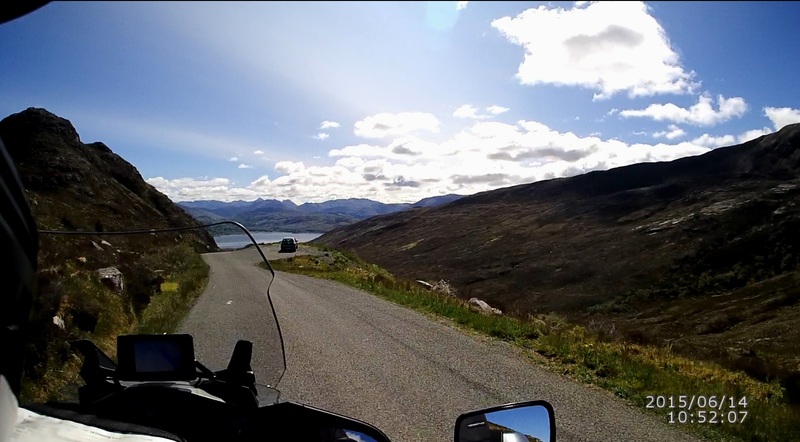 A little black car had passed me while I was enjoying the views while riding along the coast of Little Loch Broom, and I caught up to that same car as I sped along these curves in the hills, and followed him at something like 75 mph as we flowed through the sweepers. That was about the right pace for the road! The road ended around Corrieshalloch Gorge National Nature Reserve, at A835. 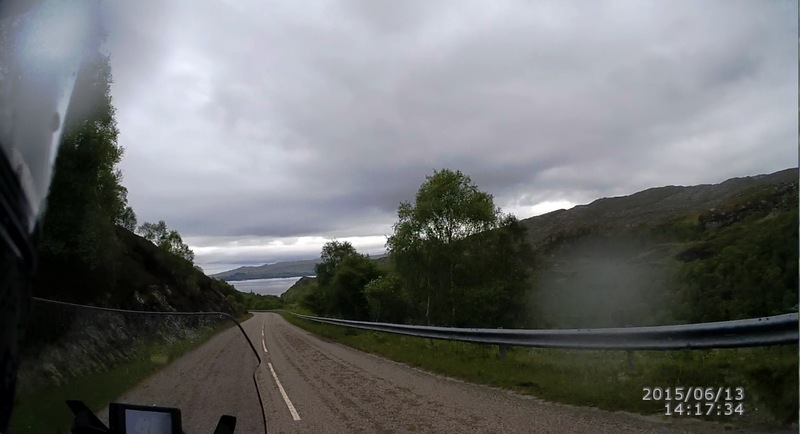 I turned left, and took A835 northward toward Loch Broom, while that little black car turned right and followed A835 southward. 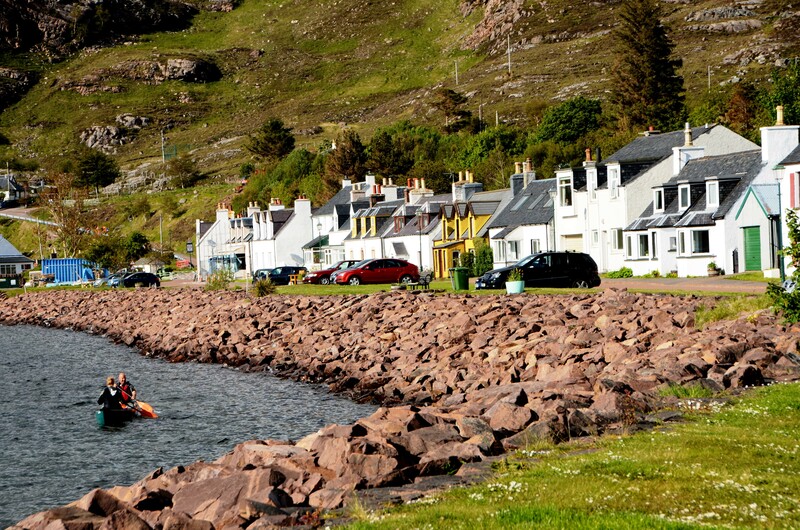 At Ullapool, A835 cut a little further inland, but still ran along the coast. 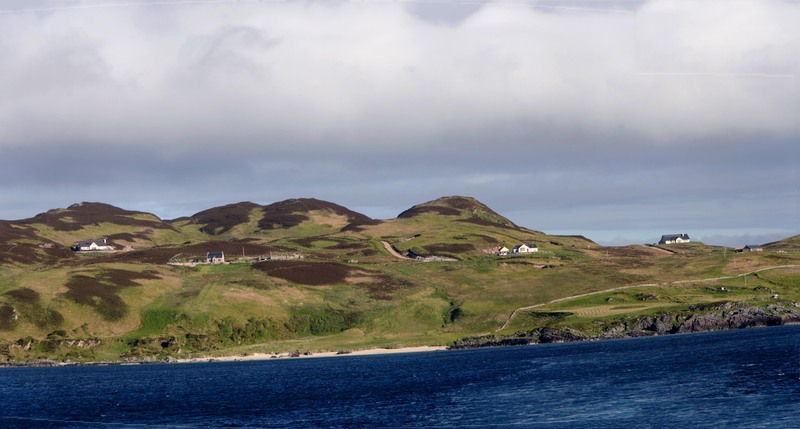 Shortly after the little village of Ardmair, A835 cut deeply inland northward. 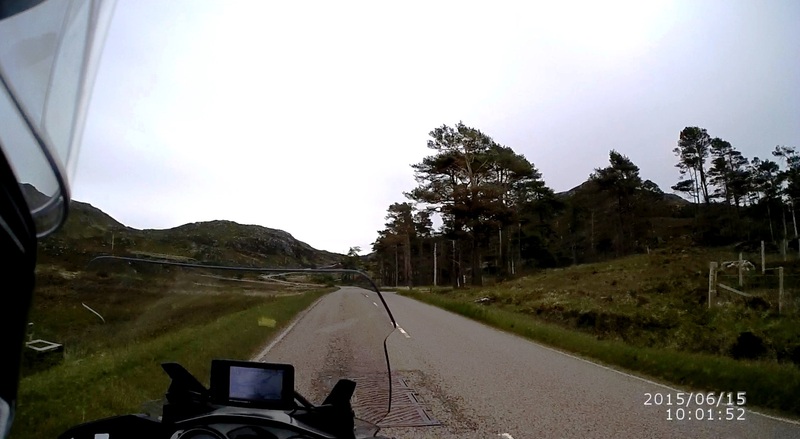 This section of A835 was fairly straight, with few fast sweeping curves as the road wound its way into the hills. Fortunately, as the road gained elevations, the curves were more frequent and had tighter radius, but not enough for me to have to shift down from 5th gear. It was a nice fast ride (staying close to the 60 mph speed limit, to a degree) all through, in order to enjoy the scenery. A835 ended onto A837 near Ledmore, and I turned left to take A837 northward. 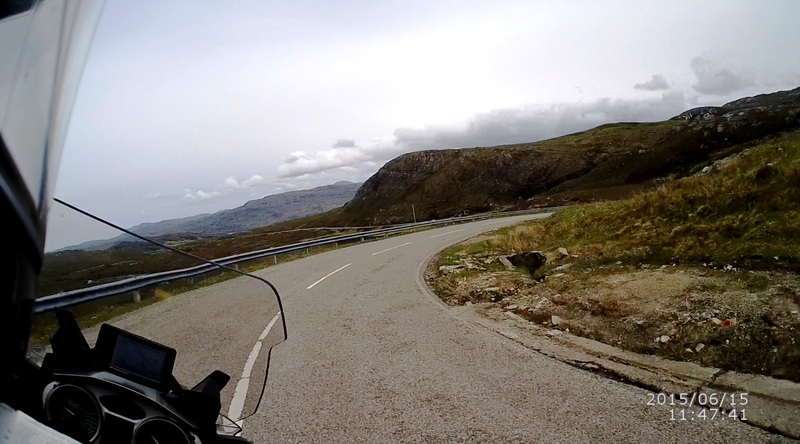 More fast sweeping two-lanes road as I rode deeper into the Scottish Highlands. 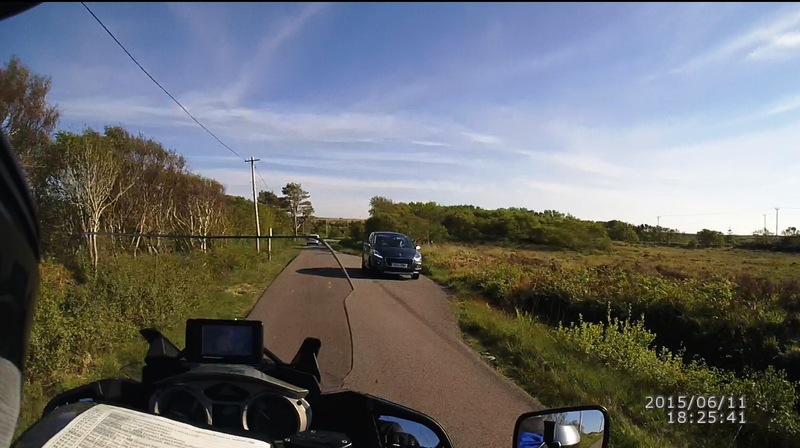 As I was passing through Scourie around noon, I was considering stopping to find a place to have lunch, but I was not hungry and decided to keep riding. It might have been different if the sun was out, but the cool temperature along with the slight overcast sky helped to incite me to ride on! A894 simply changed into A838 at Laxford Bridge, and I continued on northward. I looked back in my mirror, and saw that I had another motorcycle following behind me. There were a fair number of cars and campers intermittently approaching from the opposite direction, as I rode on this road. 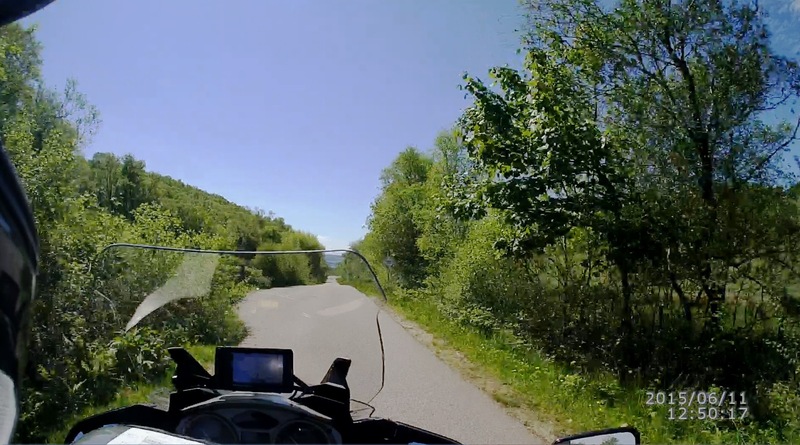 I was very familiar with riding the single-track road, by this time, and managed my speed just right so that I would be passing the oncoming traffic right at a passing-place without either of us having to stop completely. The other bike had kept a little distance behind me, but soon I had lost it completely and was riding alone again. 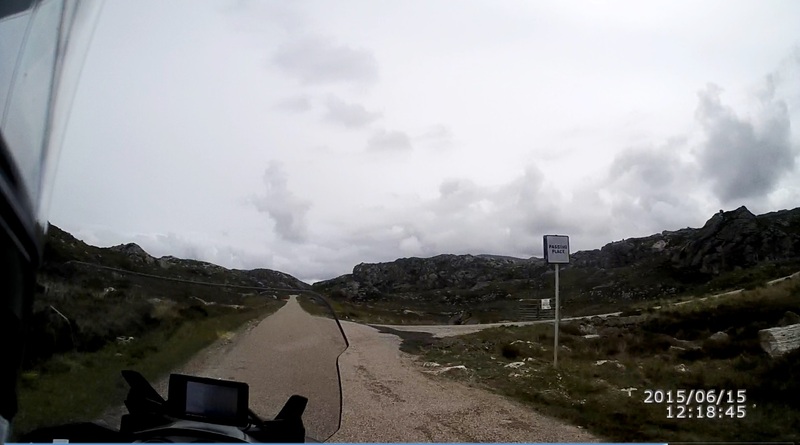 I made a mental note to myself that Durness would be the perfect spot for a break, the next time that I ride these roads again! 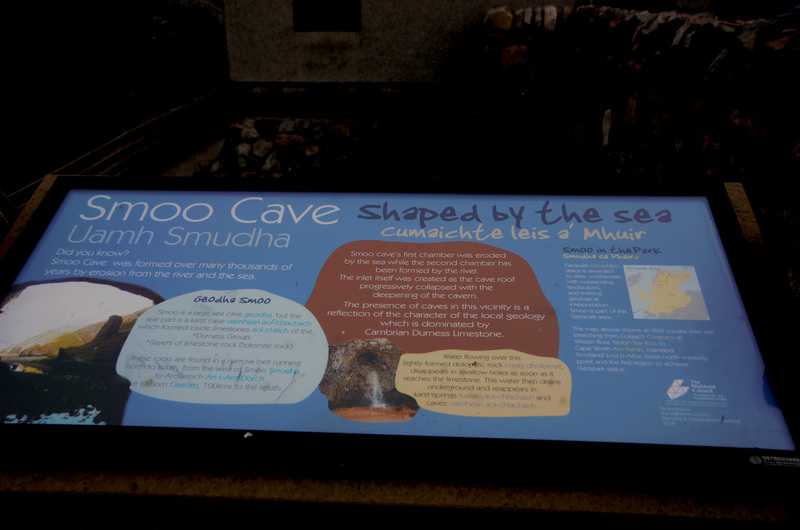 Just a couple of miles after rejoining A838, I pulled in to park at my planned stop – Smoo Cave. Tongue, my final destination for the day, was not too far away, and so I had plenty of time to explore around the cave, as long as the weather held out. There were nice walking path around the cave area, and if the weather was nicer, I might have been enticed to linger longer. 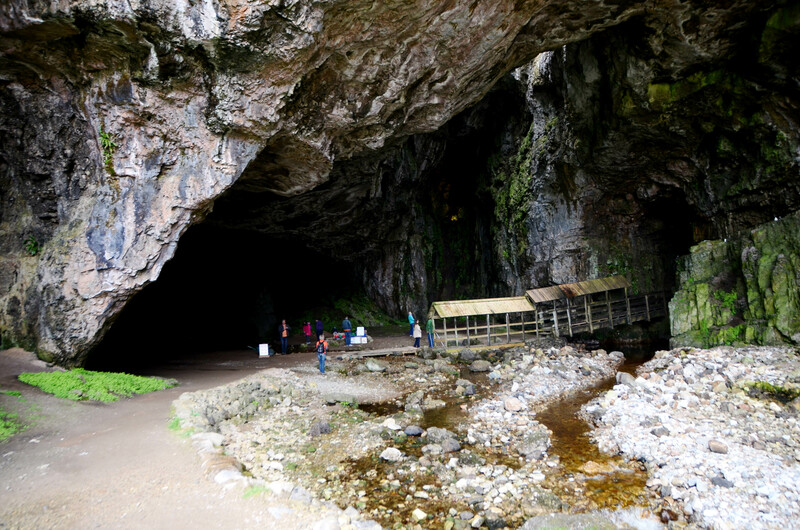 As it was, I stayed long enough to see the cave from the outside and took pictures of the landscape and some colorful wild flowers in the area. 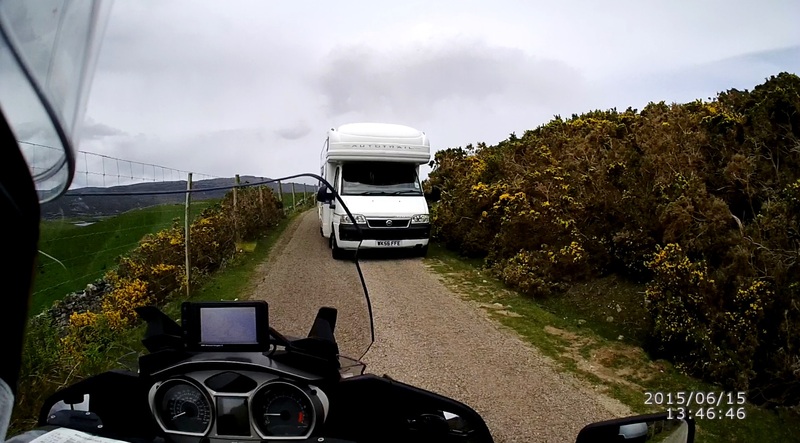 This was where my low-speed riding skills were put to the test, as I eased my way pass that camper, but only to find the second one behind it! This one might have been my fault! 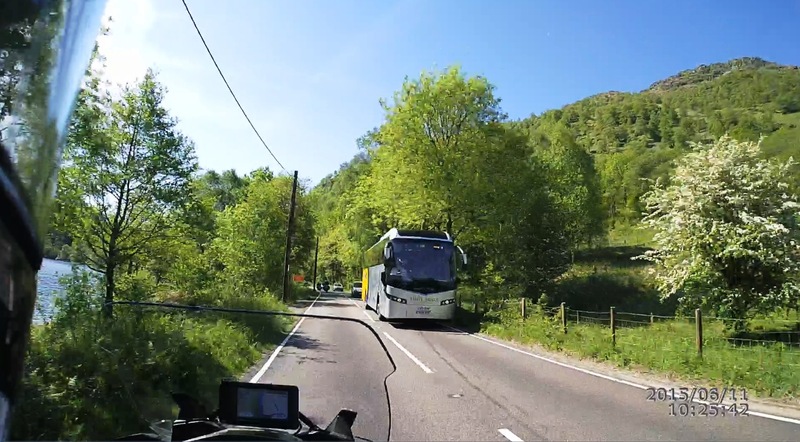 In looking over my video, I think that I was distracted by the sceneries to my left and had just ridden by a passing-place before seeing that Mercedes camper! In any event, the camper’s driver was kind enough to back up a few feet until there was room to the side for me to squeeze by! Phew!!!! 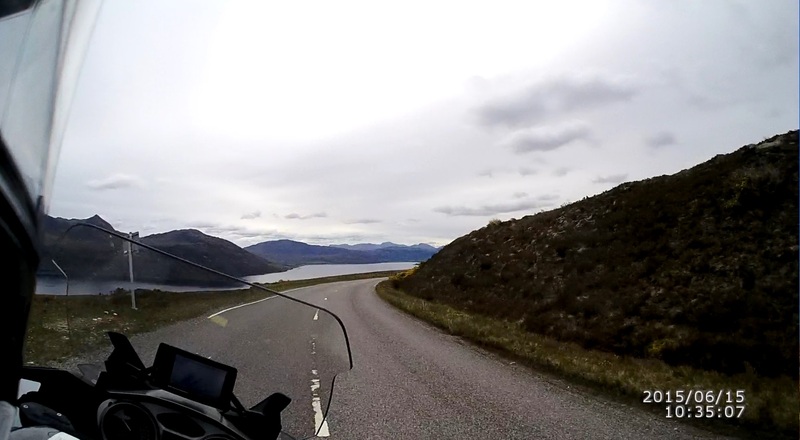 Just a mile or so further, A838 opened up into two-lanes as it headed eastward, away from Loch Eriboll and into the hills. Some fast sweeping curves, and that was when I discovered that I had lost my USB power converter that was plugged into the front left auxiliary socket! 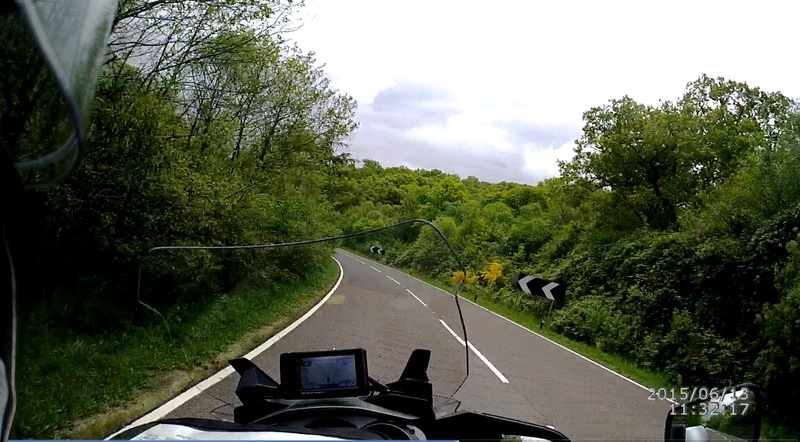 The helmetcam’s power cable was flapping in the breeze, as I sped along these curves, and no sign of the USB converter! I must have knocked that thing off the auxiliary socket with my left knee during one of those camper encounter! From this point on, I would be able to record just 2 hours of video a day, until the battery can be recharged at my destination hotel! Darn it! [FONT=&quot]I was so engrossed with absorbing the view and looking at the restaurant (right), that I didn’t even see this guy who had come up fast behind me! No, that was not a legal pass, and this was only the second time that I had witness a motorcyclist behaving in this reckless manner! Hi Pad. Loving the write up. 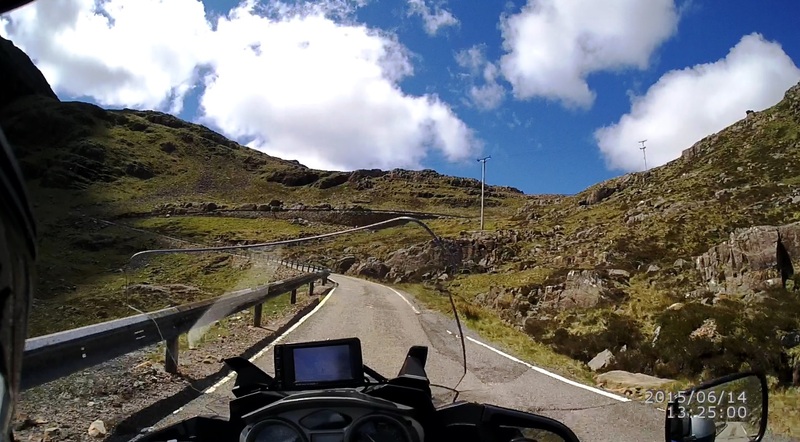 I ride these roads often (and Wales has great riding roads too. 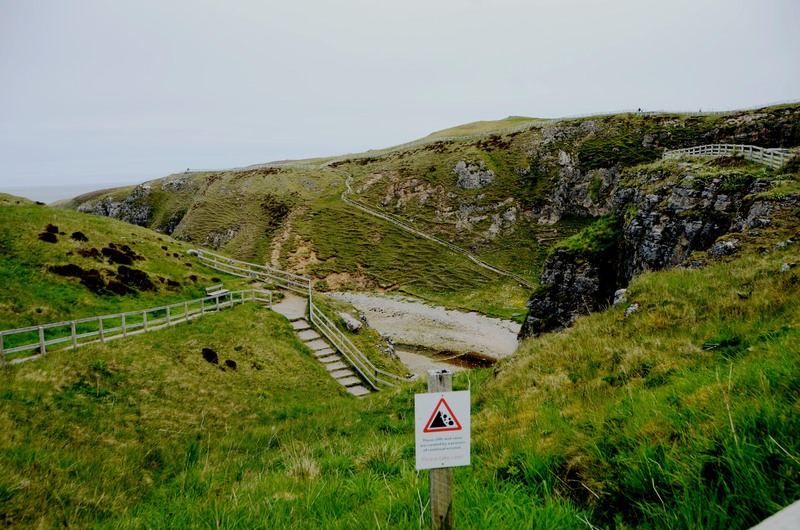 A useful document to read prior to travelling in the UK is the Highway code. The first part of it is full of 'stuff like horse riding and other info that really ought to be at the back of the book because the priority stuff is a good few pages in. However political correctness seems to have clouded the wonderful clarity that this book used to have. So, from the picture, you say this guy that passed you was doing an illegal manouver. Not so. IF IT WERE SAFE TO DO SO, you can use that cross hatched area so long as you don't straddle the unbroken white line. However, if he had been coming the other way, you will notice the unbroken white lines - if he were in the cross hatched section, then that would have been illegal. I hope this helps all travelers in the UK. see the road is clear and wish to overtake or turn off. that you need to get back onto your side of the road. are travelling at 10 mph (16 km/h) or less. traffic lanes or to protect traffic turning right. unless it is necessary and you can see that it is safe to do so. NOT enter it except in an emergency. Last edited by bandytales; Nov 2nd, 2015 at 6:27 am. Thanks for the clarification, Andy! I did go through the UK traffic code, but heck remembering all the details is totally another matter!!! BTW, if you had looked at my YouTube video of that particular ride, you will see that I had realized that this guy was no other than the one that I had followed for several miles. I take back the "reckless" comment, especially now that I know about passing on the hatched area! Generally, I had been riding as if I was a guest in your home, and indeed I was! Meaning that I tried to stay very close to the speed limit, and be more cautious about my riding style. When I was following this fellow, I just went along at his pace, with him leading, and it was quite fun. He turned off onto a side road, and I was sorry that I didn't have him to lead anymore. Only later (much later, here at home) did I figured out that he went on a nice single-track road, just for a riding detour, and then caught up to me again! I want to get back there again, and this next time, I am going to make that detour also! Only later (much later, here at home) did I figured out that he went on a nice single-track road, just for a riding detour, and then caught up to me again! 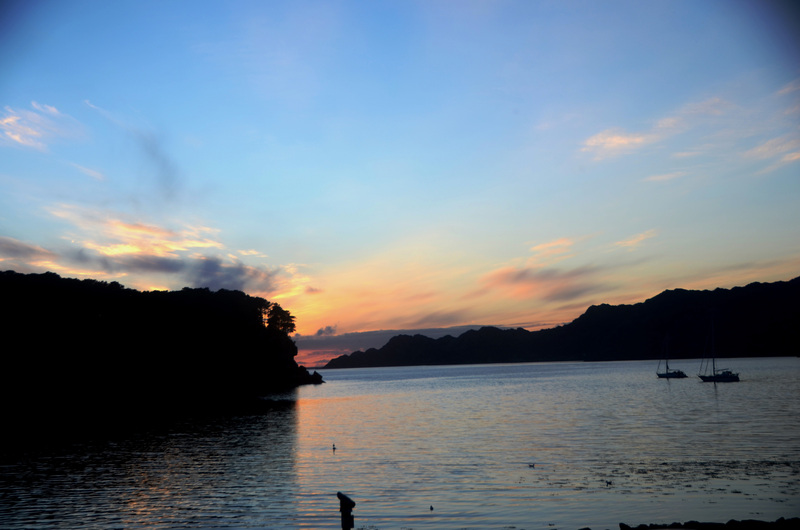 I want to get back there again, and this next time, I am going to make that detour also! Pad, if you come over again, to do Scotland again, let me know. I'd love to hook up with someone who wants to use the tiny lanes. I try to hunt them out all the time. Unfortunately the roads are being 'improved' all the time. This means they are getting more 'sterile'. They are getting wider, straighter, and more level - I guess to encourage tourism and coaches. Sadly this is starting to make special places like the highland become more like every other place. The east coast used to be a magnificent road - like you often find on the west coast. Not any more. All straightened with just the odd glimpse of the old roads. You made a passing comment that you may like average speed camera's - I hate them. More and more roads are becoming infested with this disease. Also 'Smart road management', which means mile after mile of overhead gantries with inane signs warning us to buckle up, slow down, time to a meaningless exit, current speed limit, the list of distracting info is limitless. Some of these roads used to be quite beautiful but now the journey becomes more and more stressful as the countryside is replaced with road furniture. So don't leave it too long before you do it again. Andy, I sure will let you know when I do get that way again! The next time will be to ride the UK as well as going back to Scotland. I love to ride the small roads!!! That is what I look for, when I go out and explore here, but our small roads are nothing like the single-track roads in Scotland! 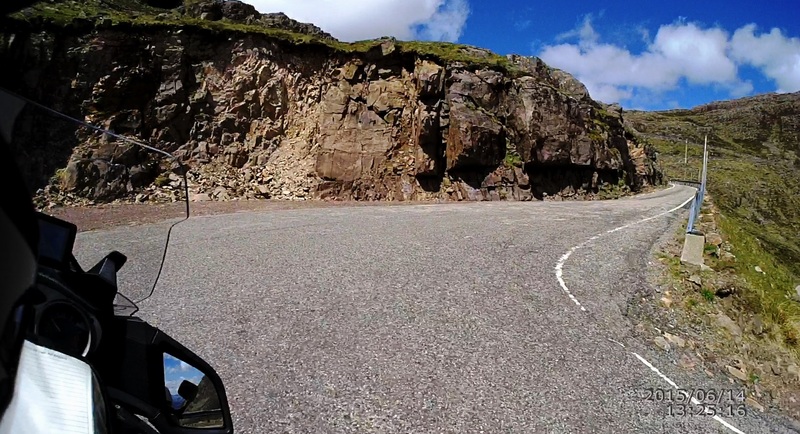 IMHO, it takes more motorcycling skills to ride those road. I had heard about the roads on the east coast! 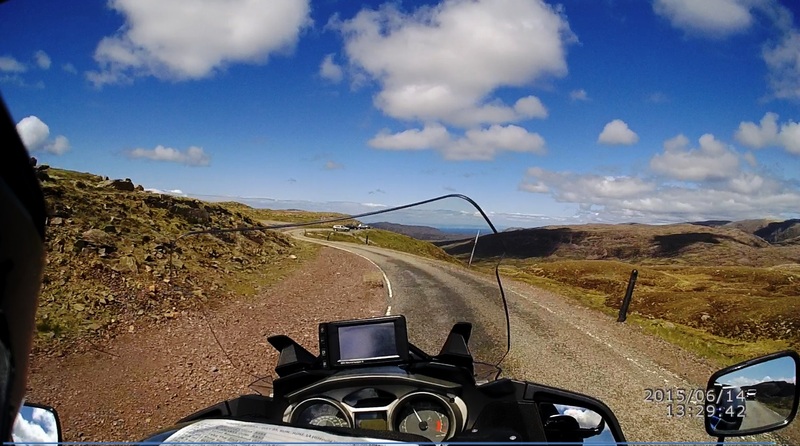 Initially, I was going to change my Day 6 route to go to John O' Groats, and skipped the route around Loch Ness, but I was discouraged from doing that with the statement that "the ride to John O' Groat is famous for being the most boring ride for motorcyclist"! 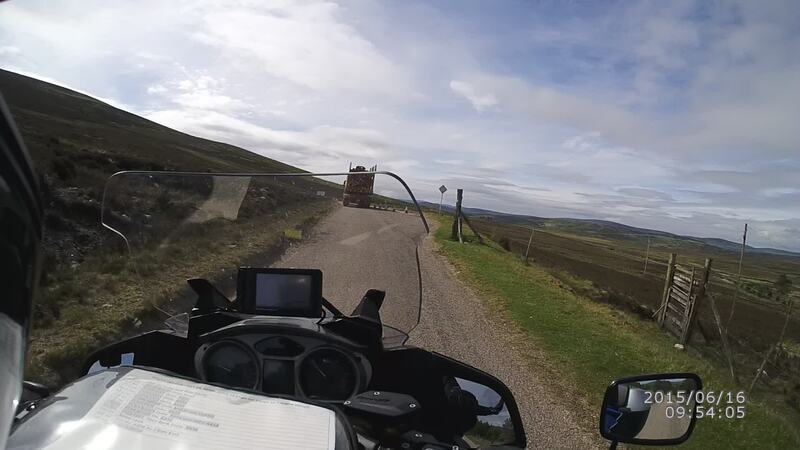 Then (when I gets to doing my Day 6 report), the ride around Loch Ness had turned into something of a mini-adventure for me! As for the "average speed" camera, I did encounter them as well as the regular camera on Day 7. In theory, I still think that the "average speed" ones are better, because the regular ones are "gotcha" device! In any case, realistically, I will be avoiding the types of roads that utilizes both types as much as possible. I don't care for riding on motorways or 4-lanes thoroughfares, even with the higher speed limit! I can ride fast, and on excellent roads here, if that was my desires!! Unfortunately, it might be a few years before I do get back to the UK. My plan for the next year is to do more of the US, and then possibly back to New Zealand for the following year, and then we shall see! 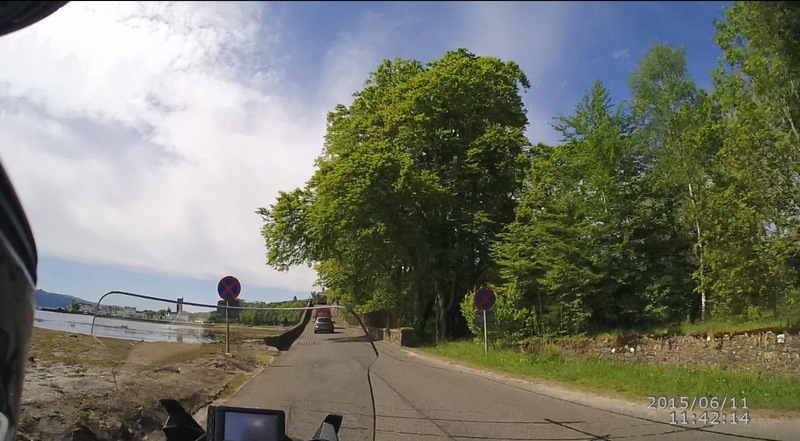 BTW, after I had realized that the other rider (that we talked about in the other post) had made a detour, I checked the road that he had taken, using Google Map. It was a simply beautiful winding single-track road! If I had known about it, I would have followed him in a flash! Next time!!!! 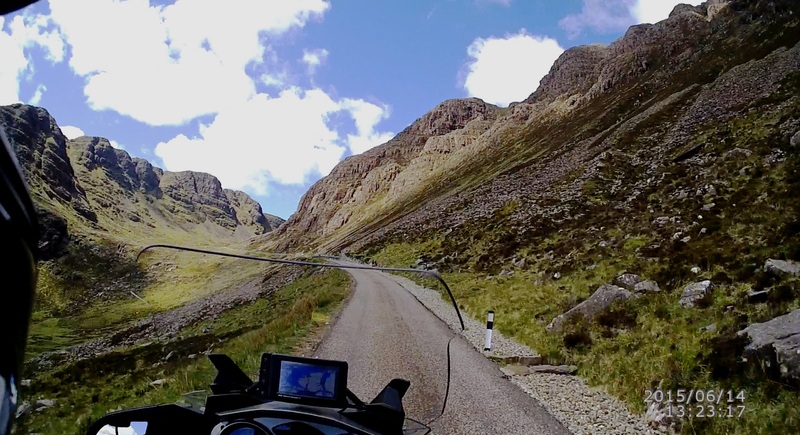 I had published another video segment of my Scotland motorcycle ride on YouTube. It is the first part of Day 3, which was a very long day for me - getting up at 4 am and then riding north to catch the 7 am ferry at Port Askaig, only to find out on my arrival that CalMac had rescheduled that ferry to leave from Port Ellen instead (Port Ellen's ferry terminal was just 200 yards from the hotel where I was staying!) 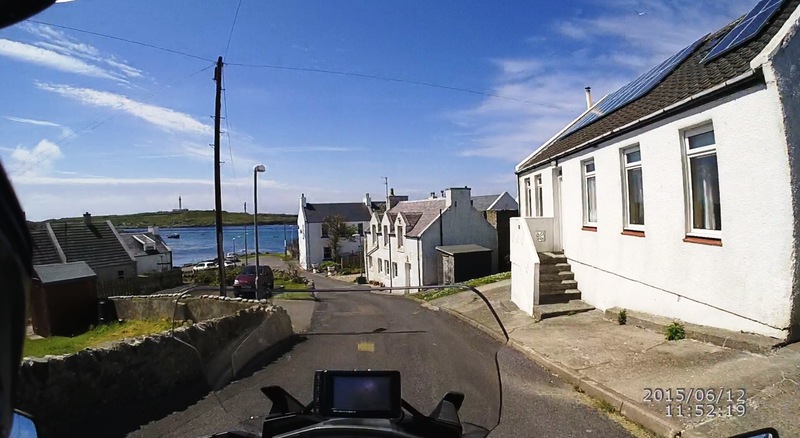 So, rode back to Port Ellen, but I did have plenty of time since I had always leave lots of time for things that I planned to do!